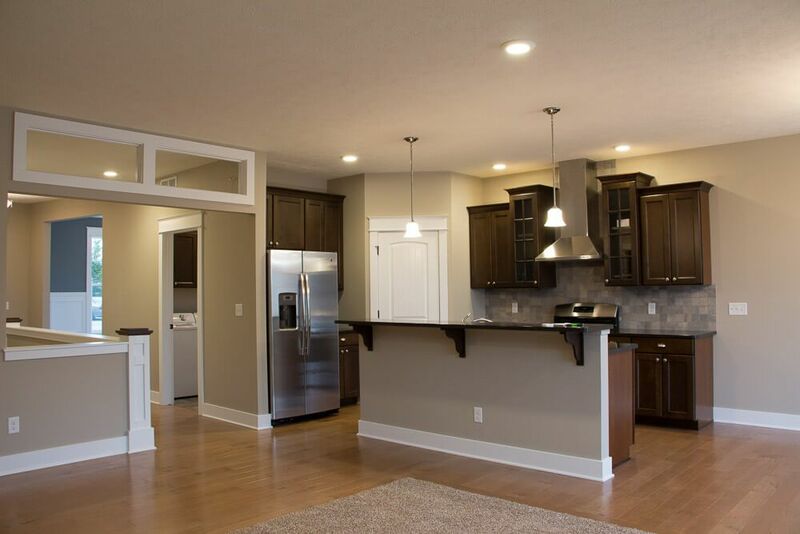 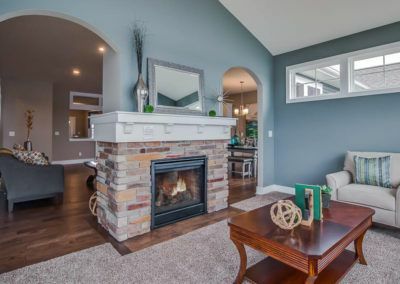 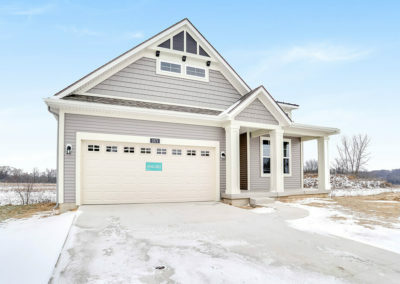 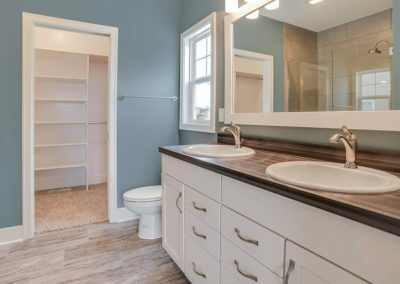 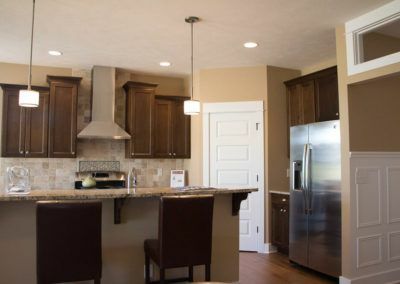 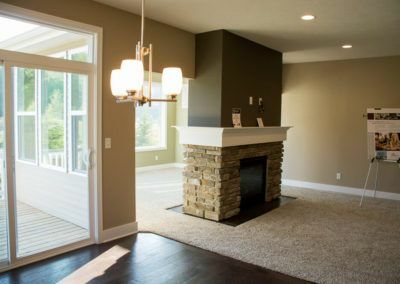 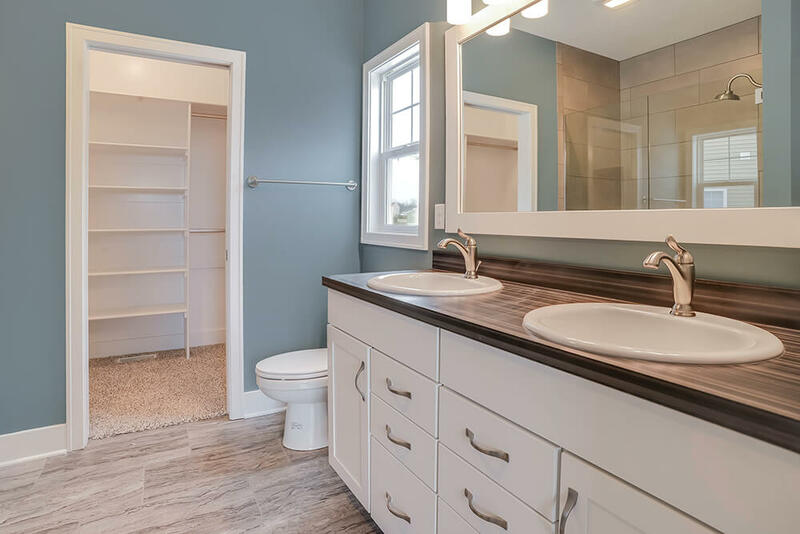 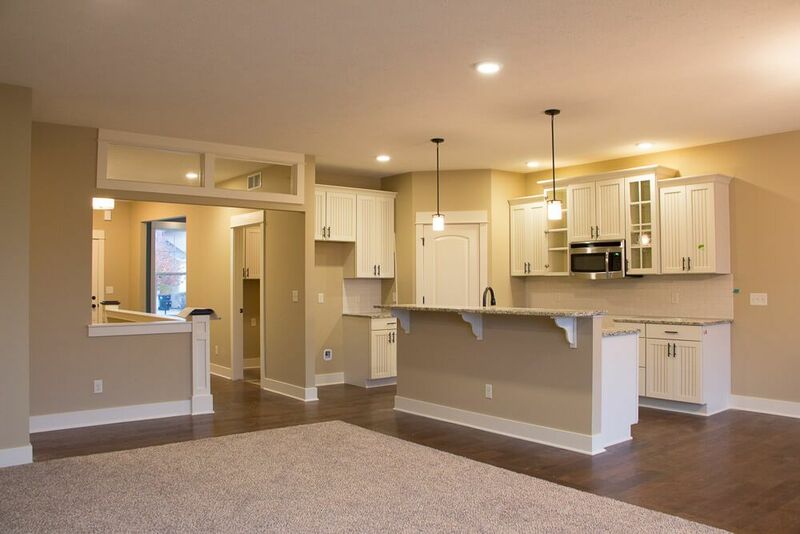 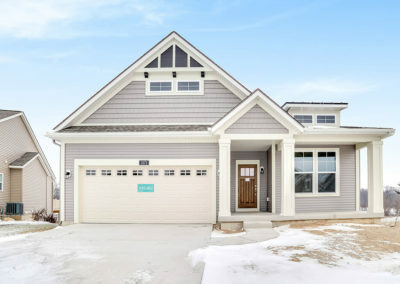 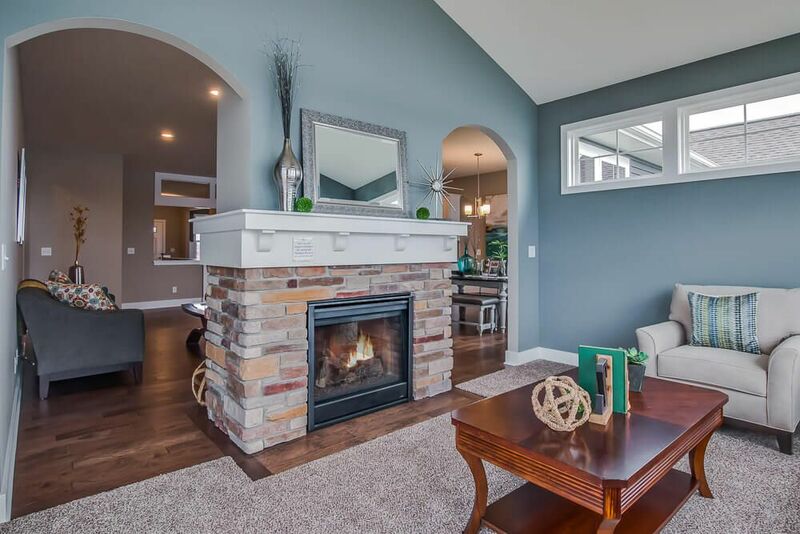 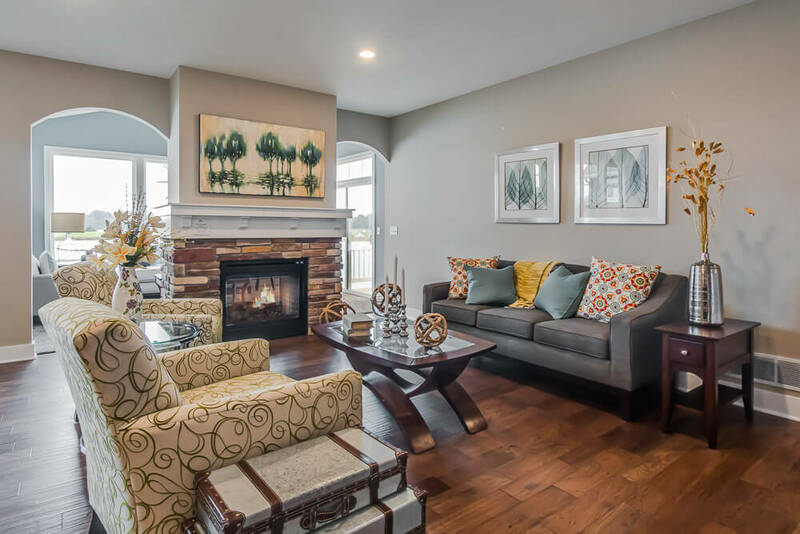 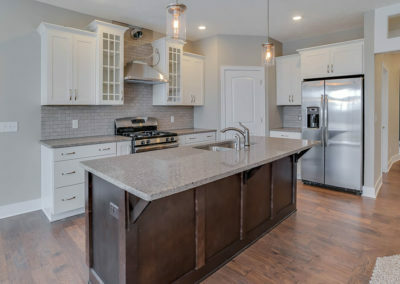 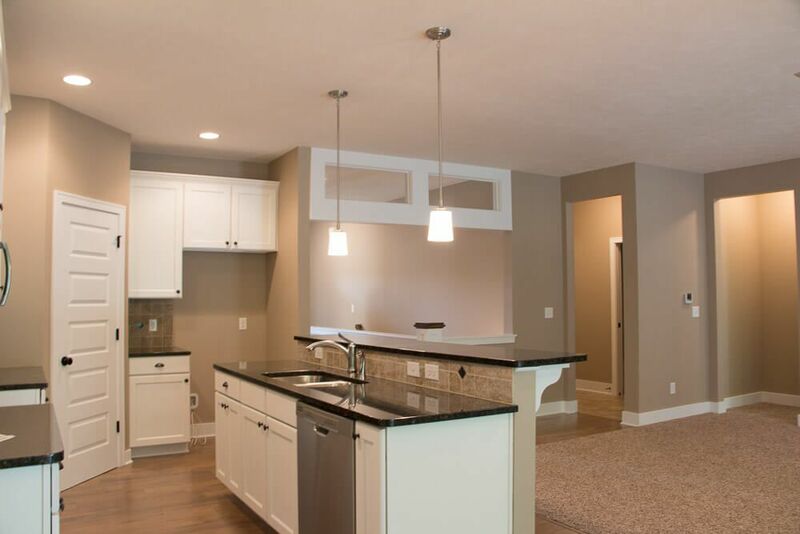 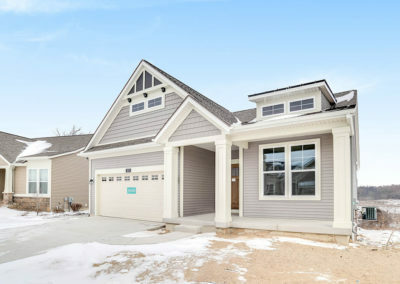 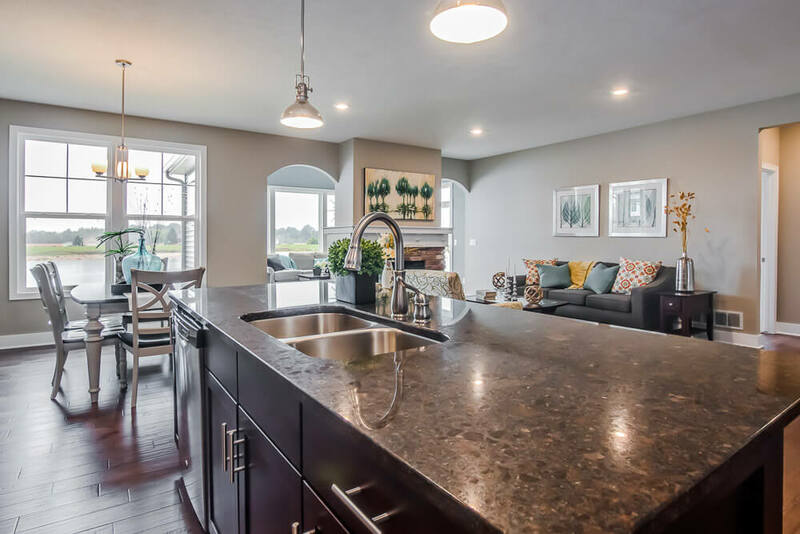 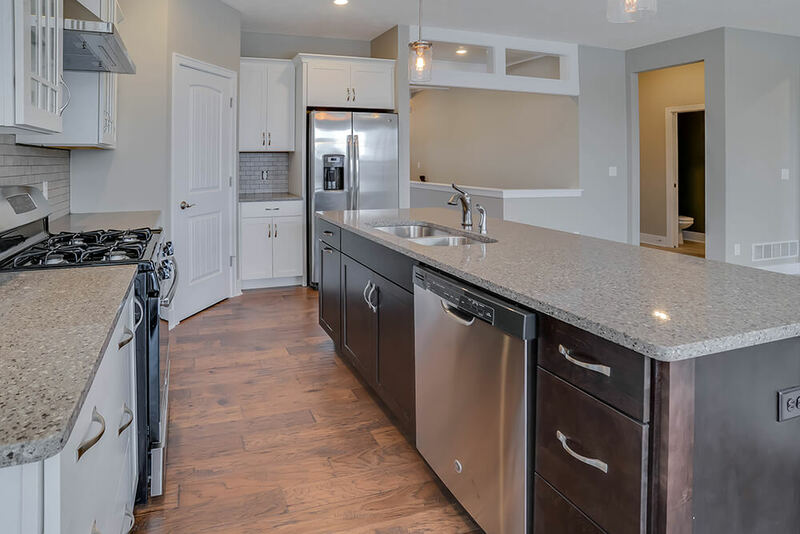 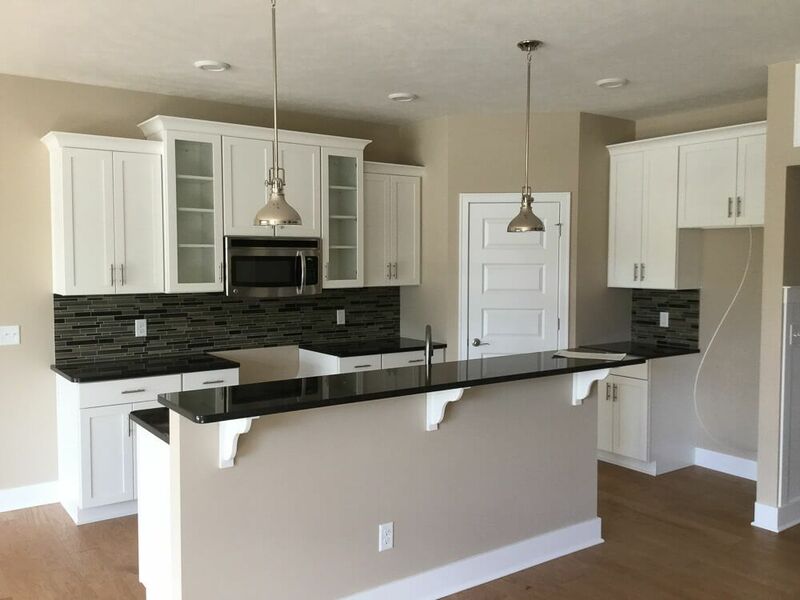 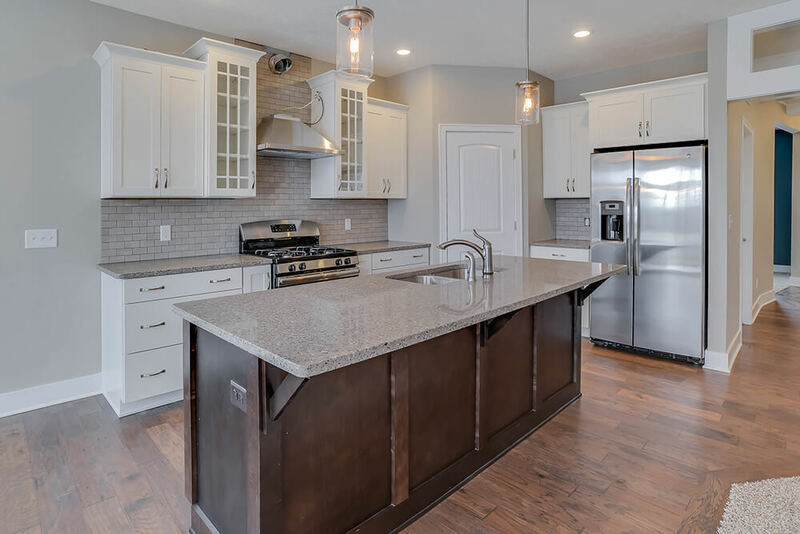 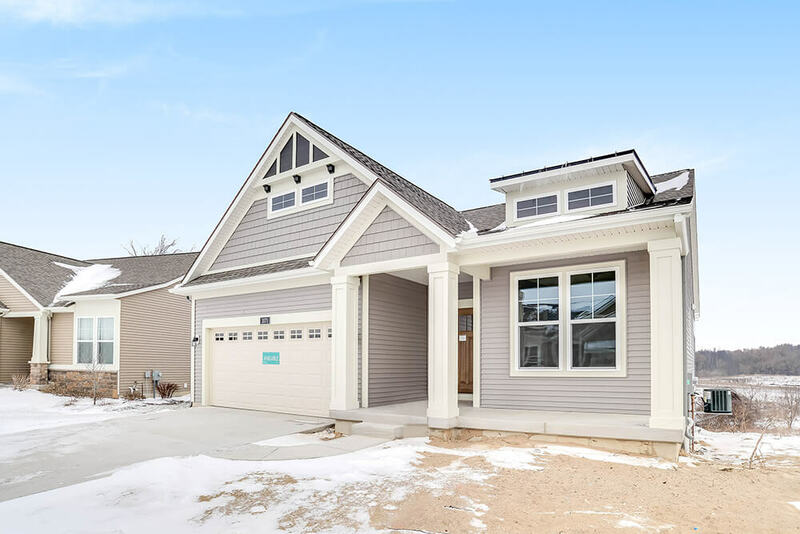 The Aspen home plan offers a stylish, spacious, and affordable home design with 1,364 finished square feet of living space including a master bedroom, master bathroom, and half bath. 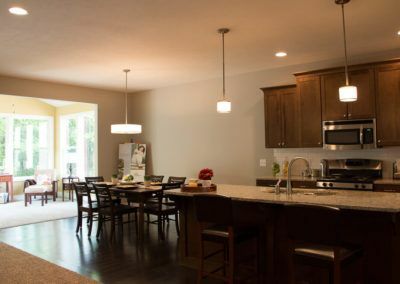 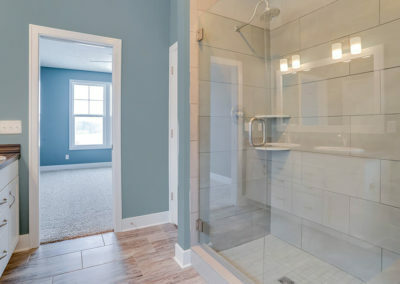 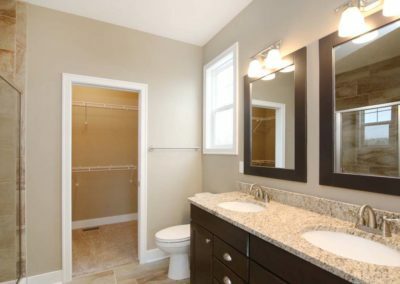 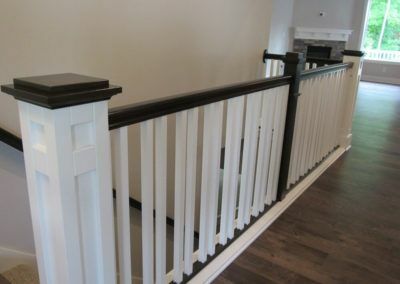 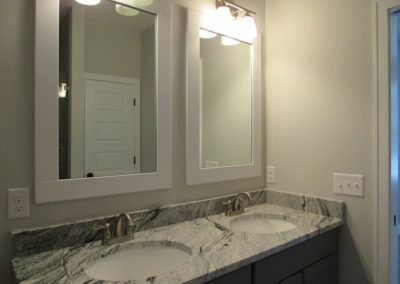 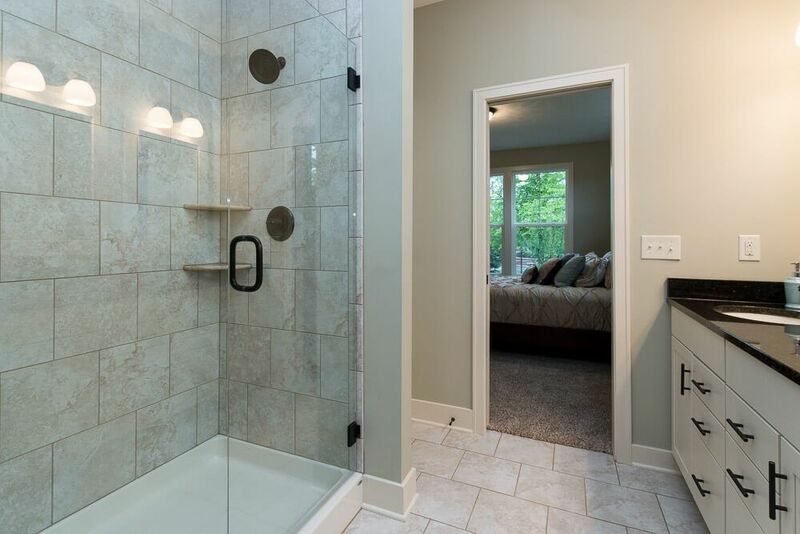 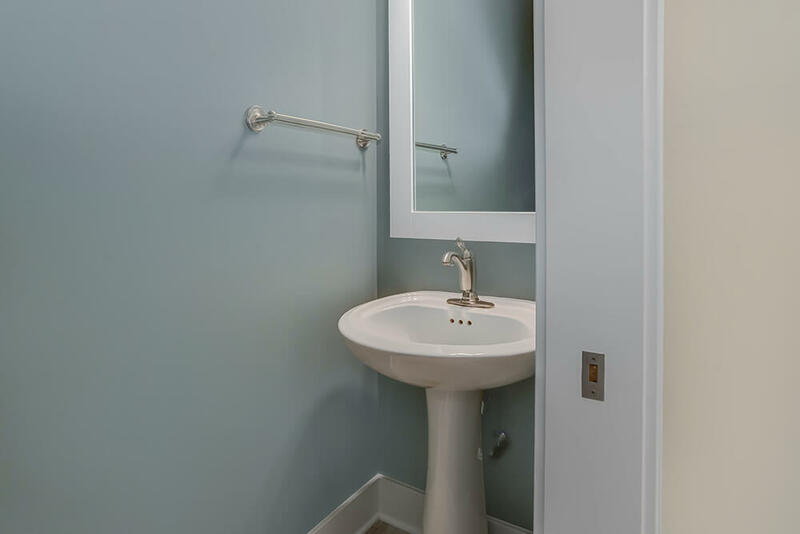 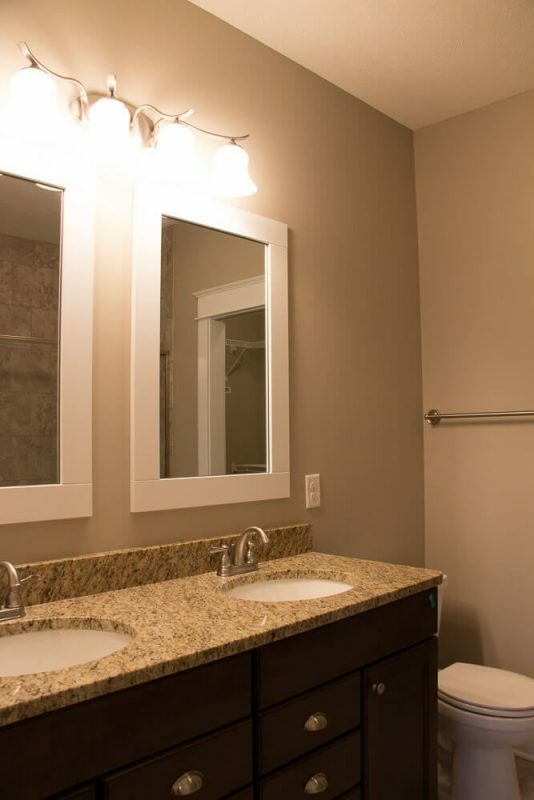 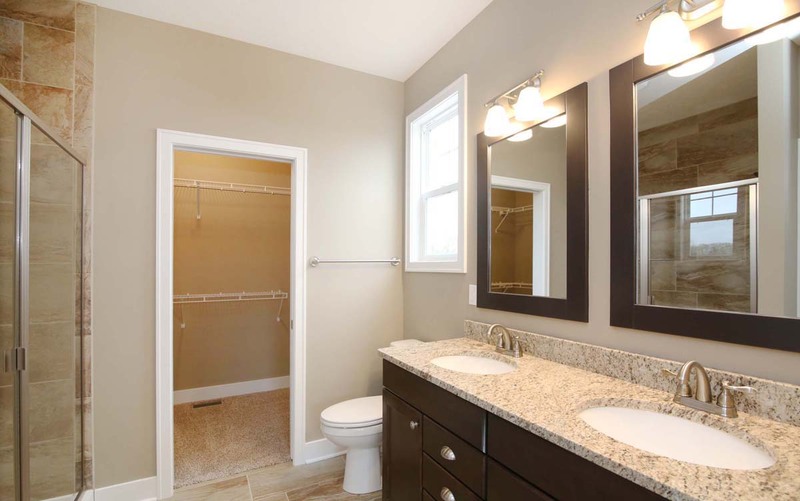 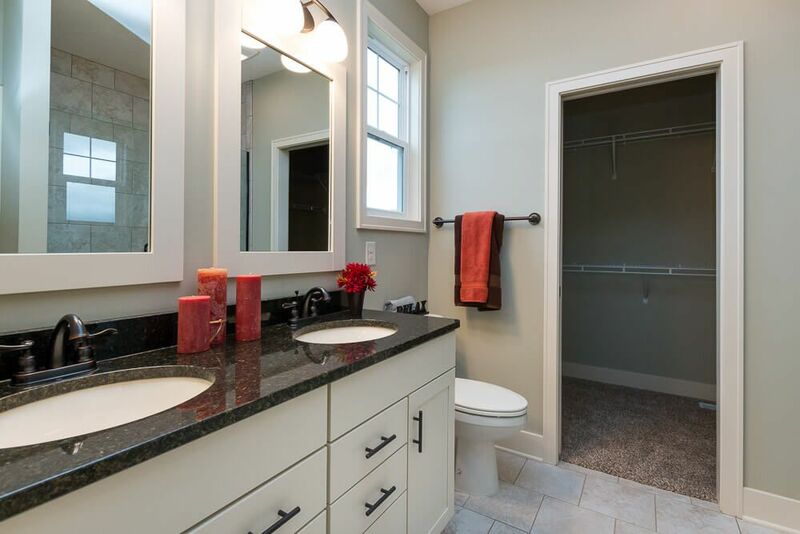 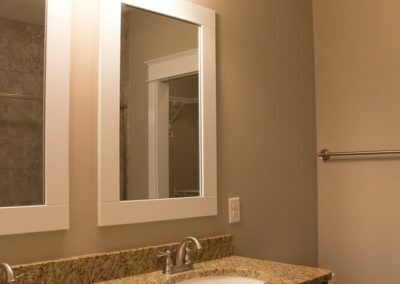 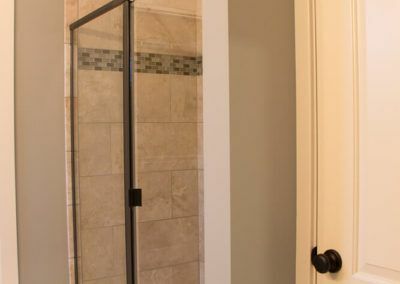 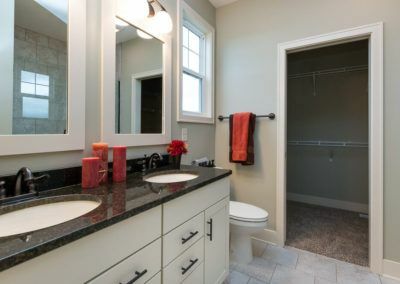 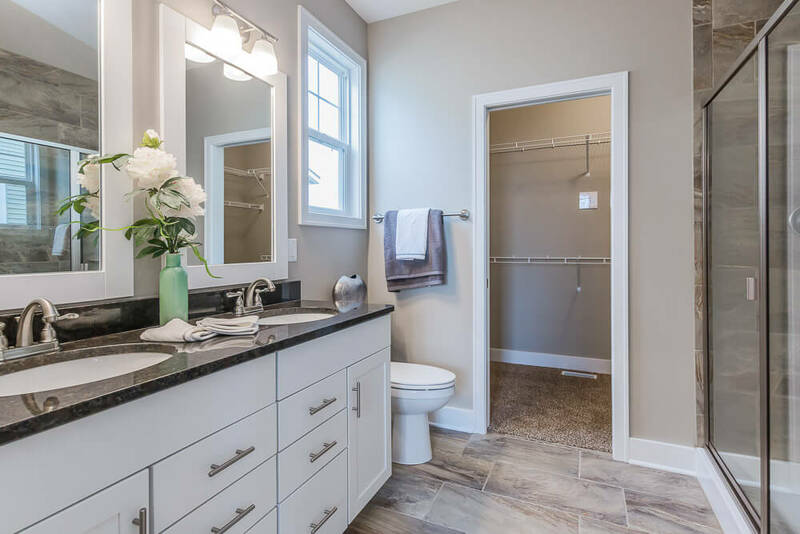 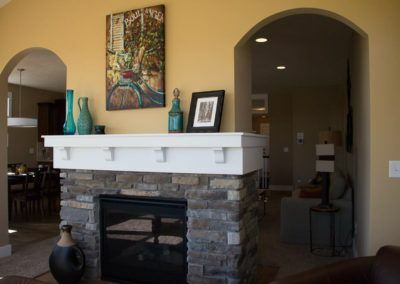 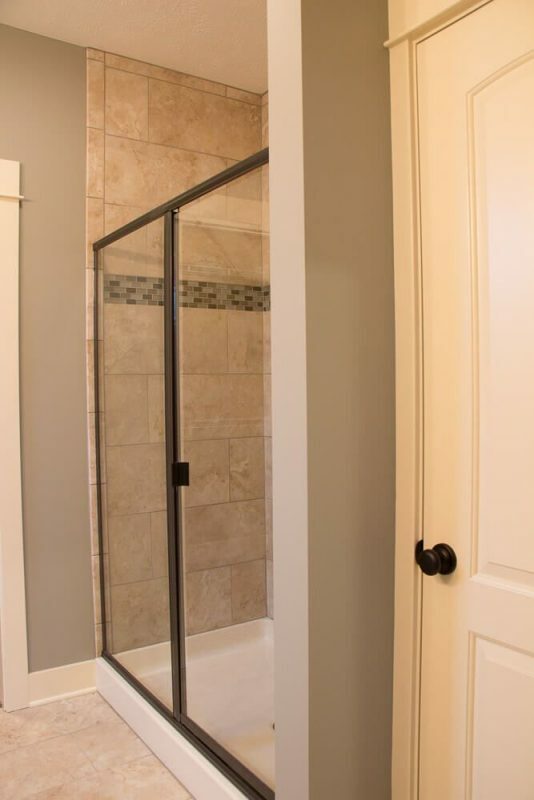 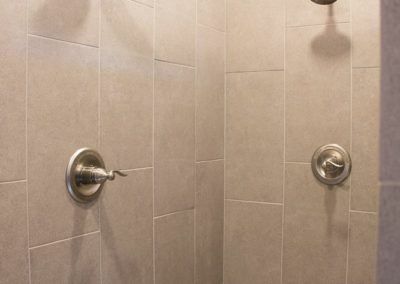 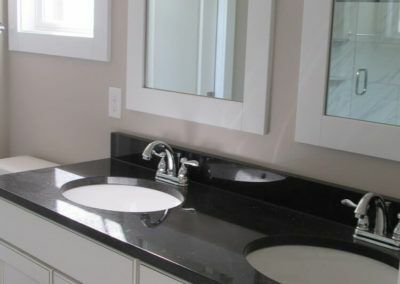 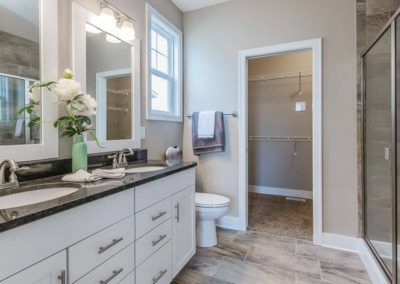 The home plan can be further expanded with a second bedroom and full bath in the lower level, and additional enhancements and personalized touches allow you to create a home that is truly and uniquely yours. 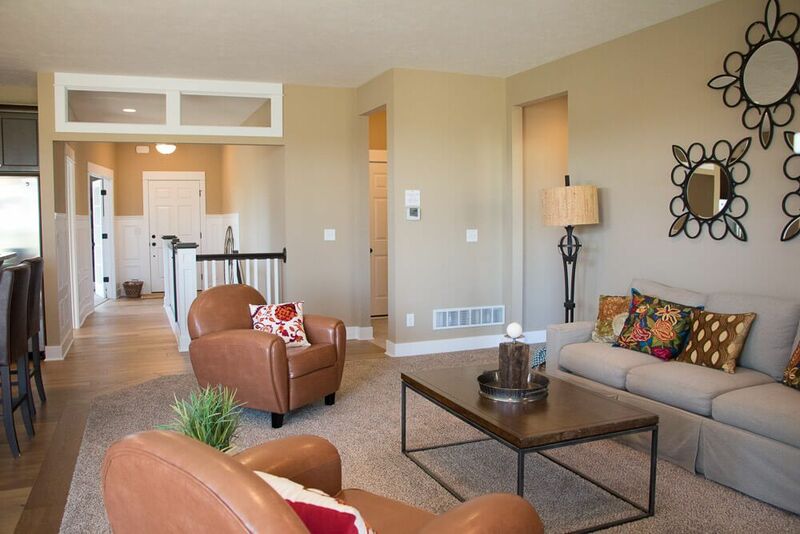 This tasteful condominium home plan offers a carefree, low maintenance condo living arrangement to complement your lifestyle. 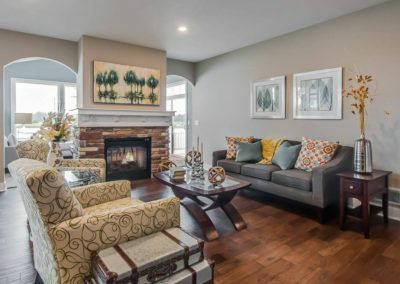 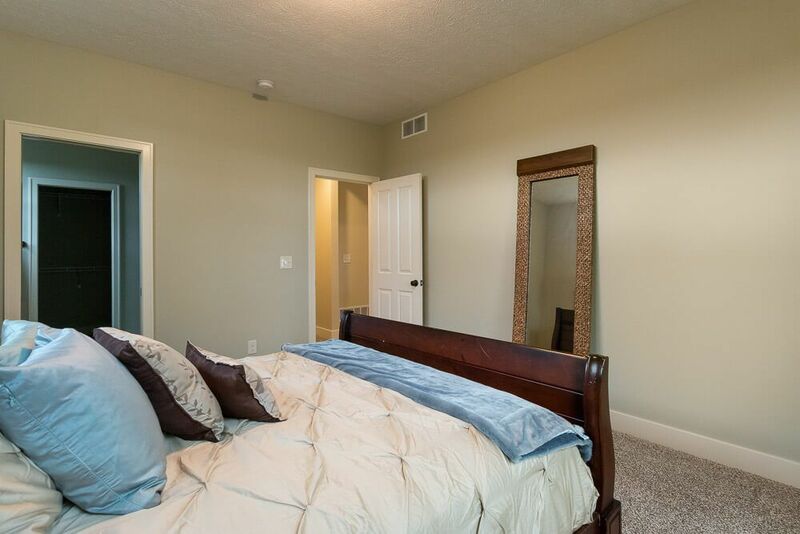 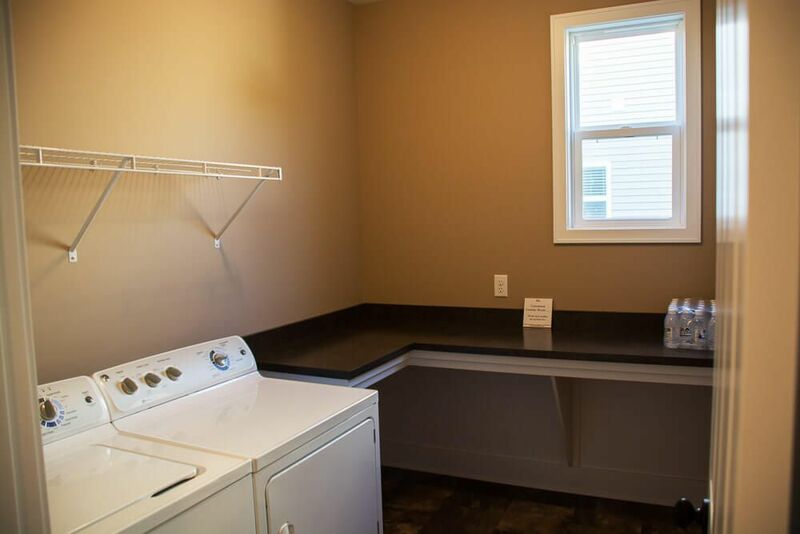 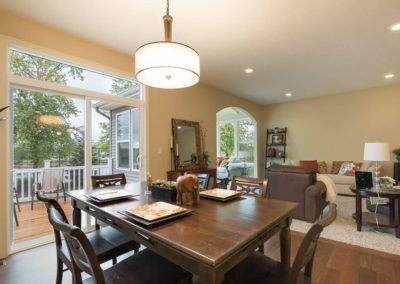 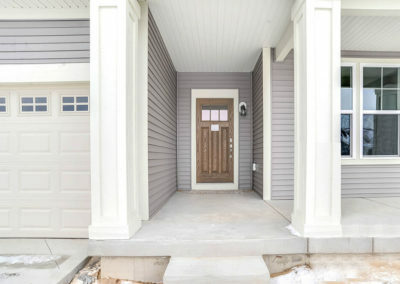 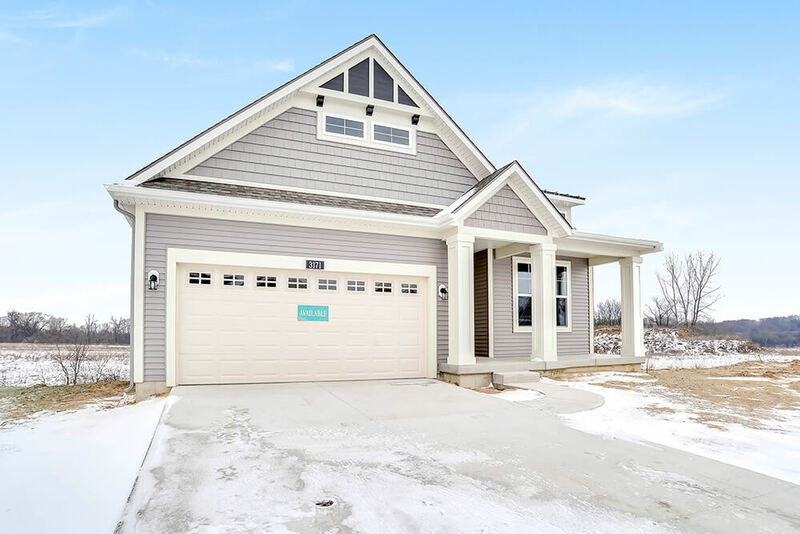 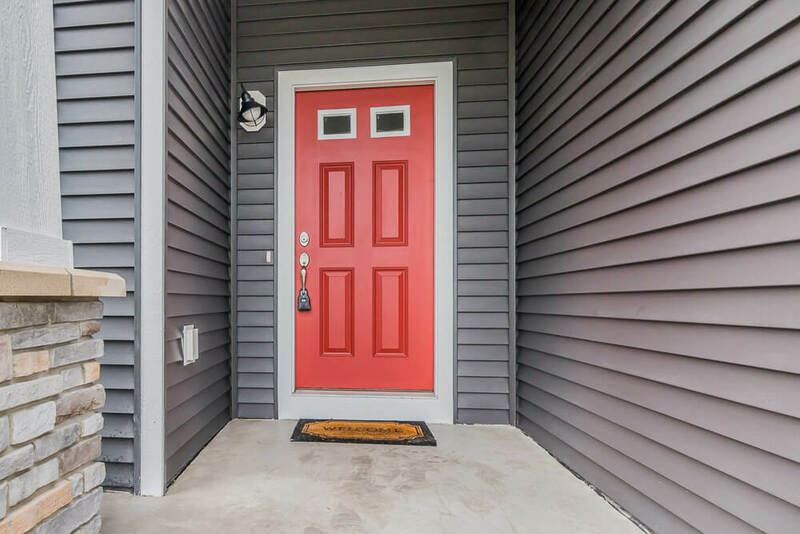 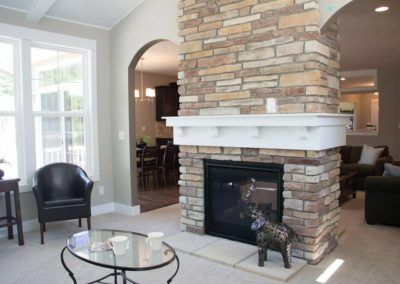 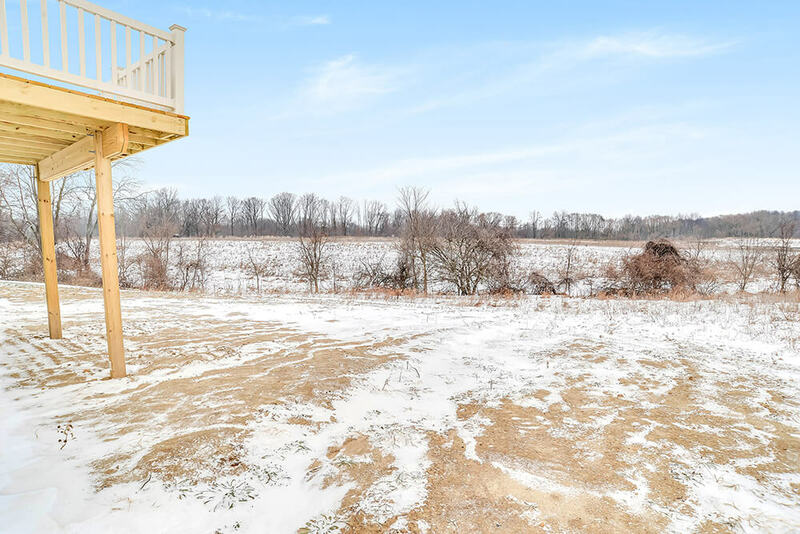 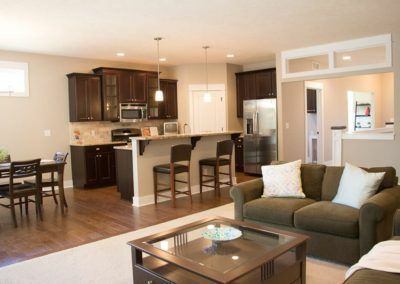 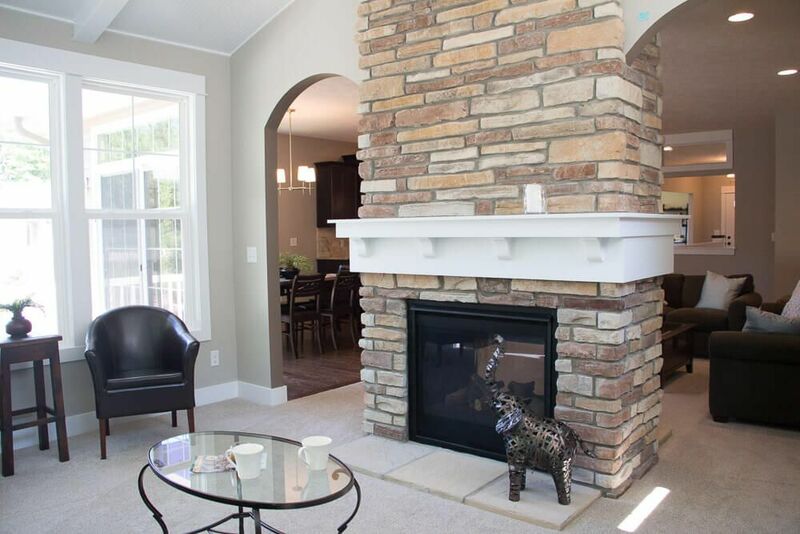 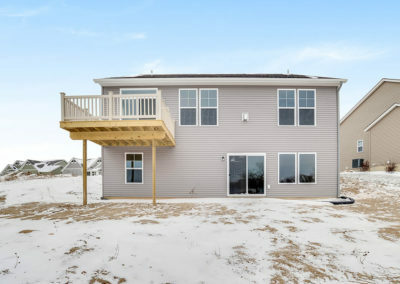 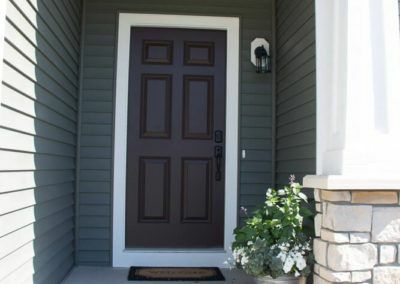 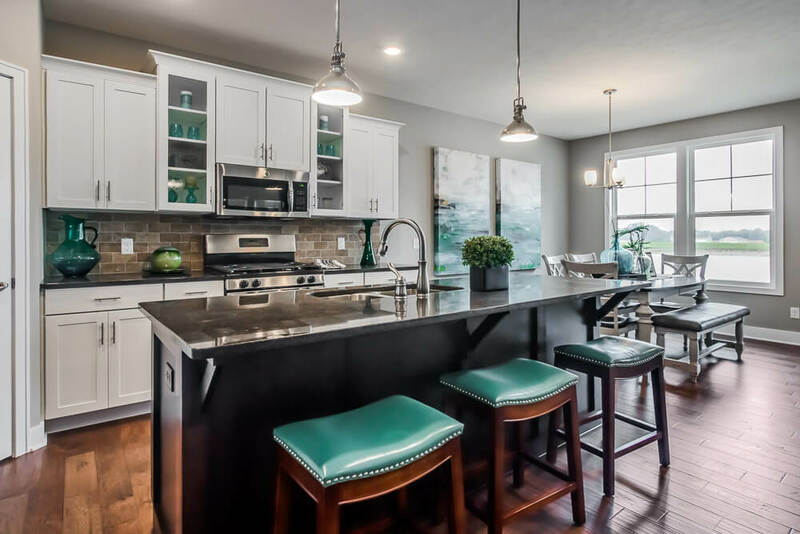 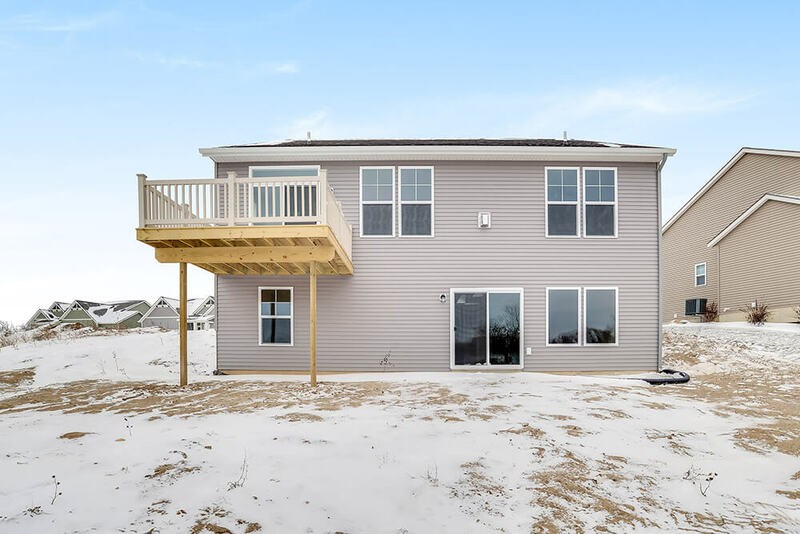 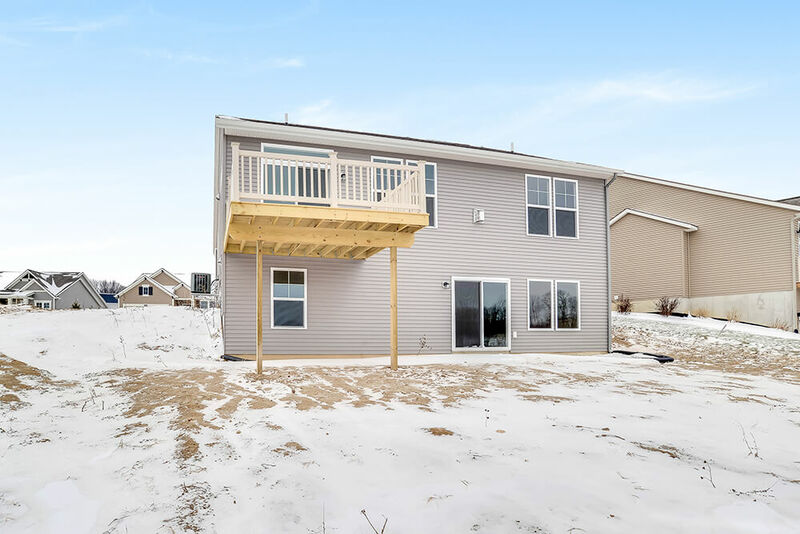 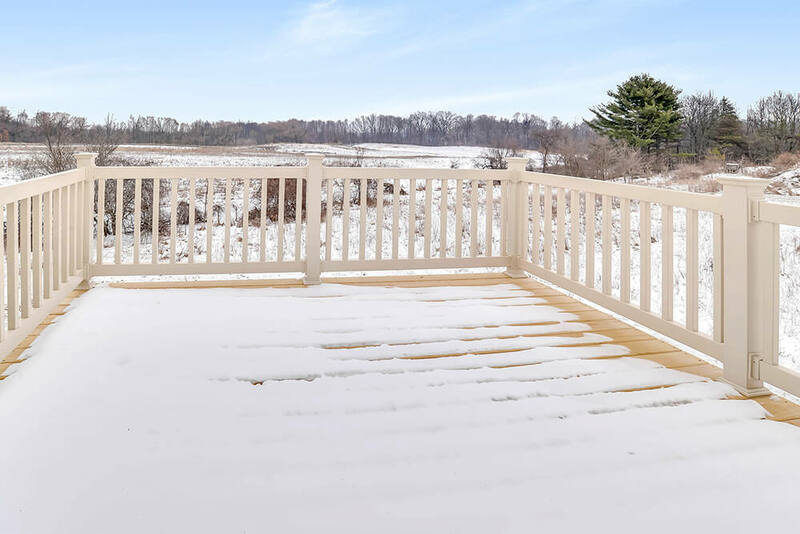 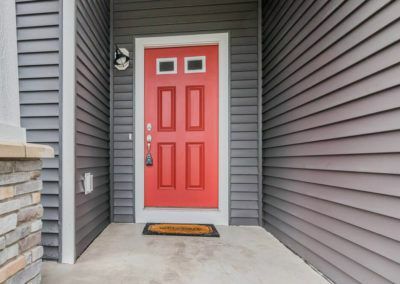 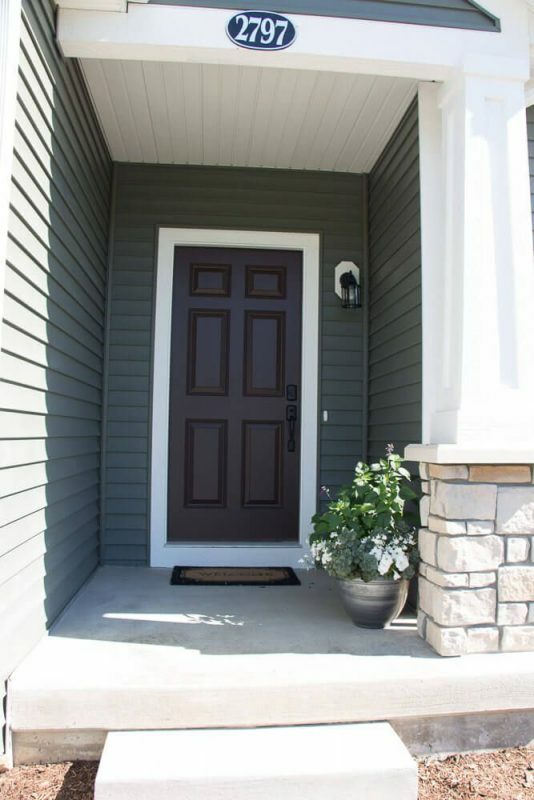 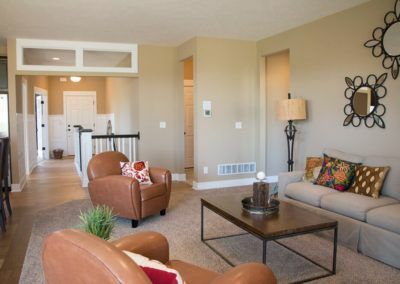 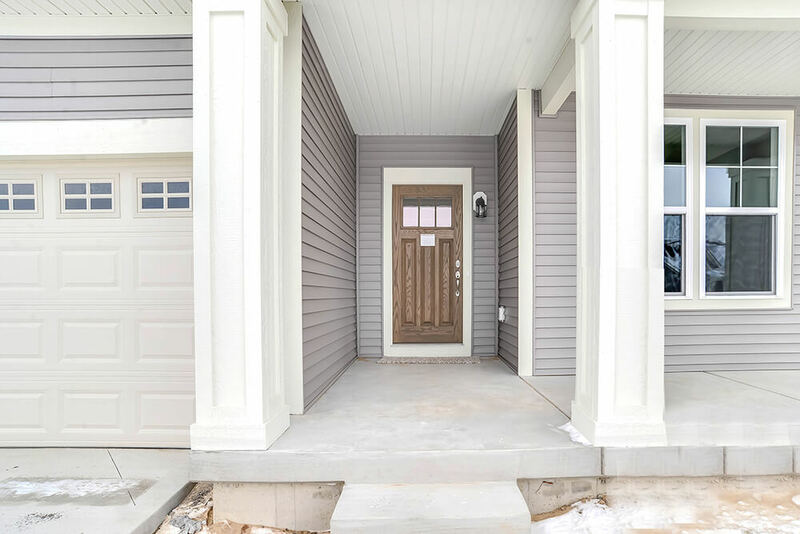 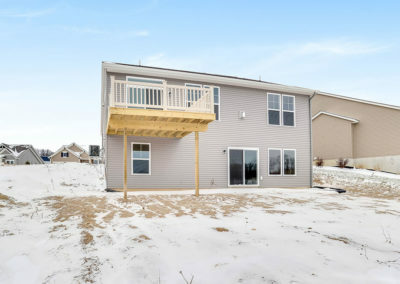 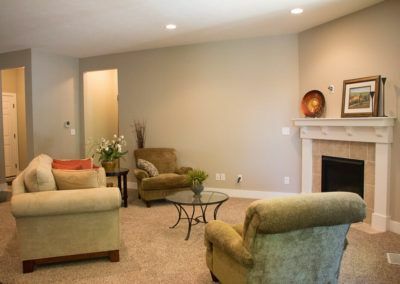 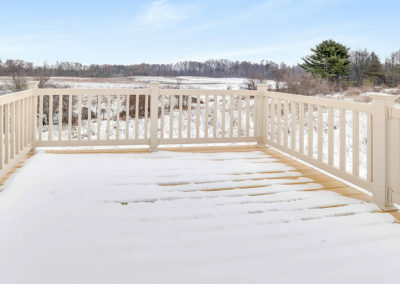 The Aspen’s front door opens from the porch into the entry hall, which leads past the front office with its optional French doors, the convenient main level laundry room, and into the bright and open main living space. 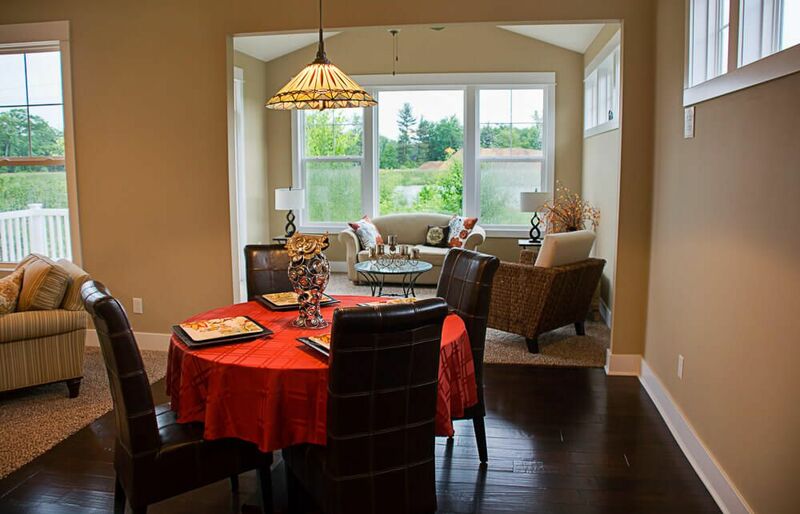 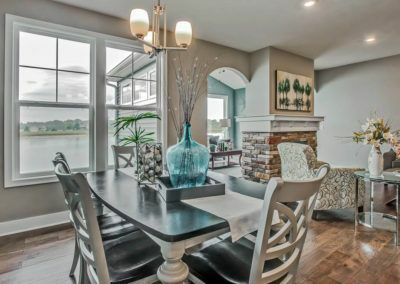 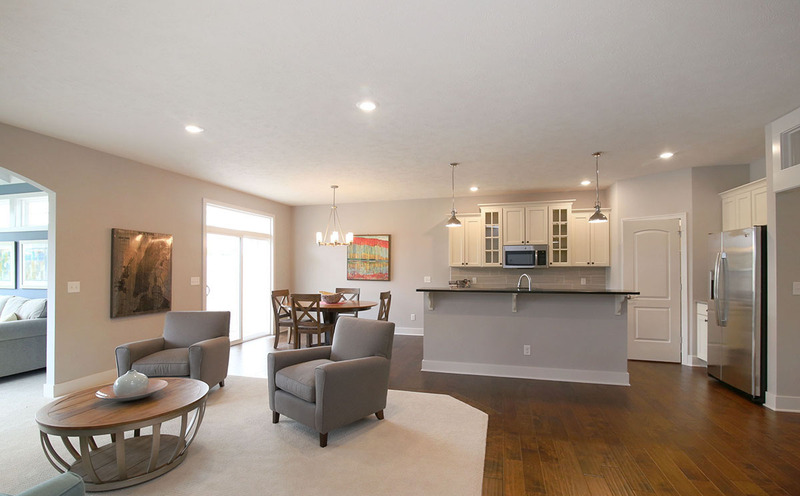 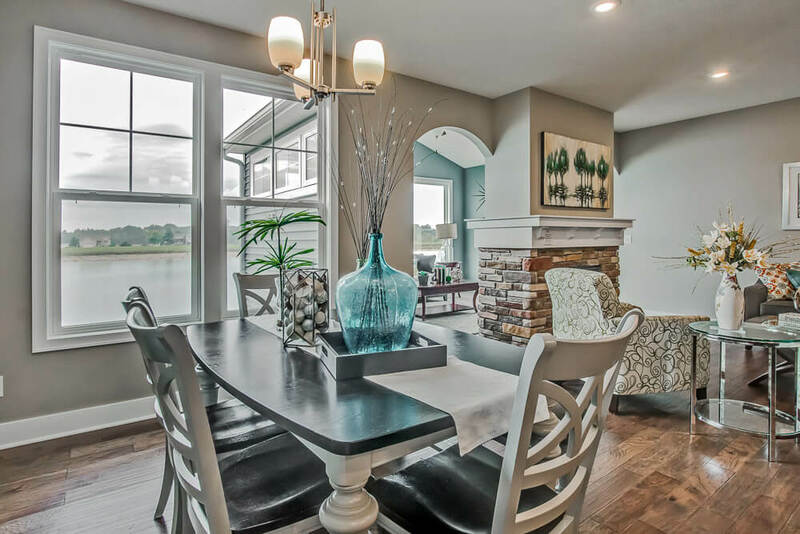 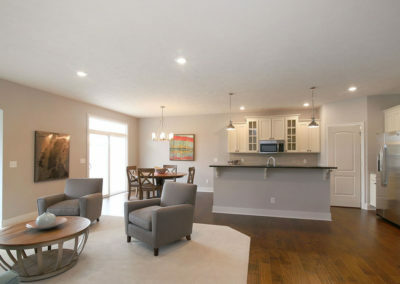 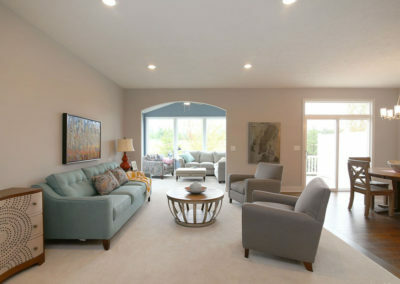 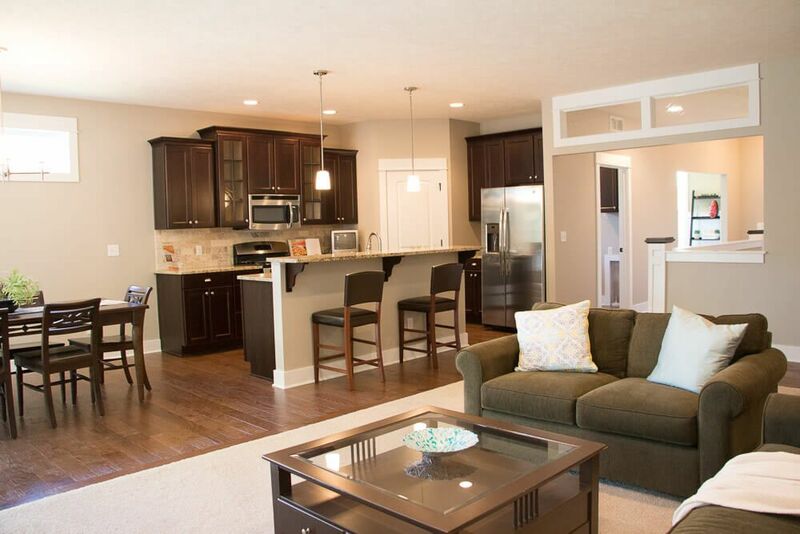 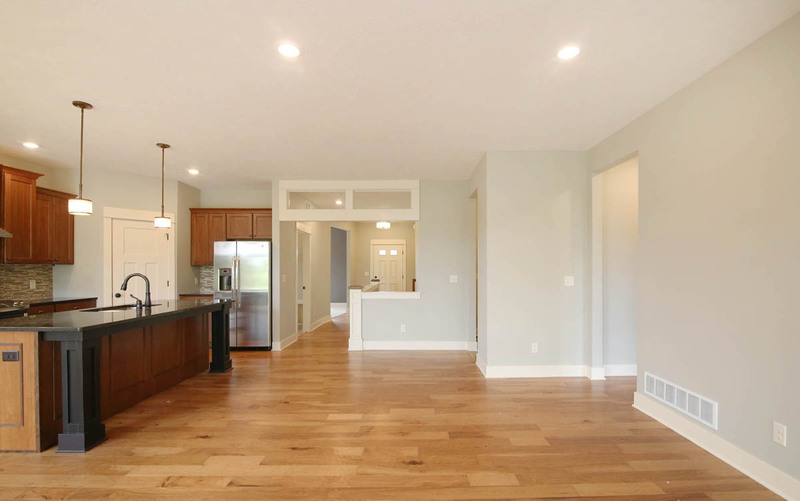 The open living area includes the great room, dining area, and kitchen with island. 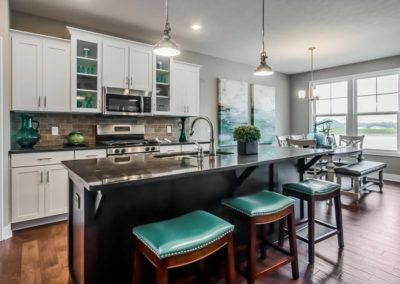 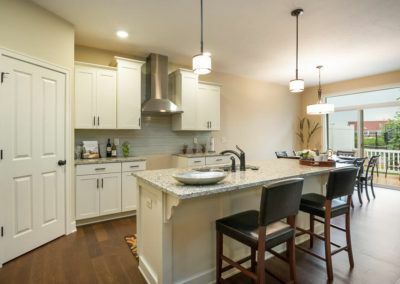 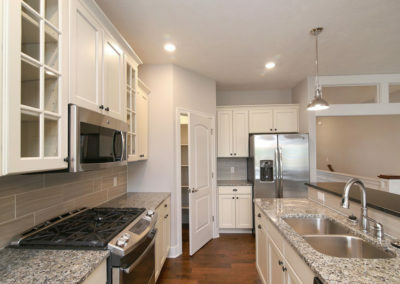 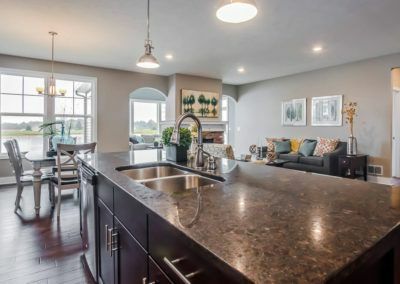 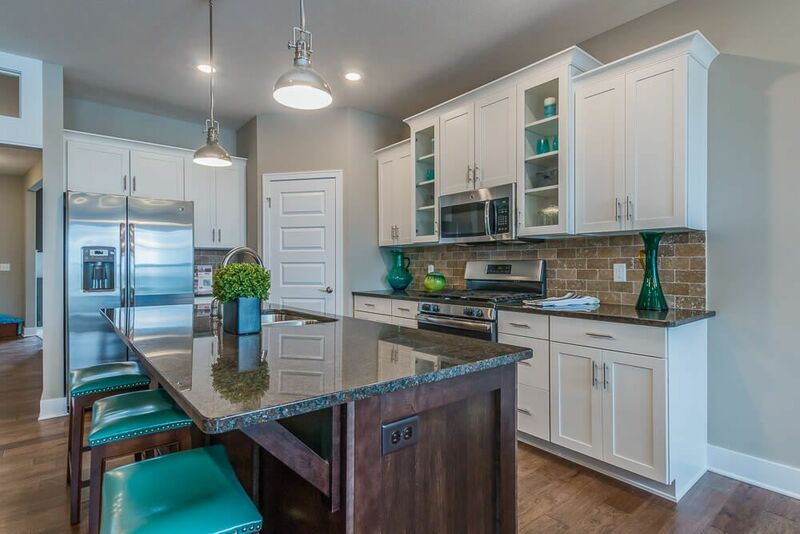 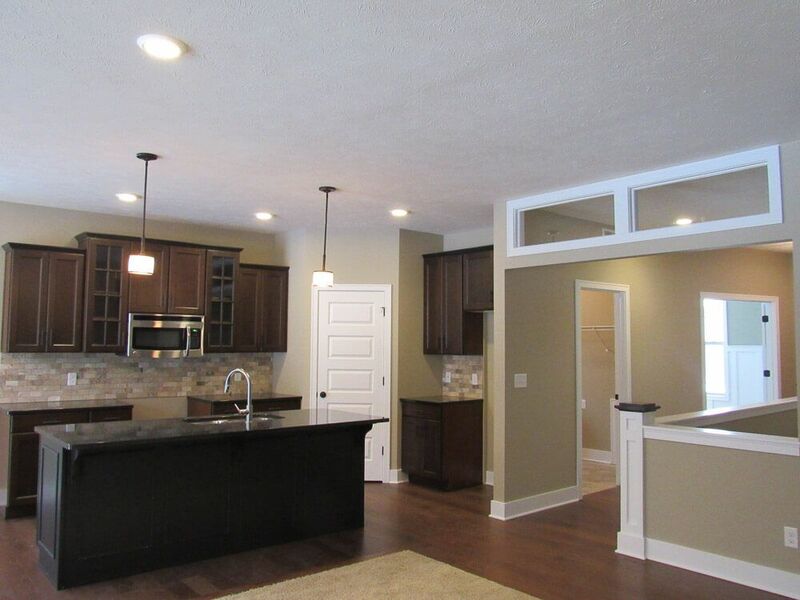 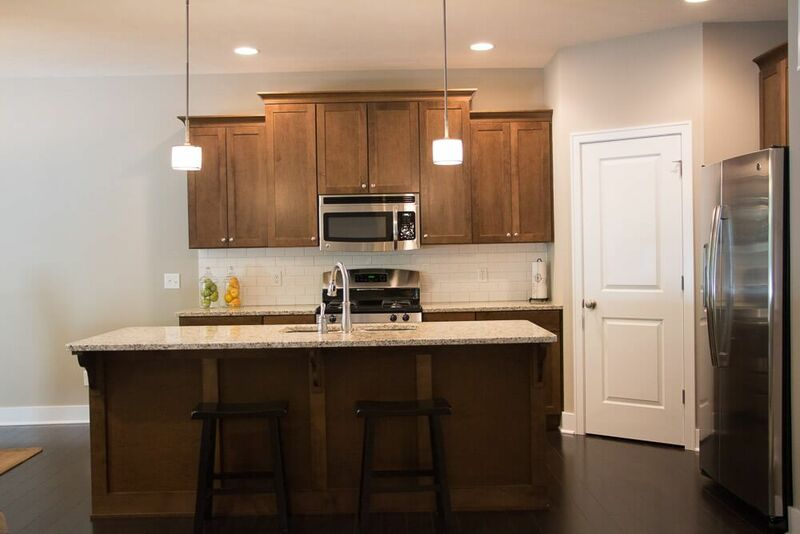 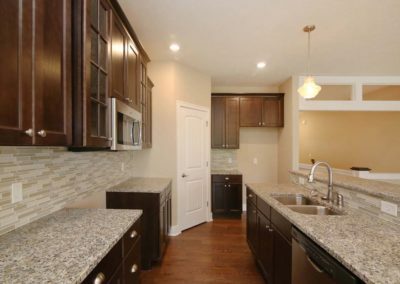 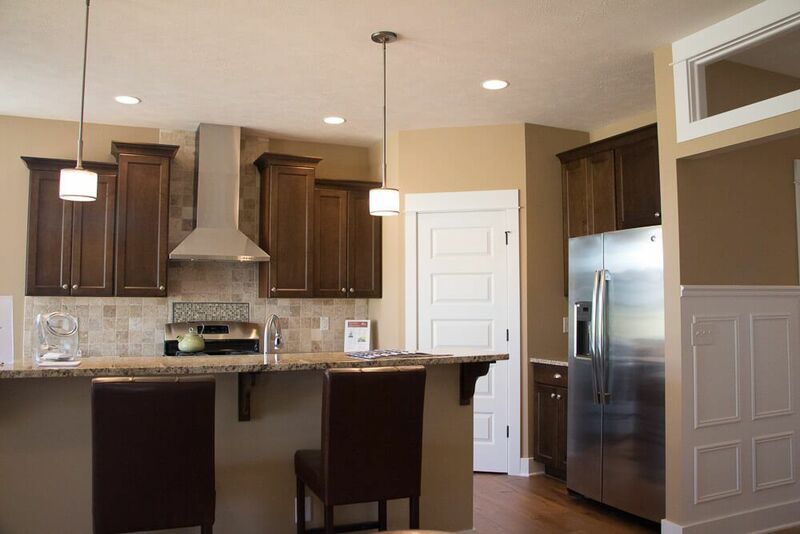 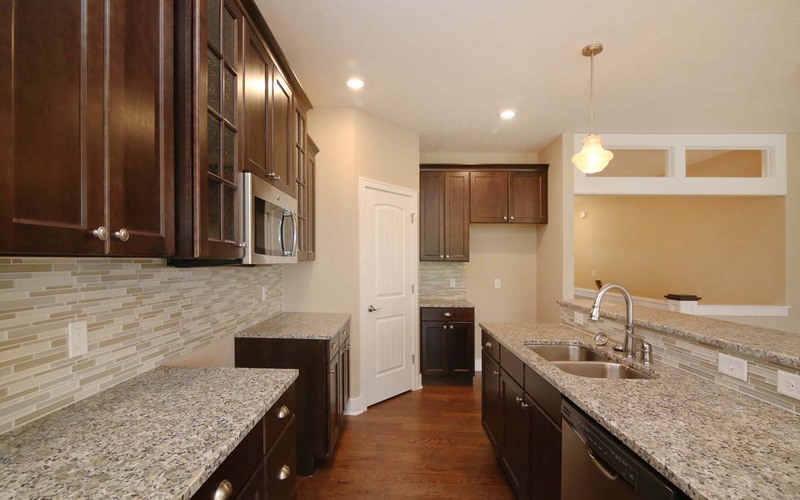 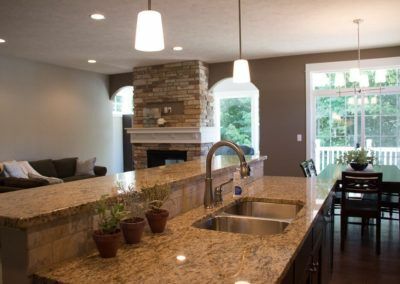 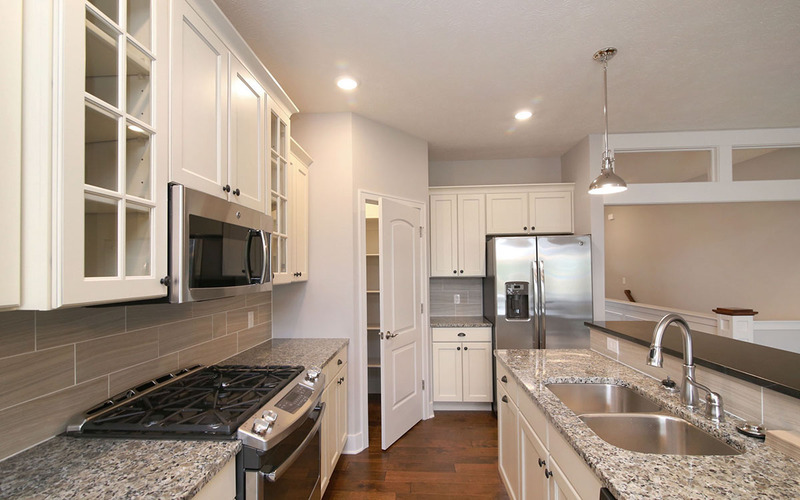 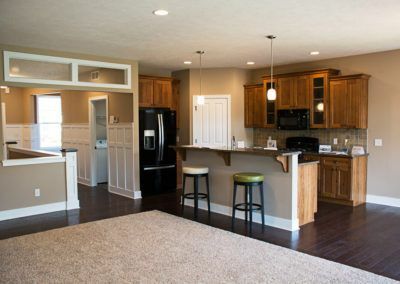 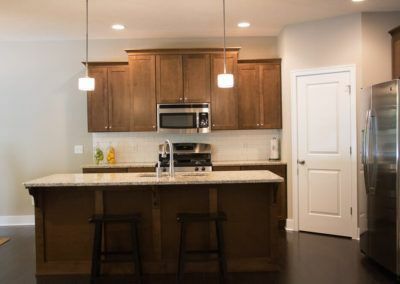 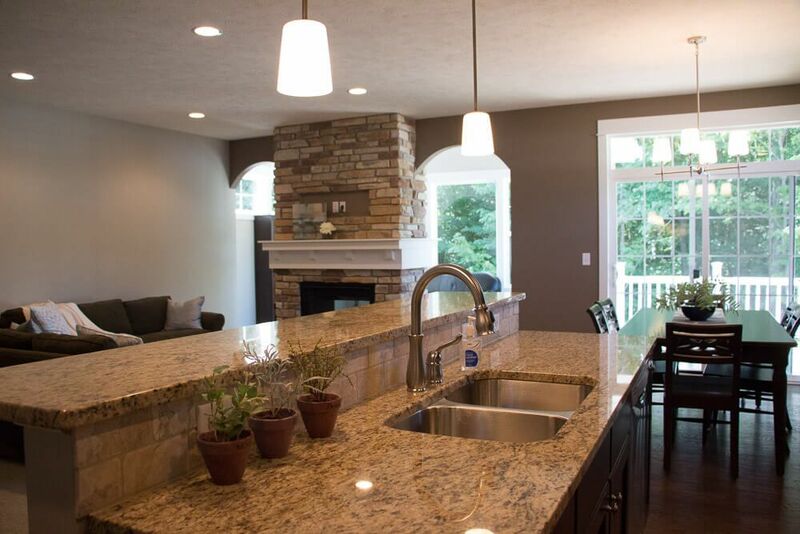 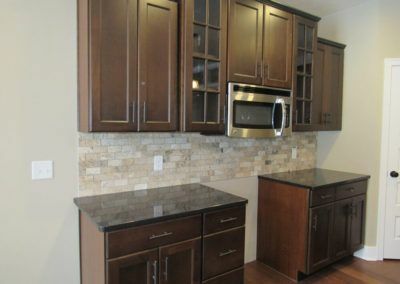 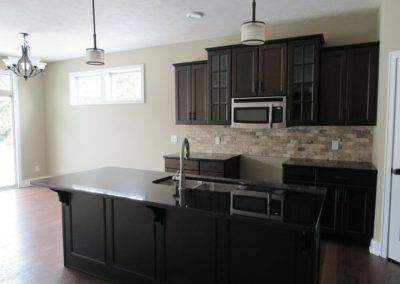 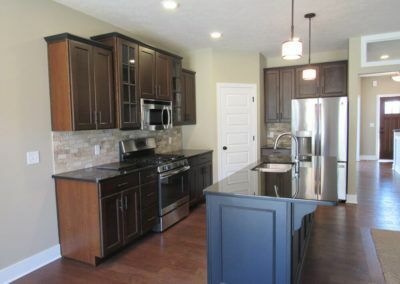 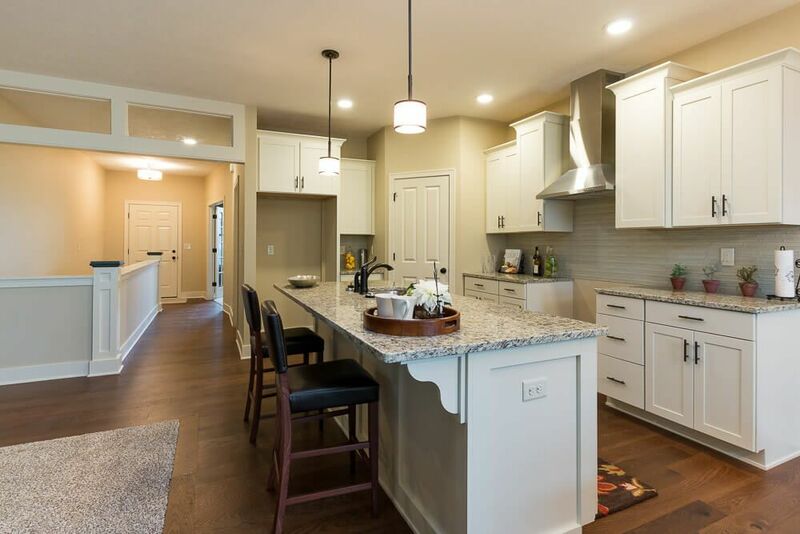 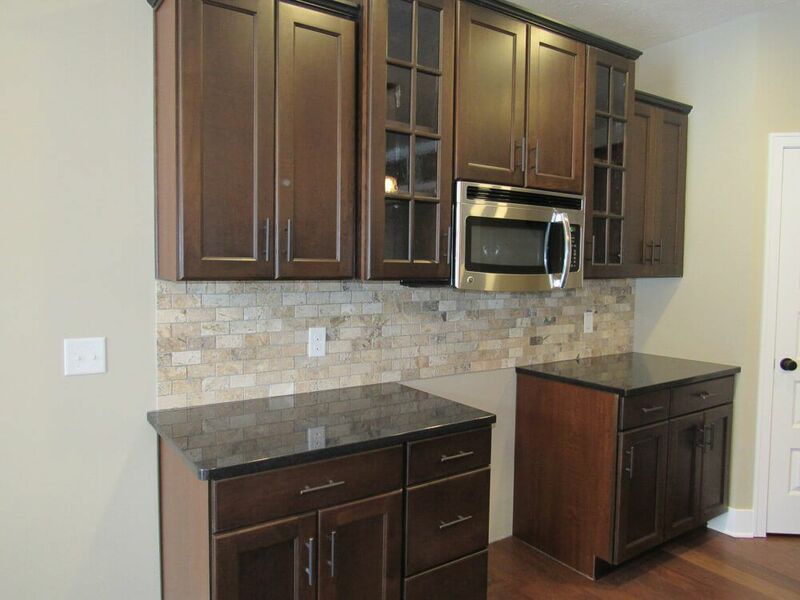 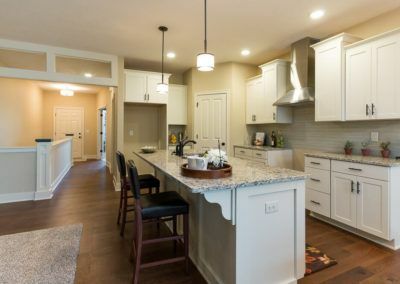 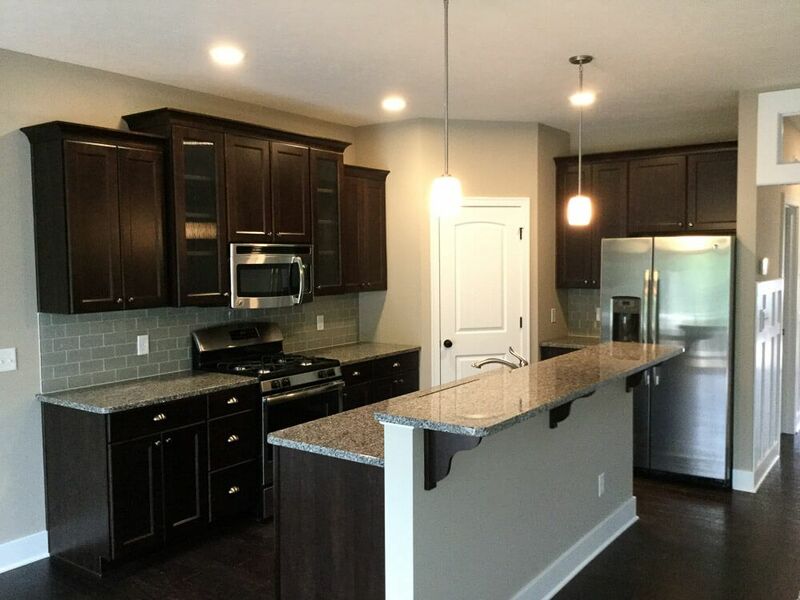 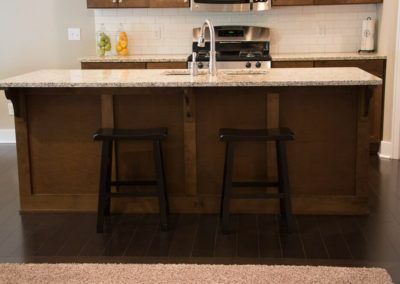 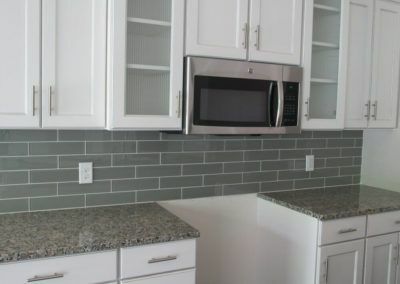 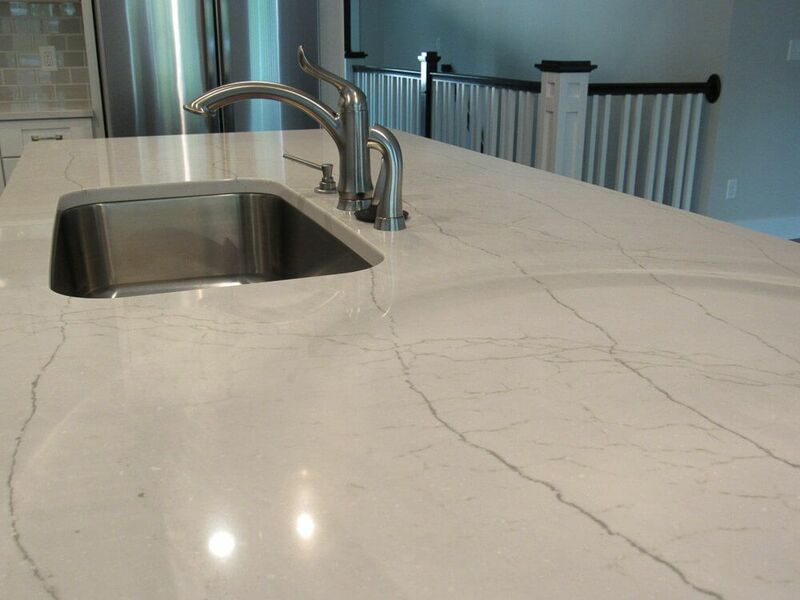 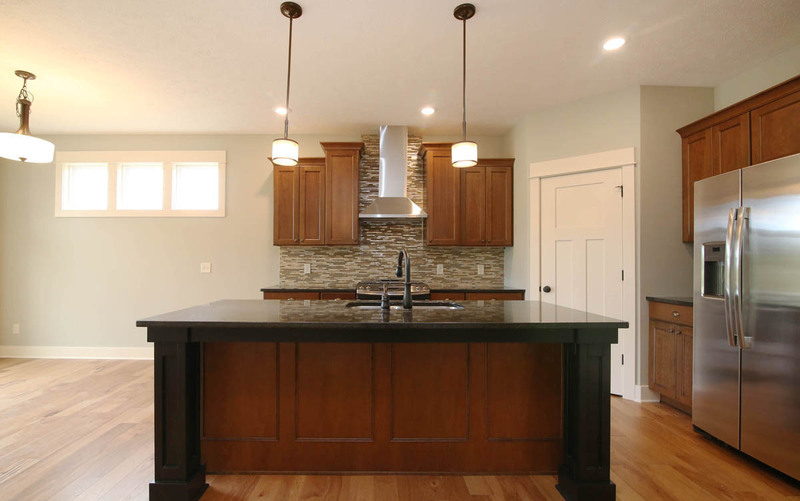 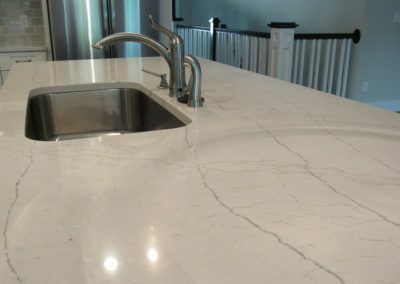 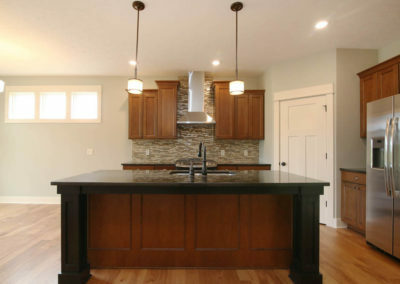 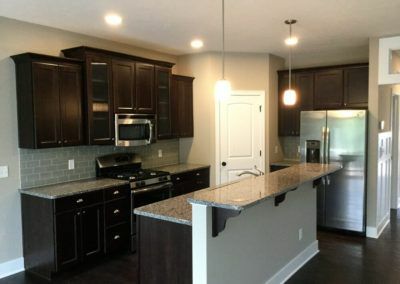 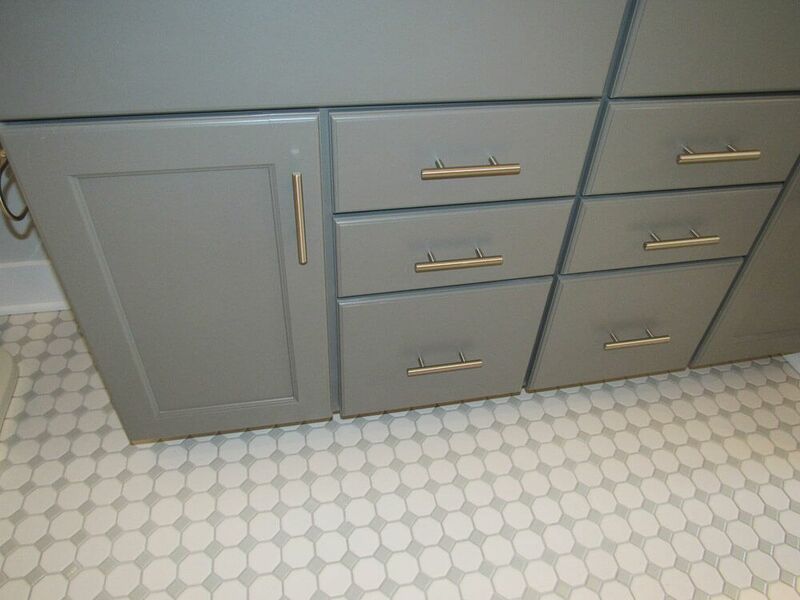 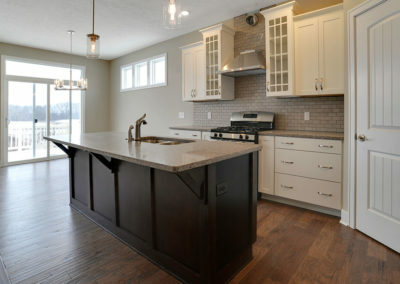 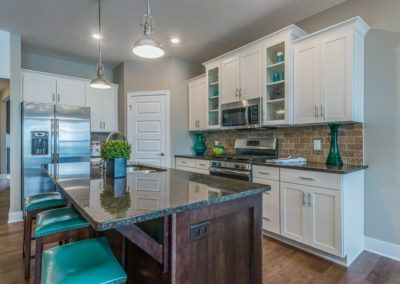 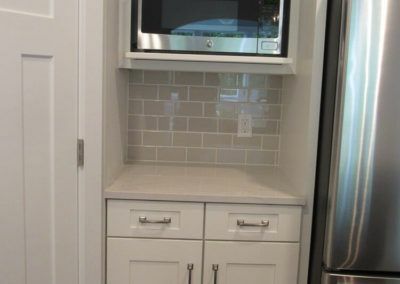 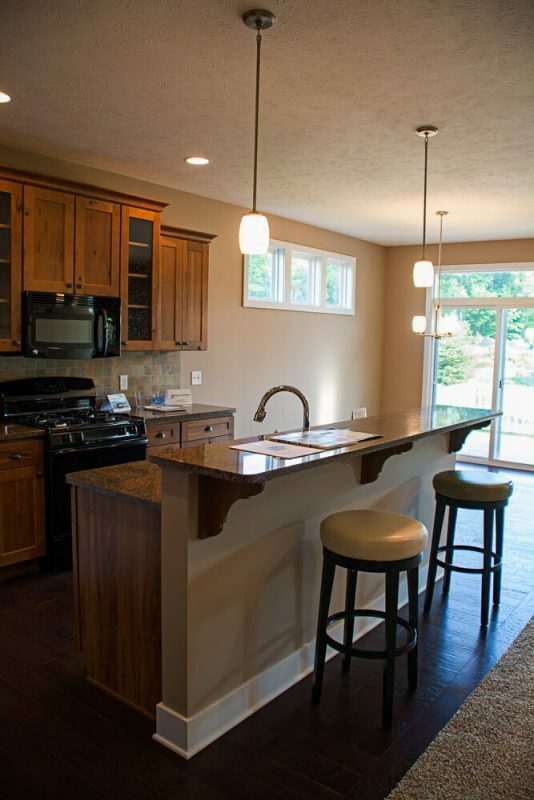 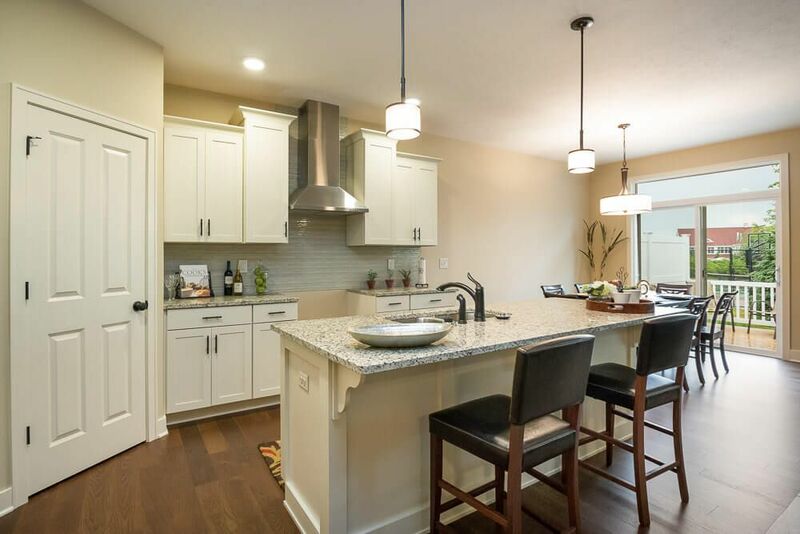 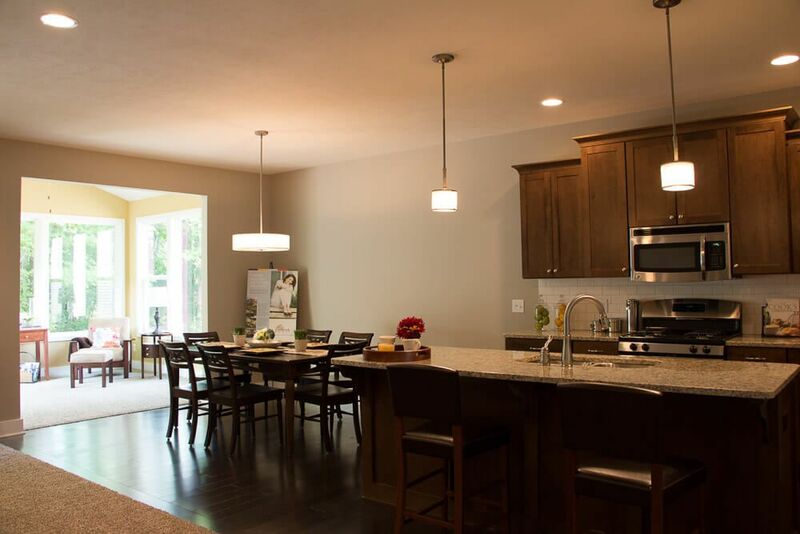 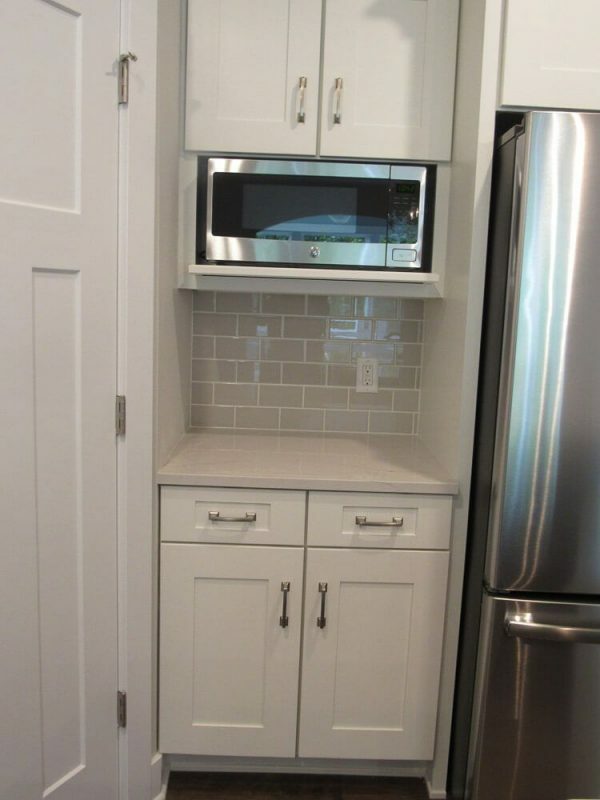 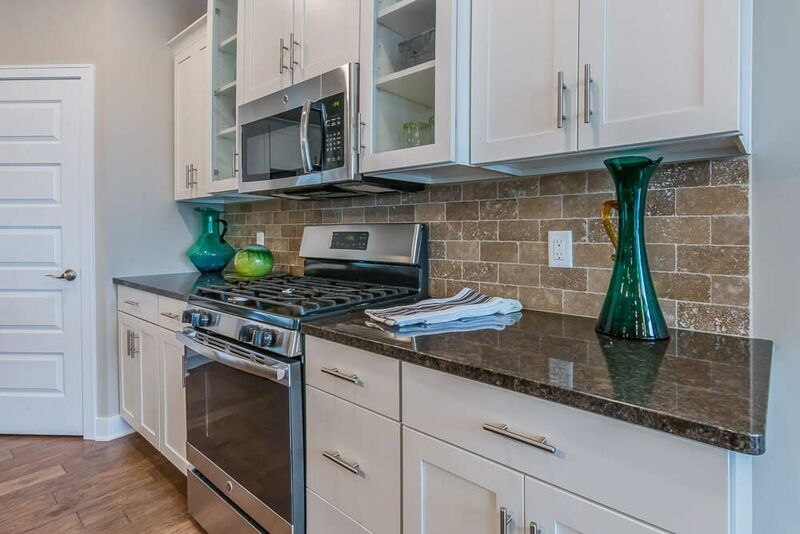 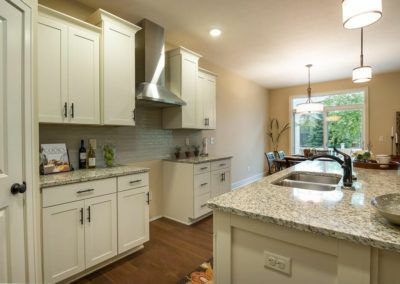 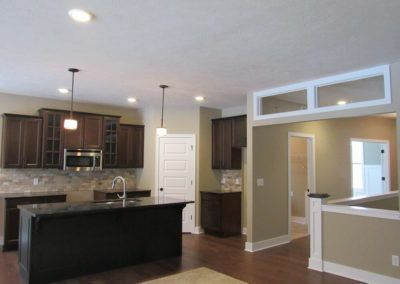 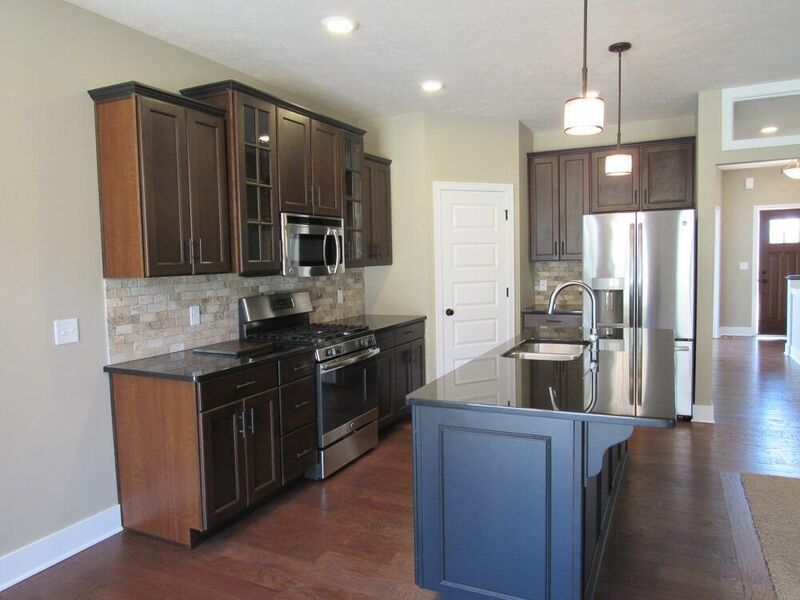 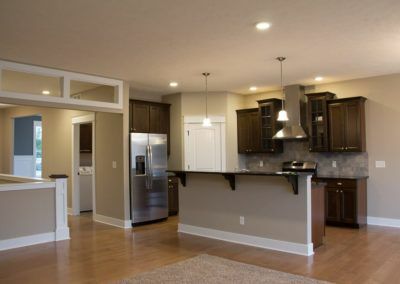 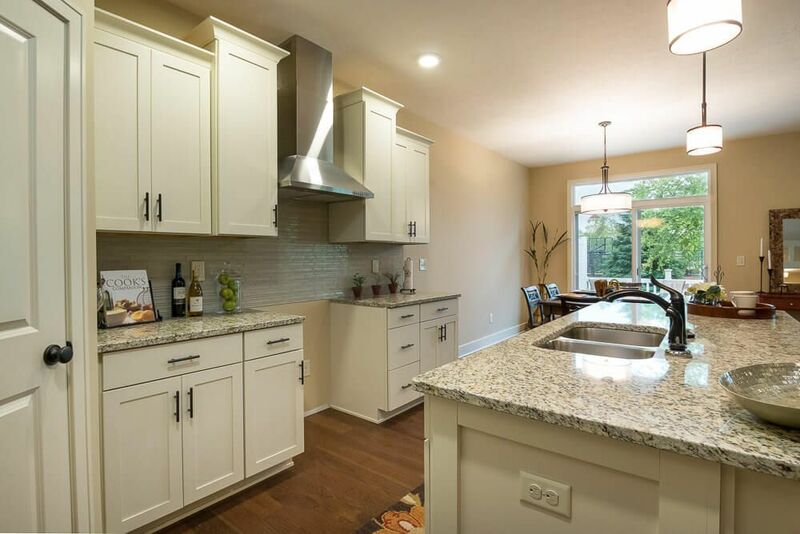 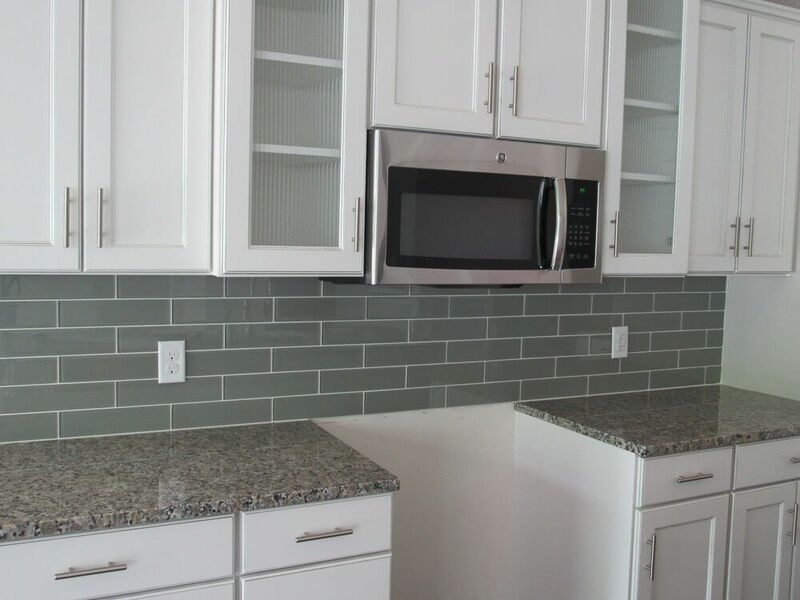 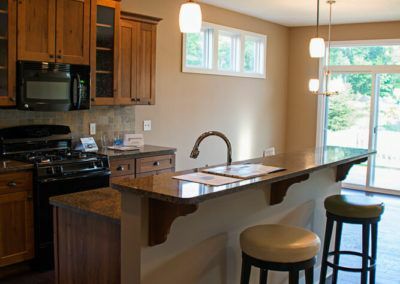 The kitchen offers a walk-in pantry and the island has a double sink and raised snack bar. 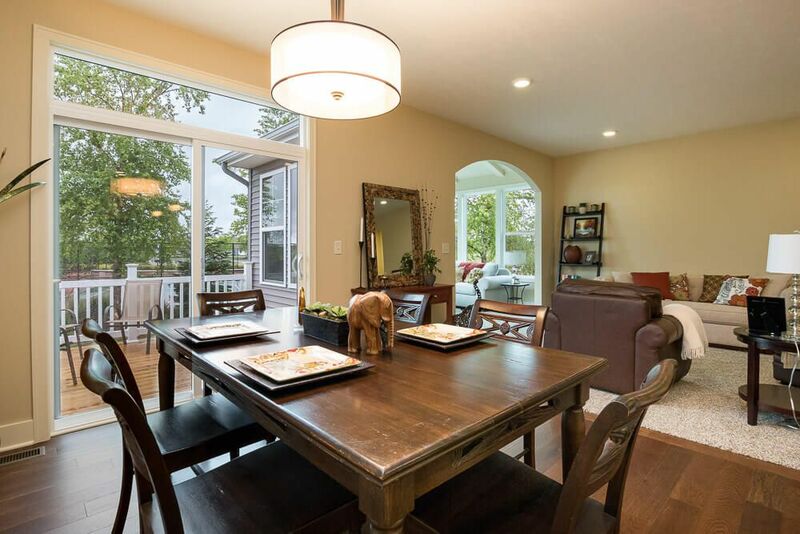 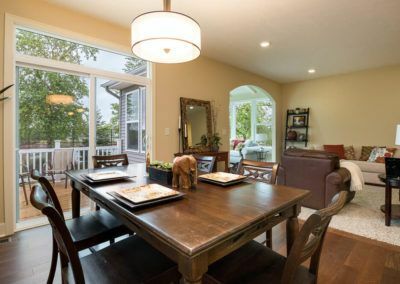 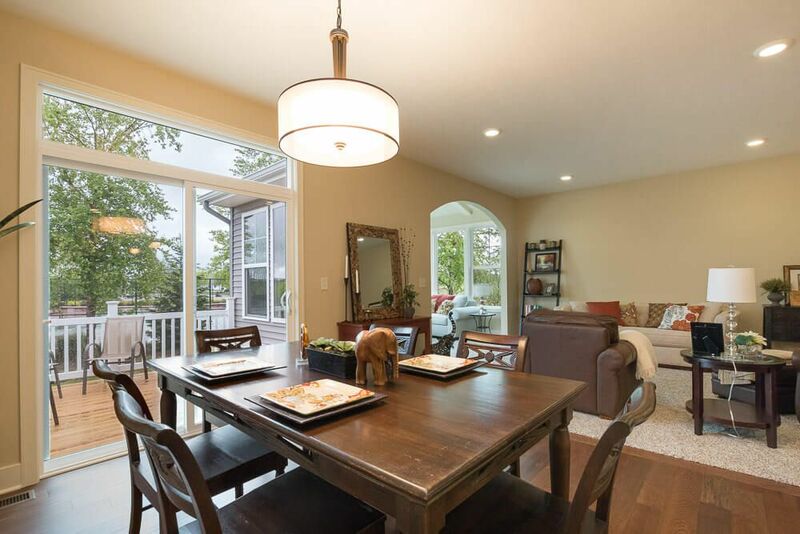 The kitchen flows smoothly into the dining room which opens through a sliding door onto your new rear deck. 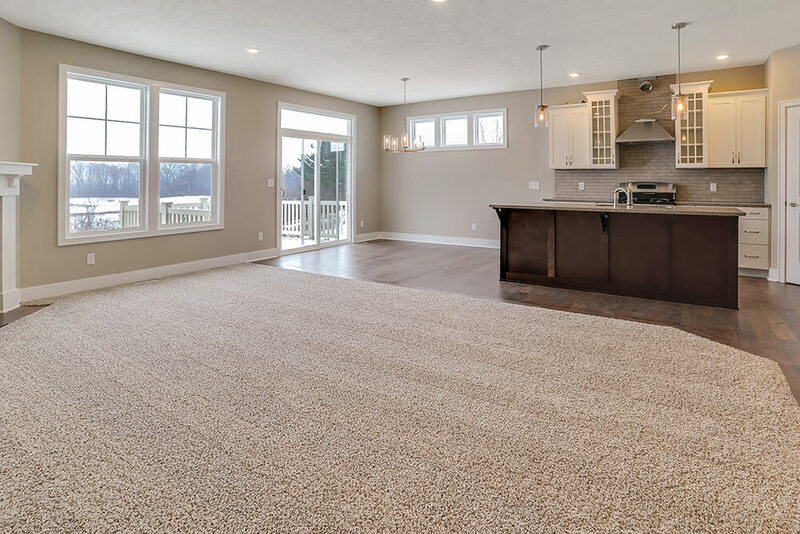 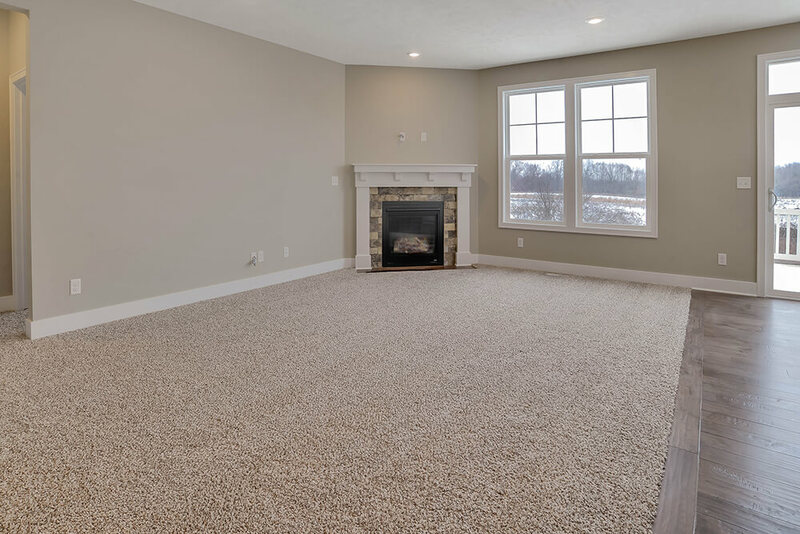 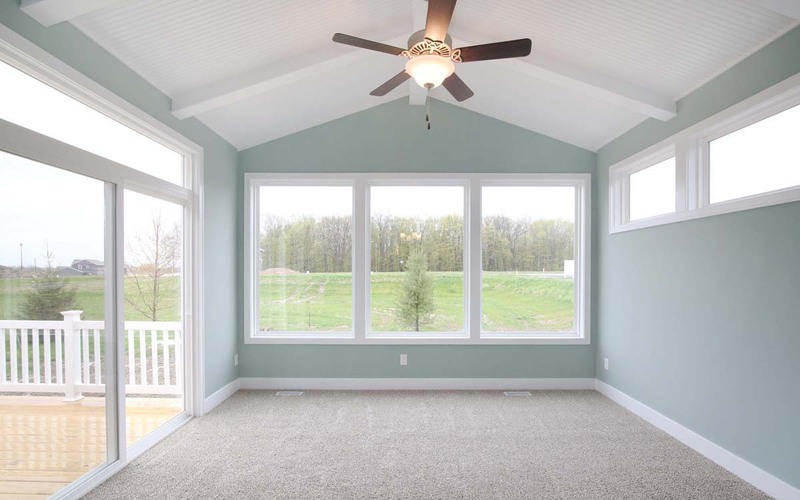 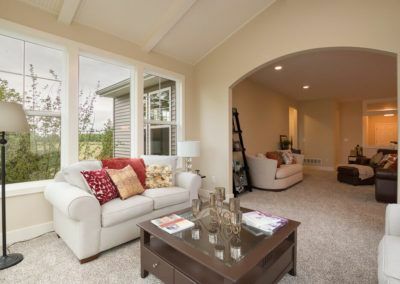 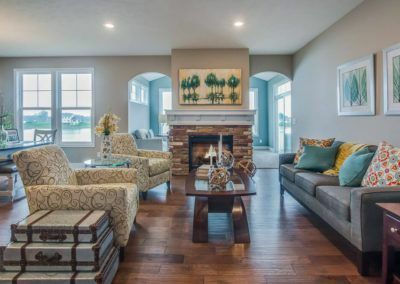 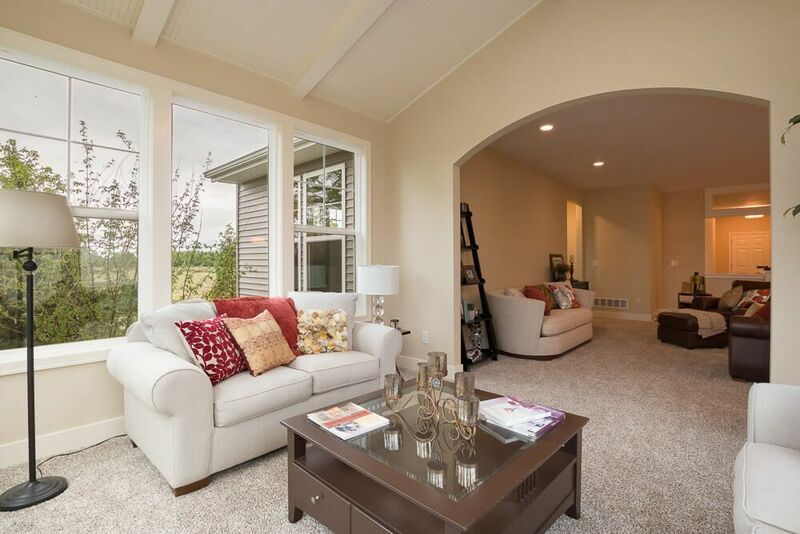 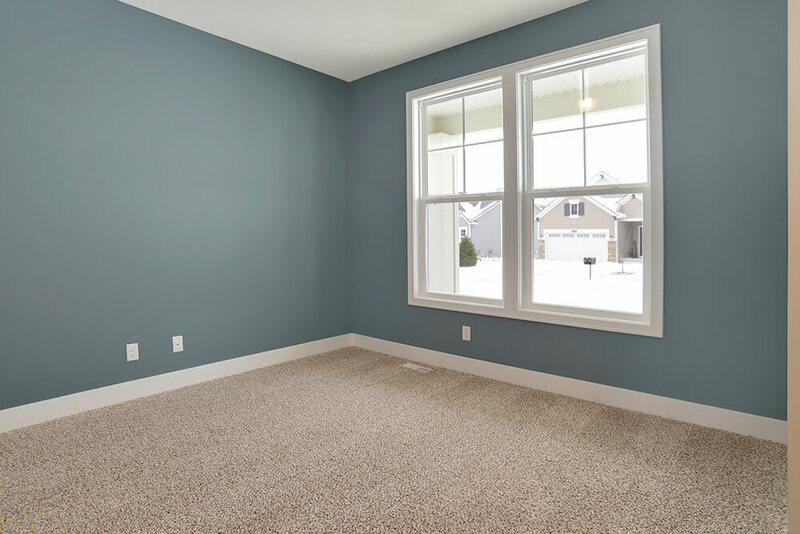 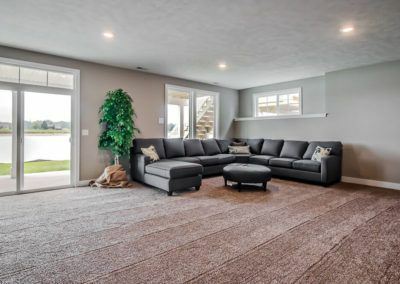 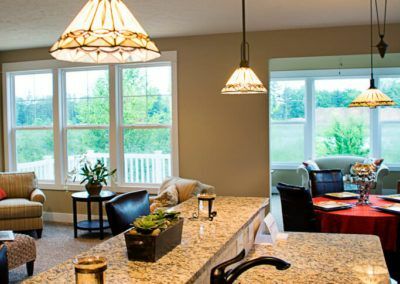 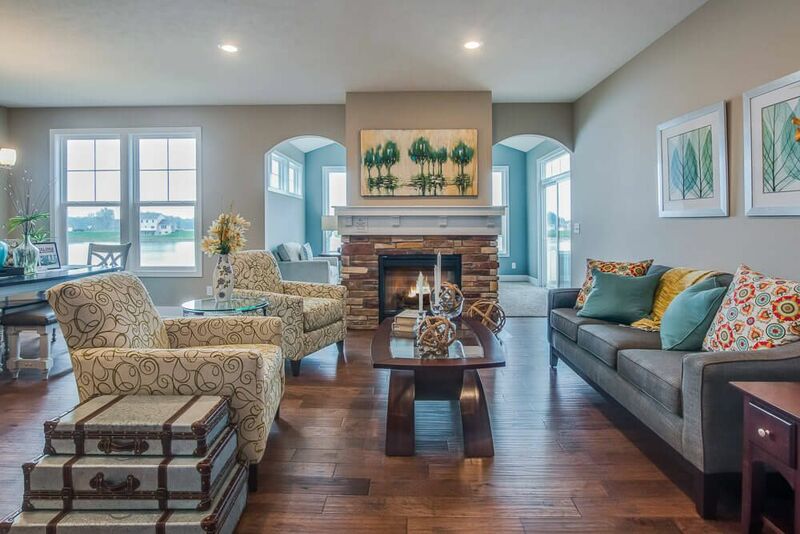 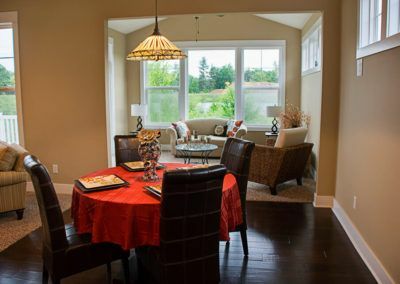 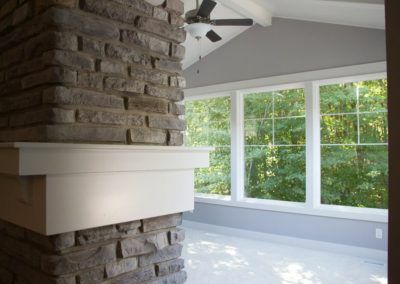 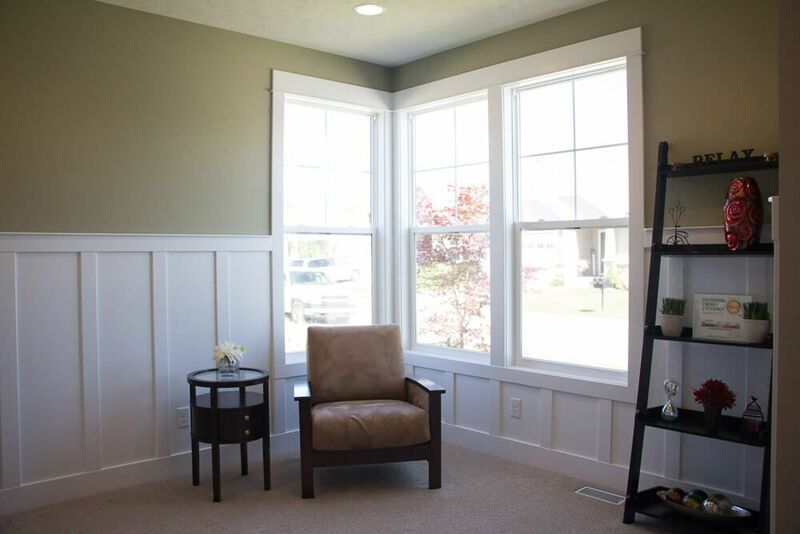 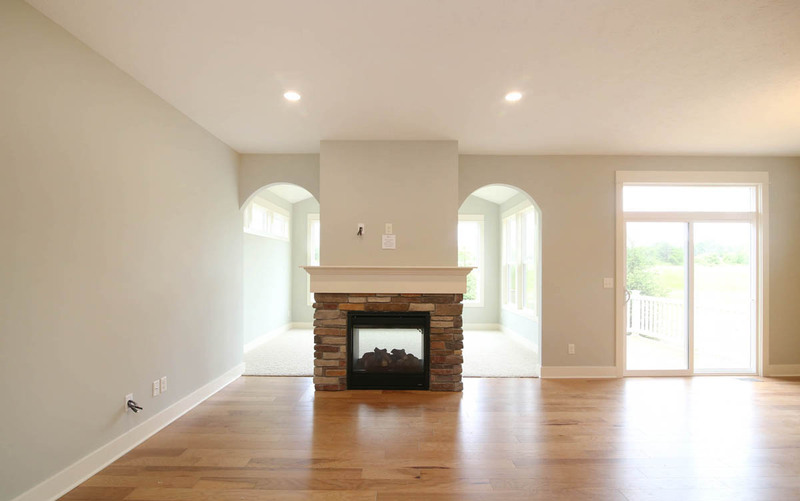 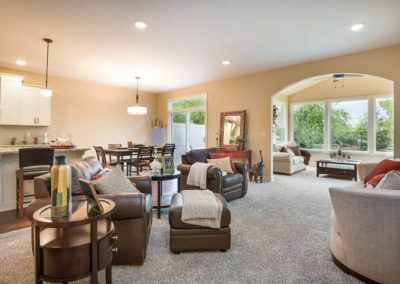 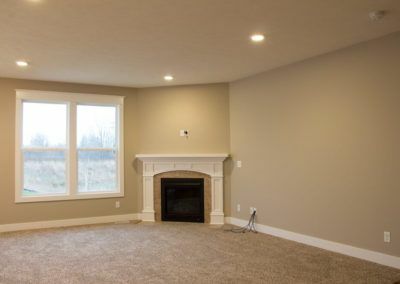 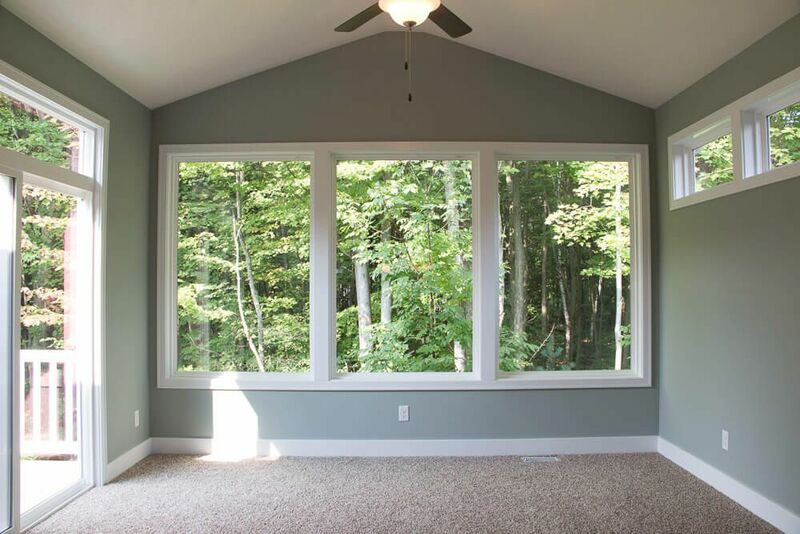 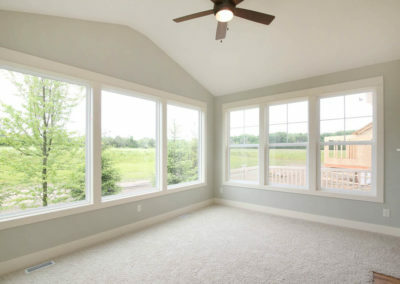 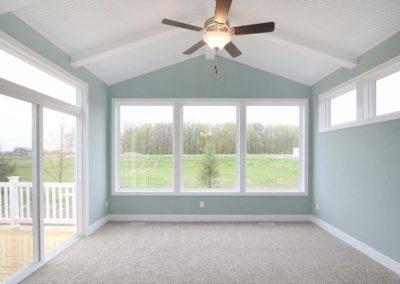 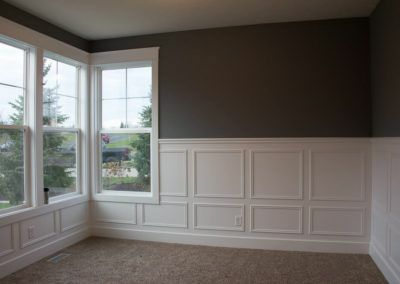 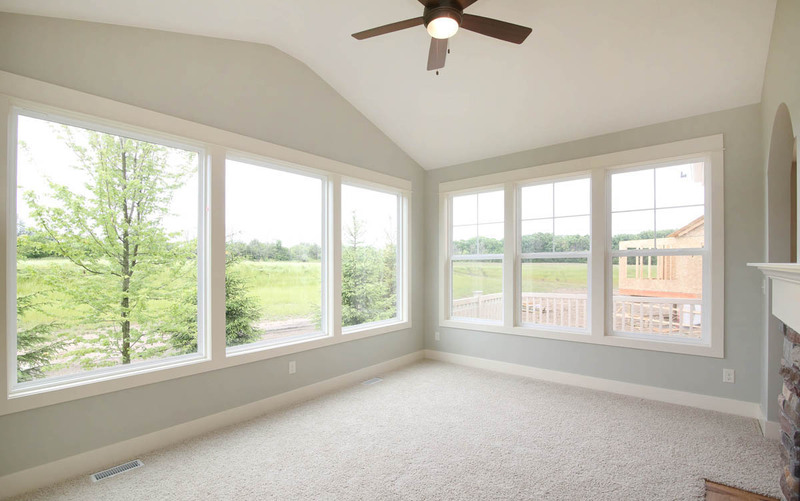 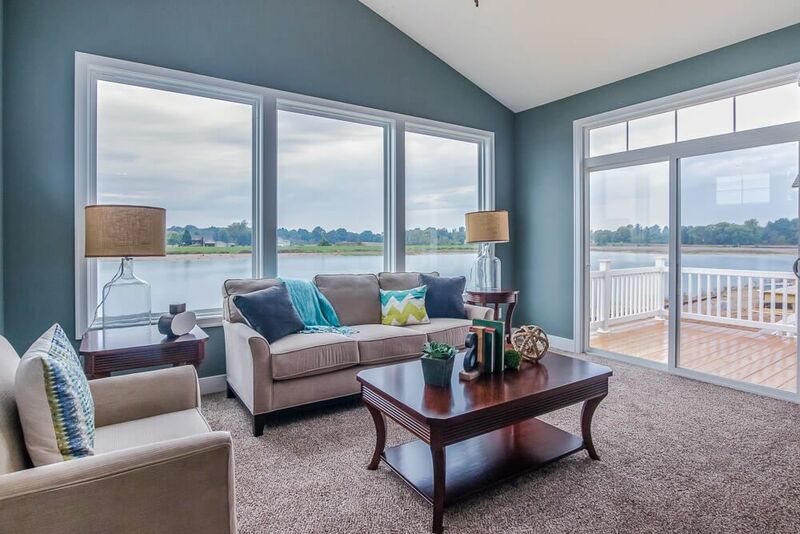 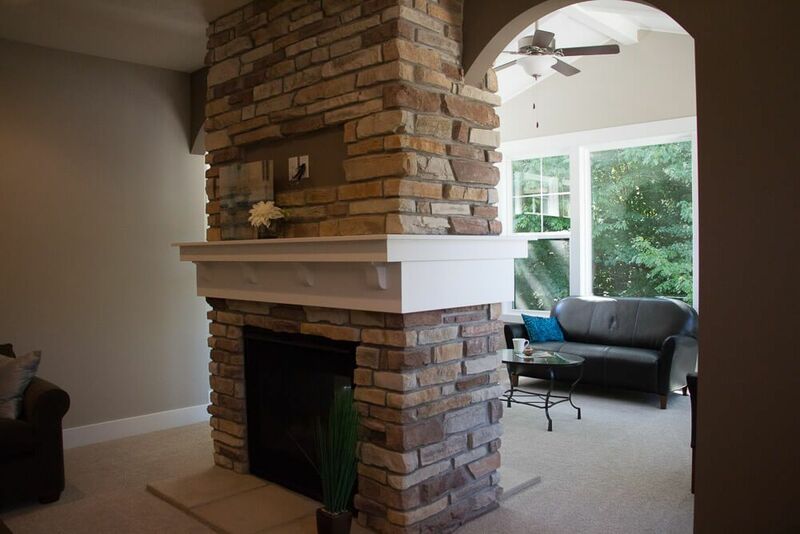 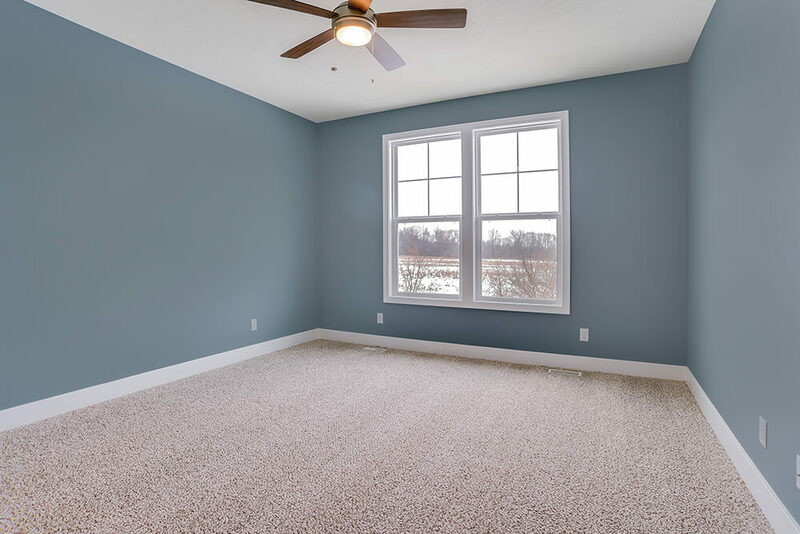 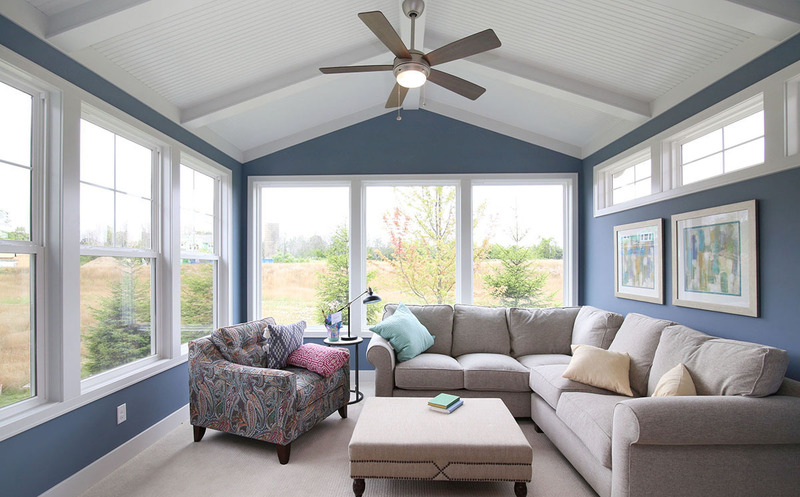 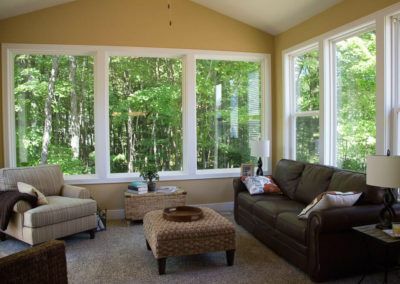 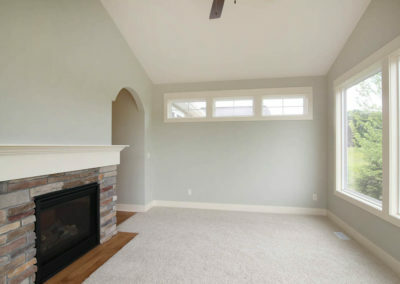 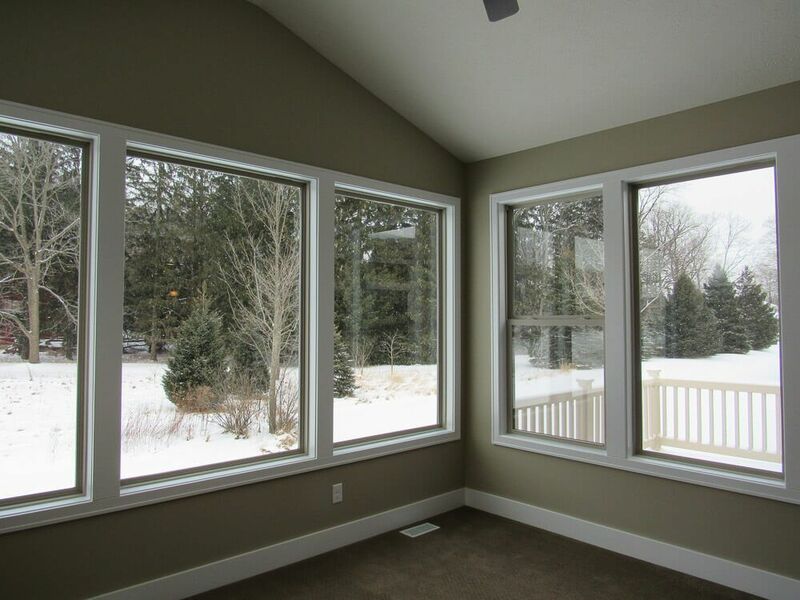 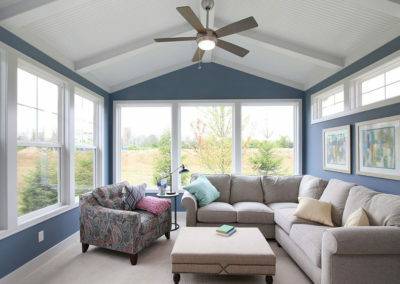 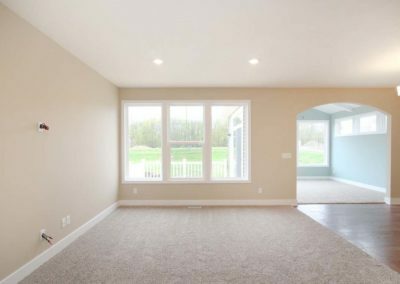 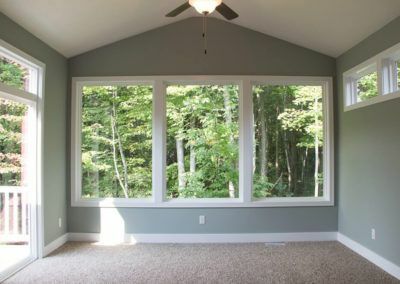 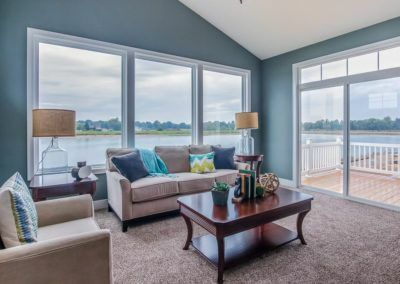 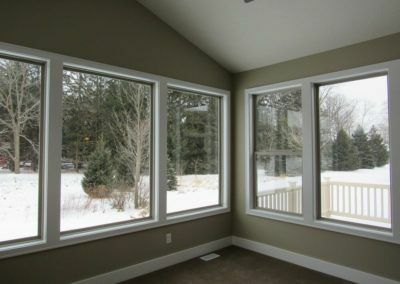 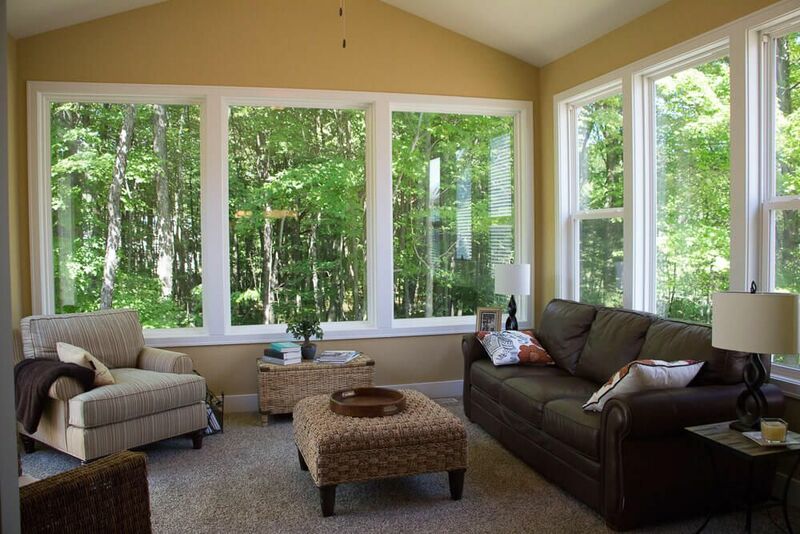 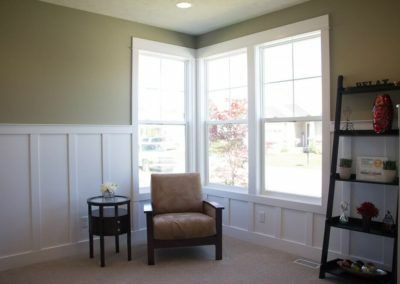 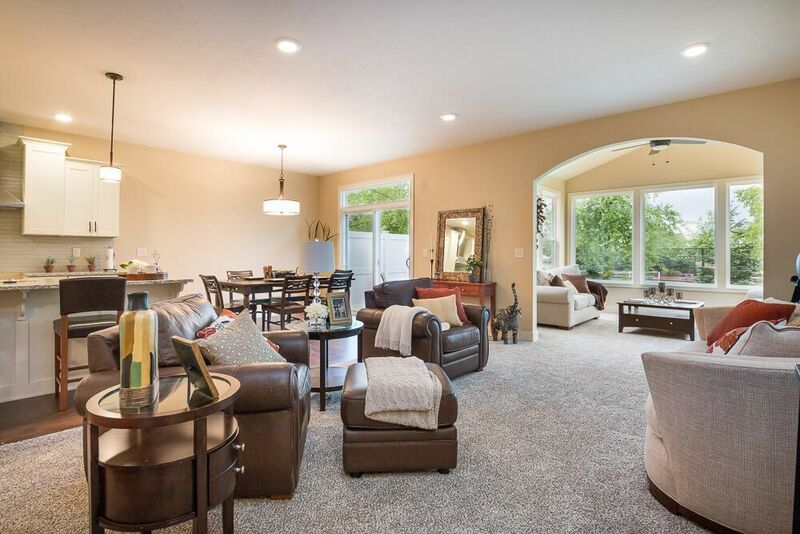 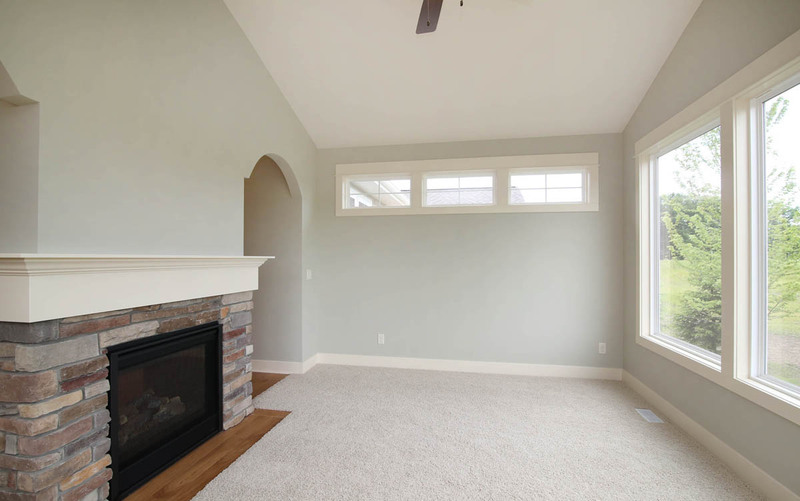 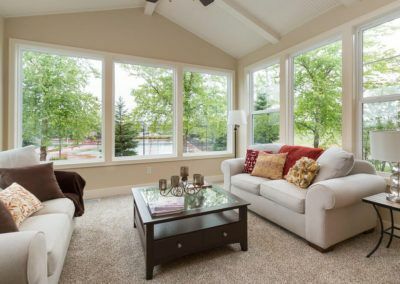 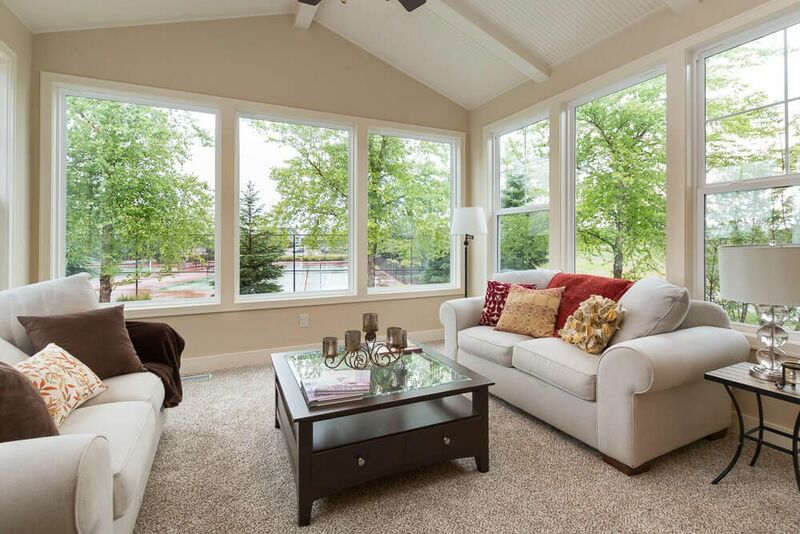 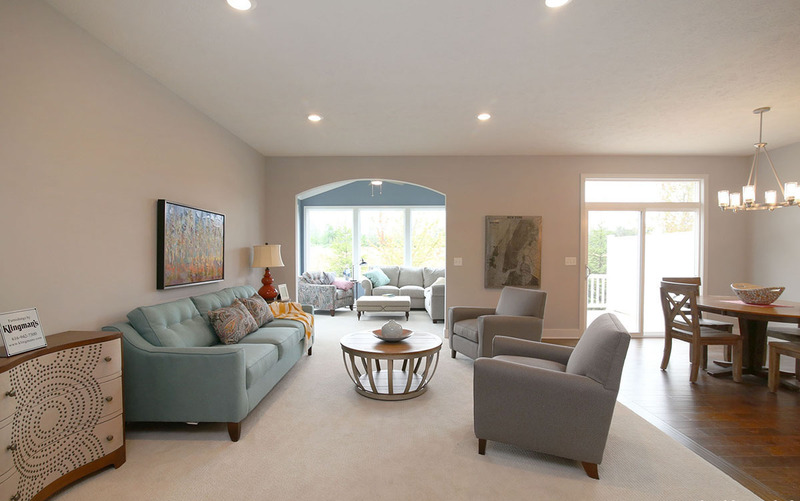 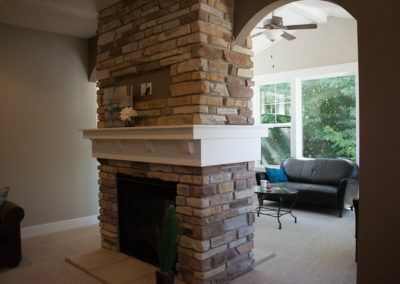 The generous living room offers large windows or the option to add a sunny Michigan room with a cathedral ceiling, providing expansive views and even more flexible space in your home. 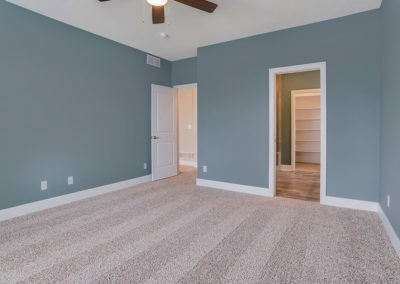 From the great room the master suit offers a sizable bedroom, full bath with linen closet and optional double sink, and a large walk-in closet. 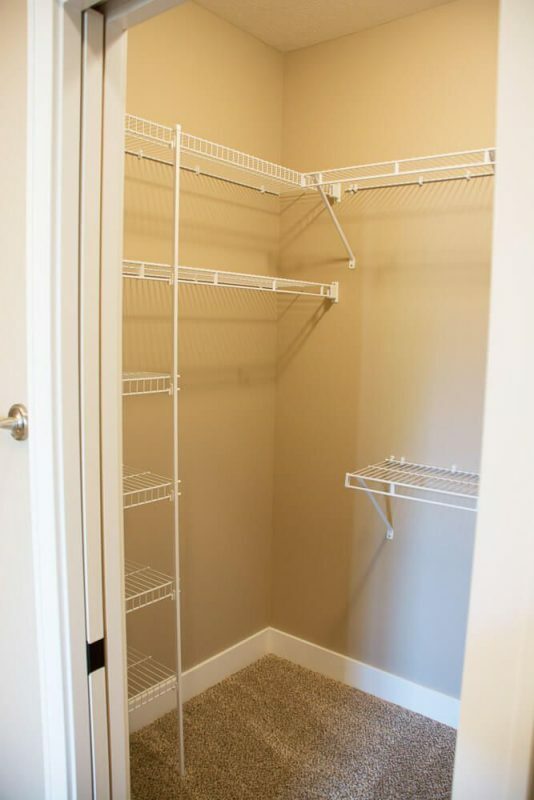 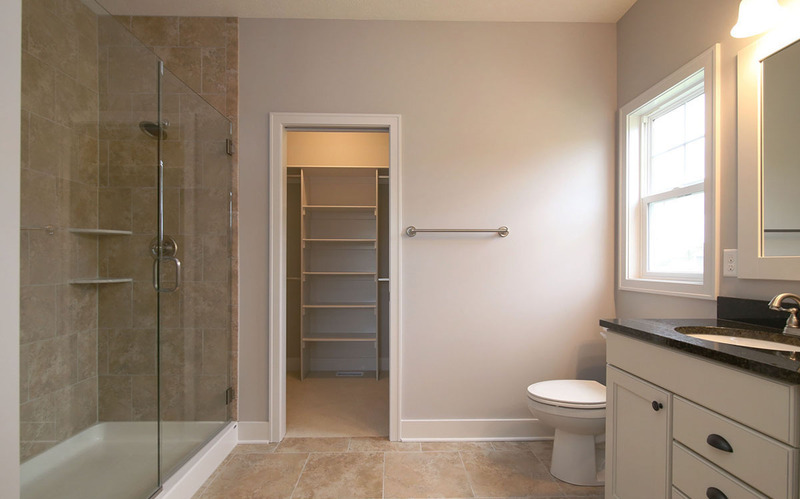 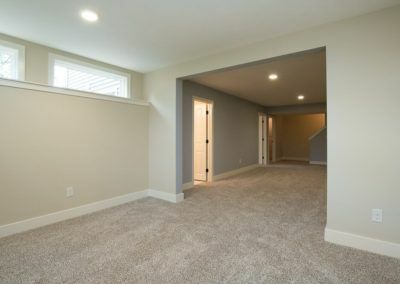 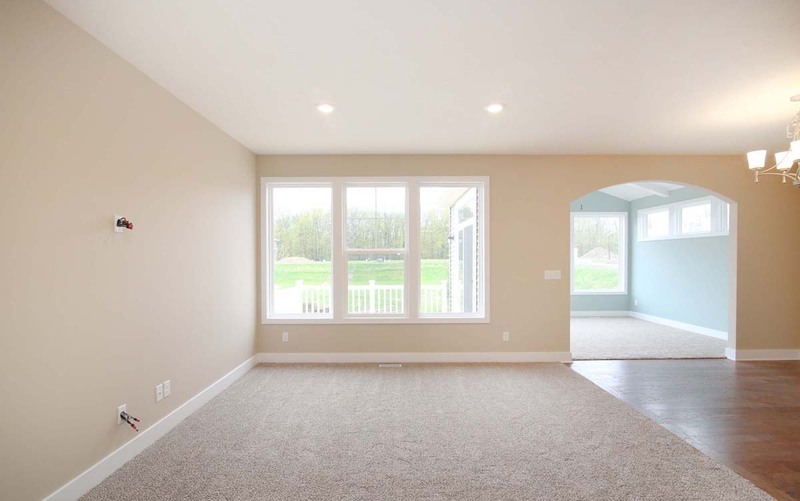 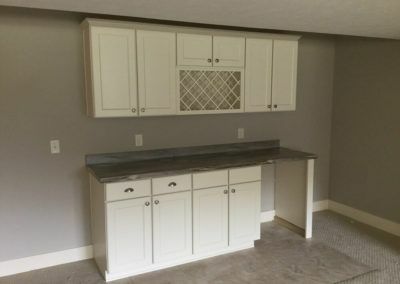 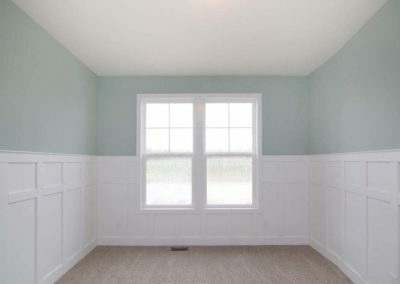 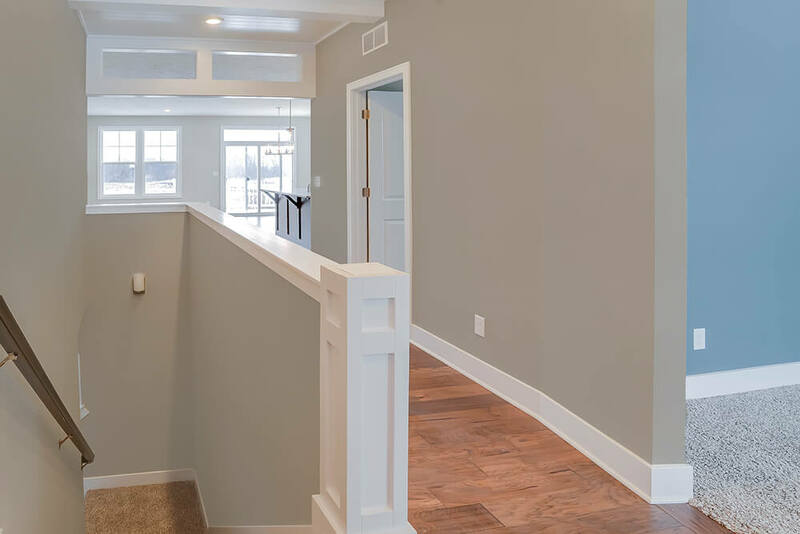 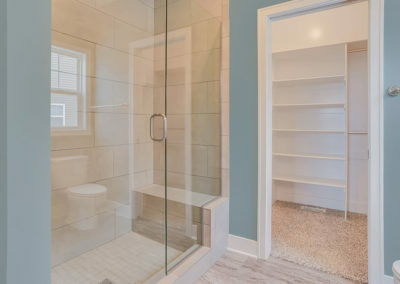 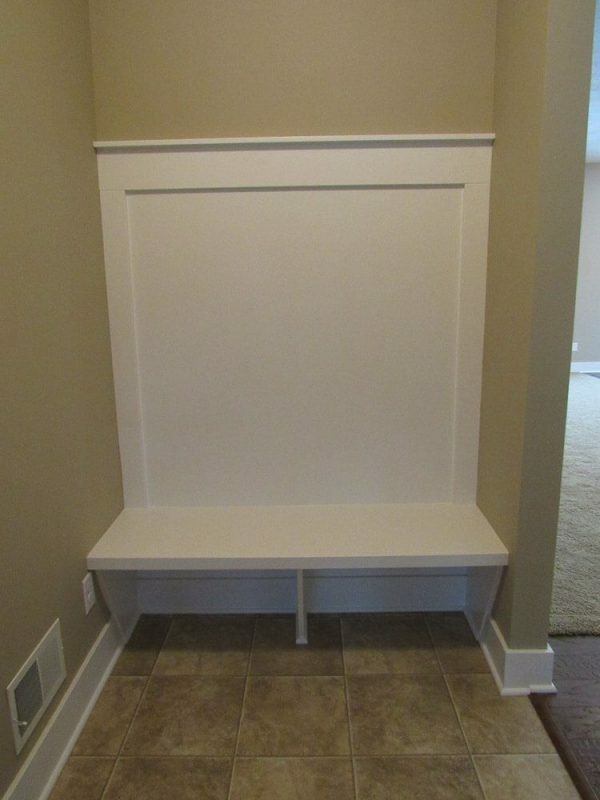 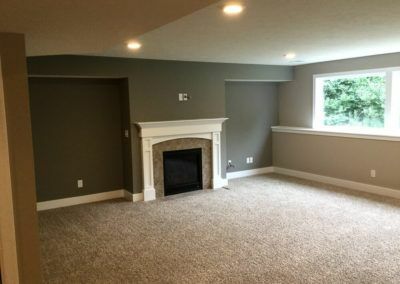 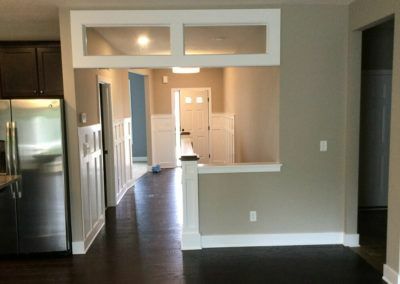 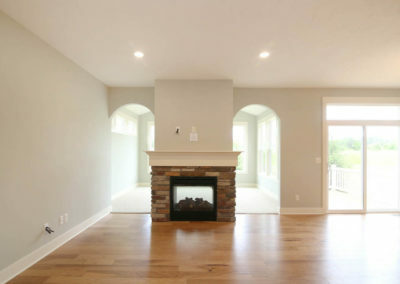 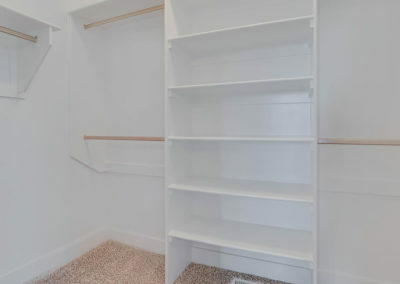 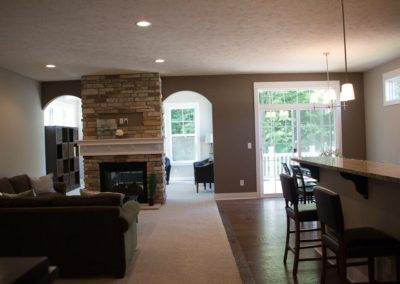 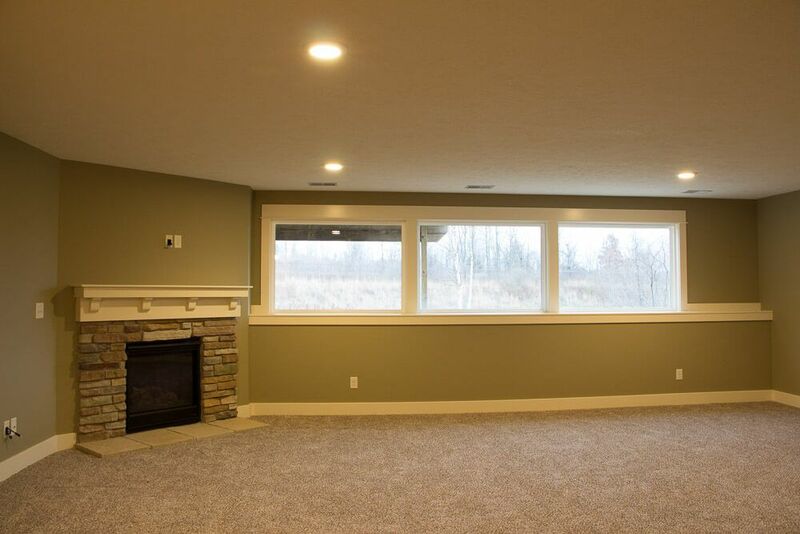 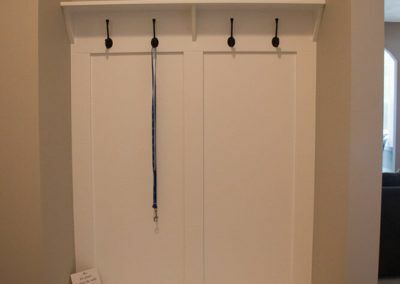 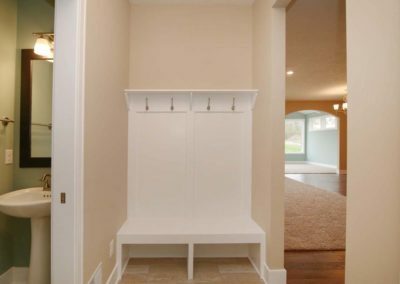 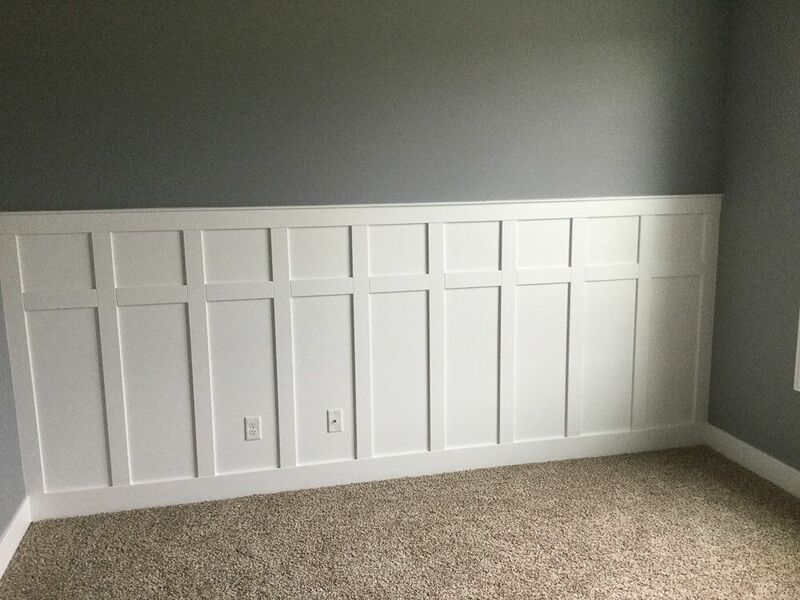 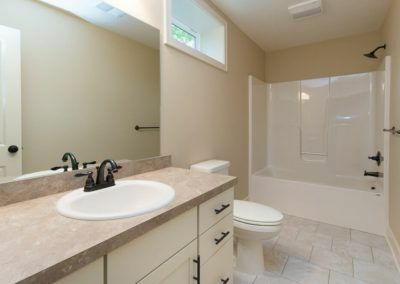 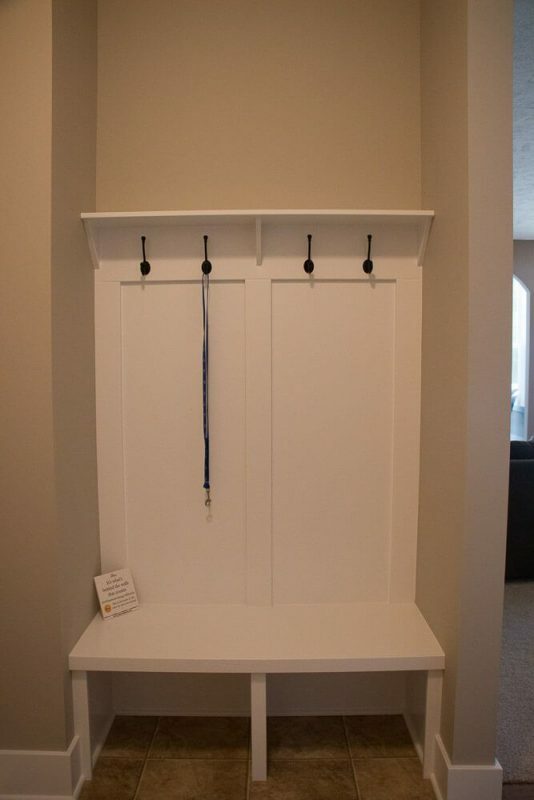 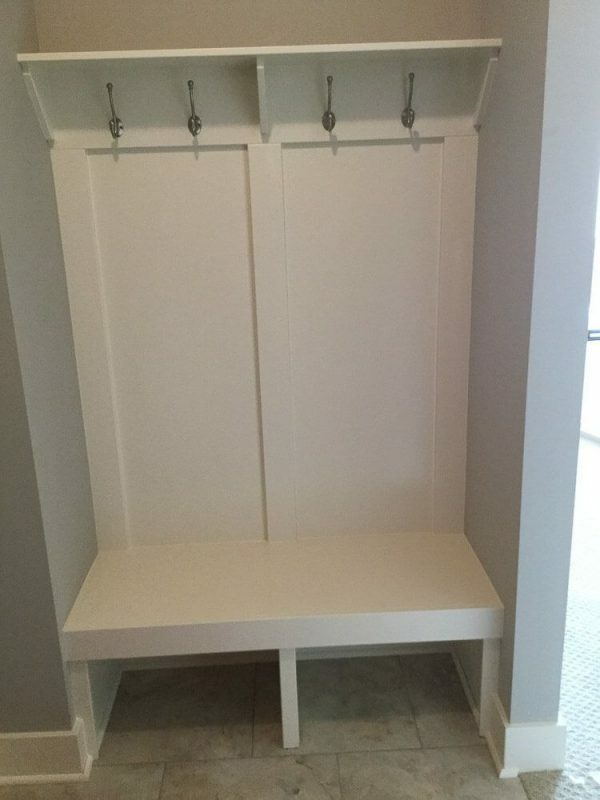 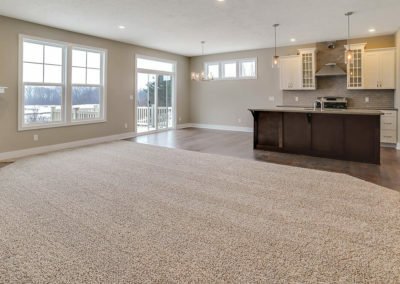 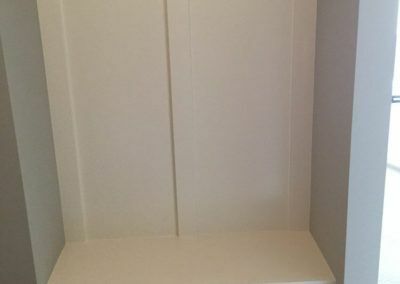 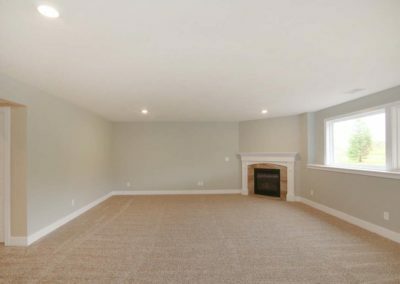 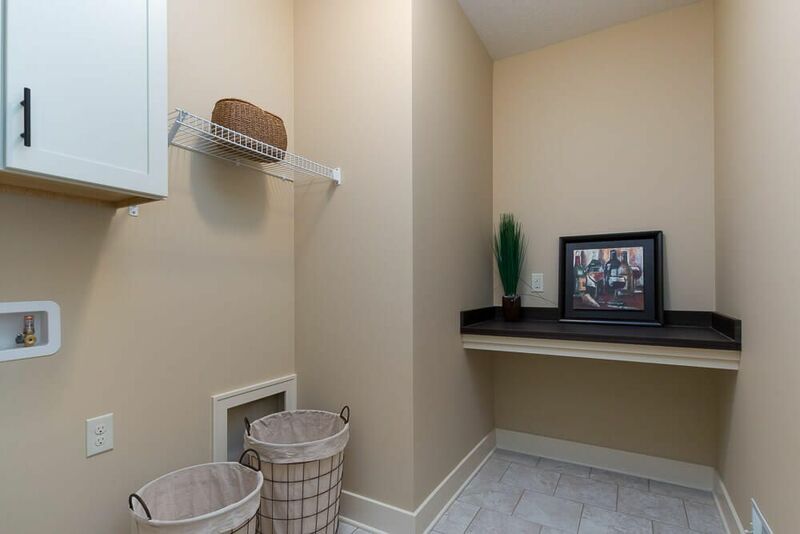 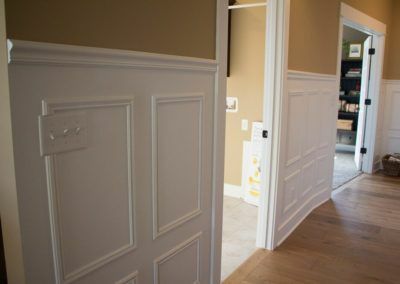 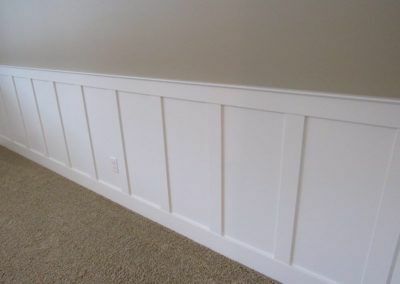 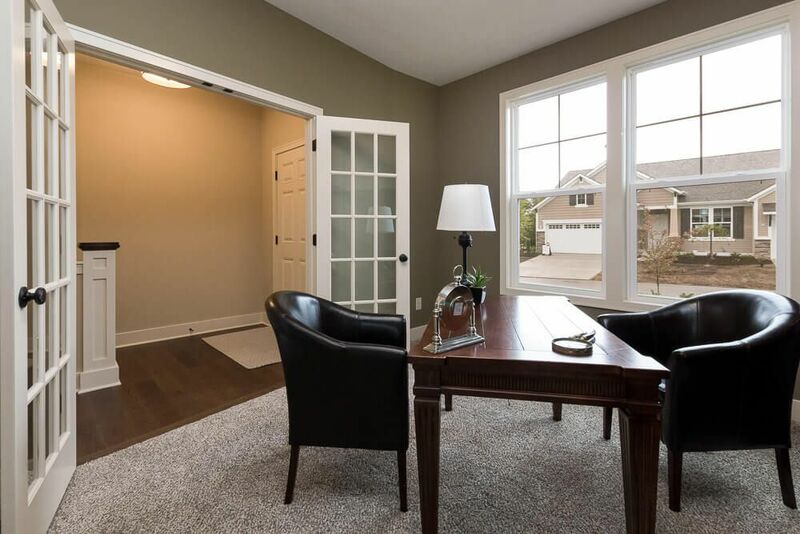 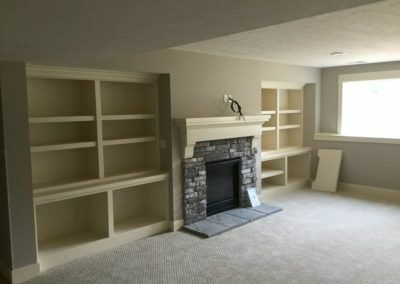 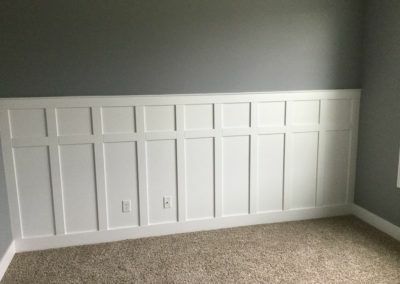 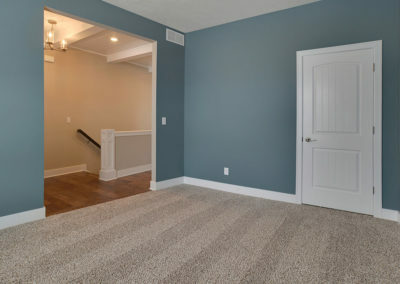 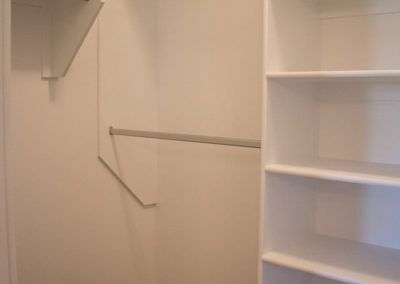 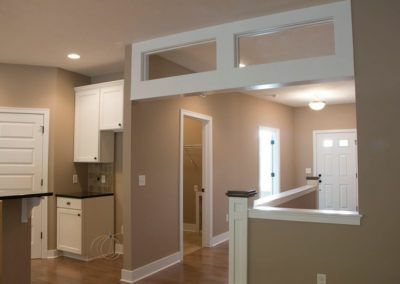 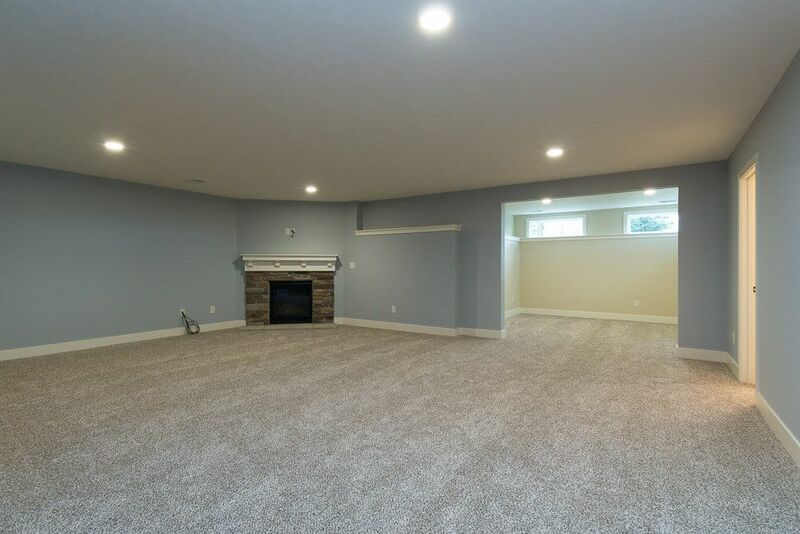 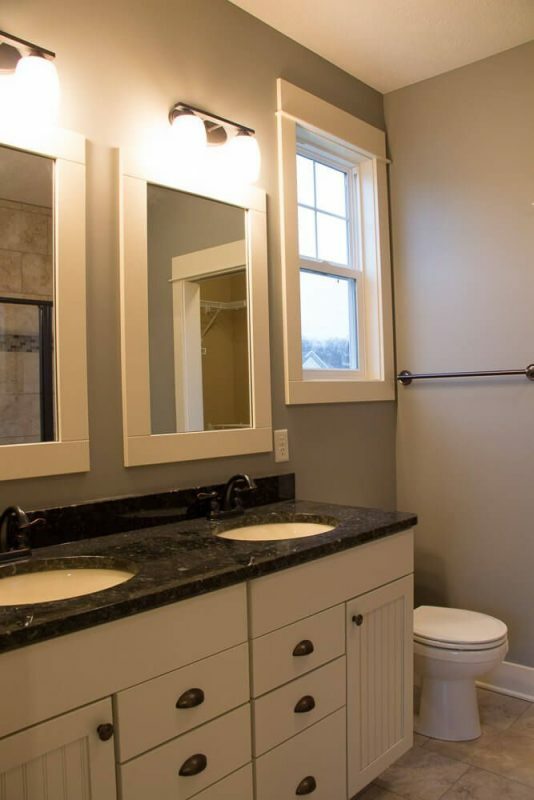 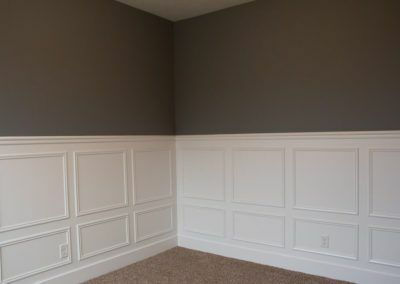 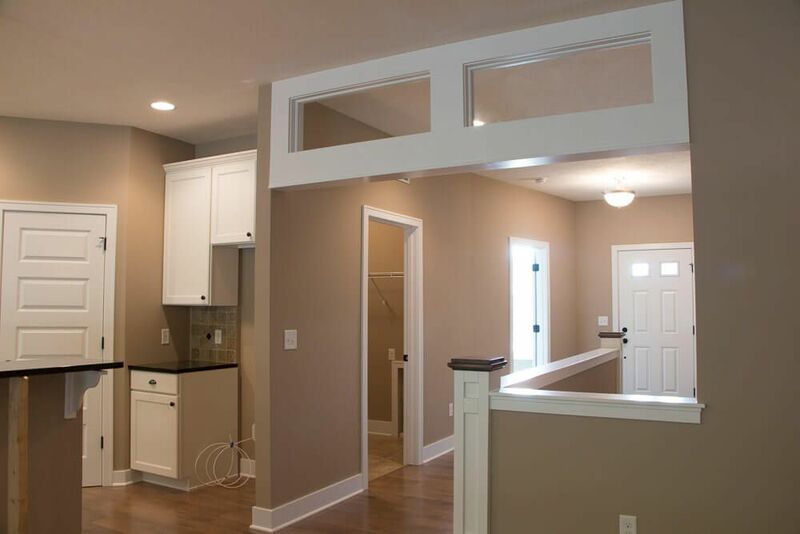 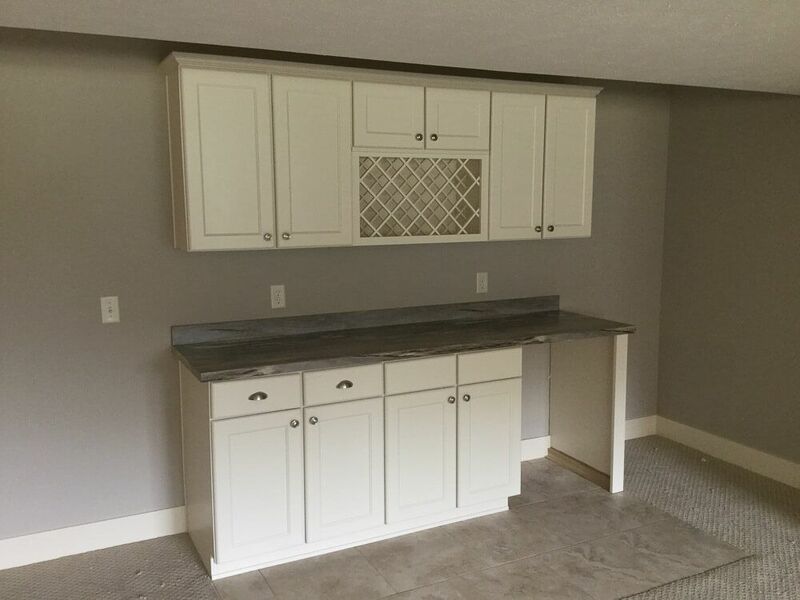 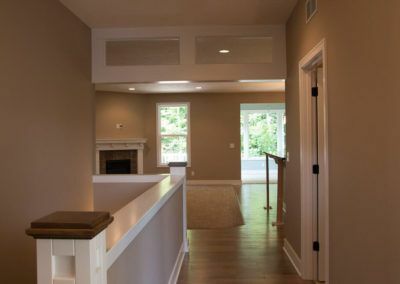 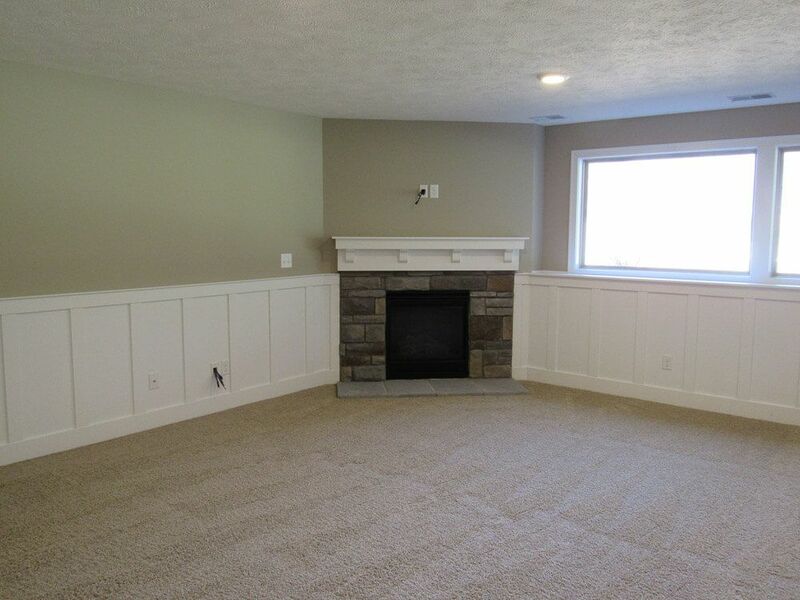 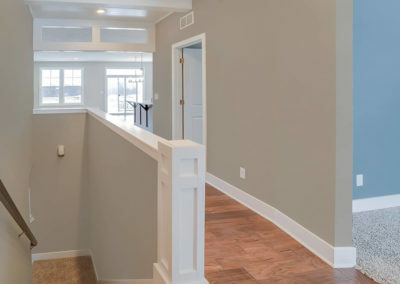 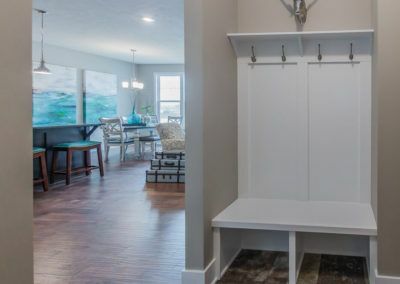 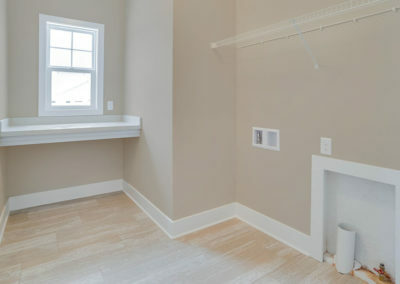 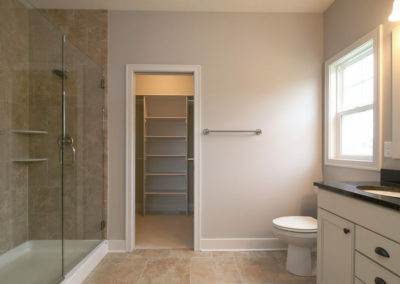 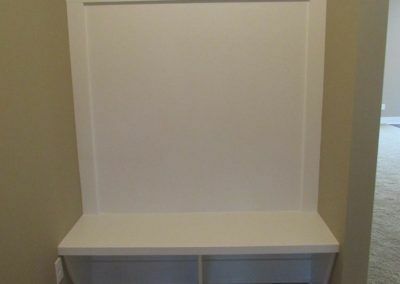 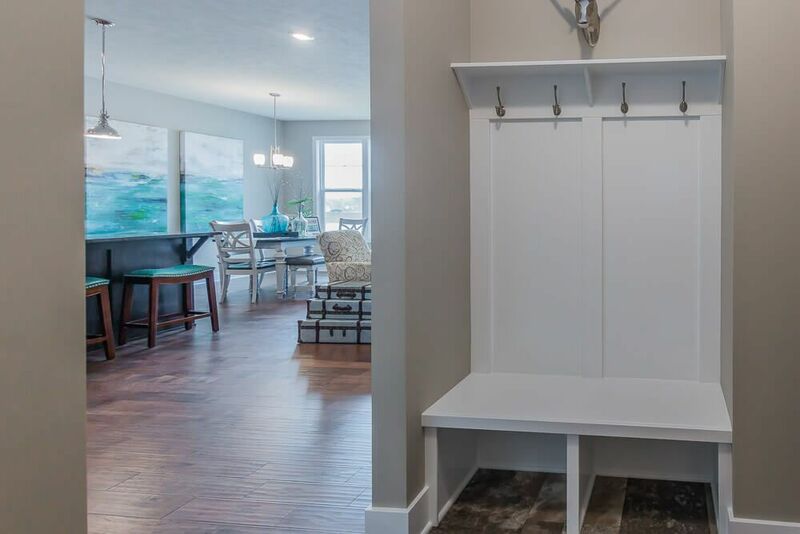 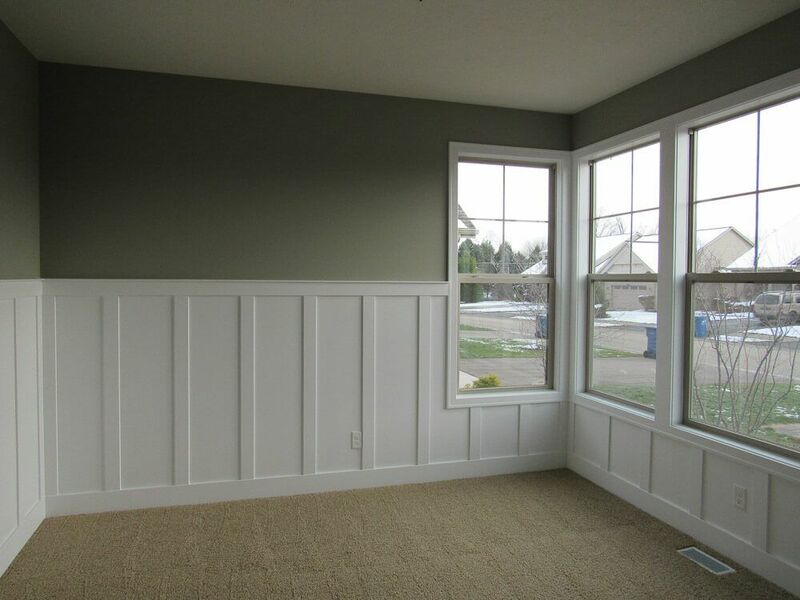 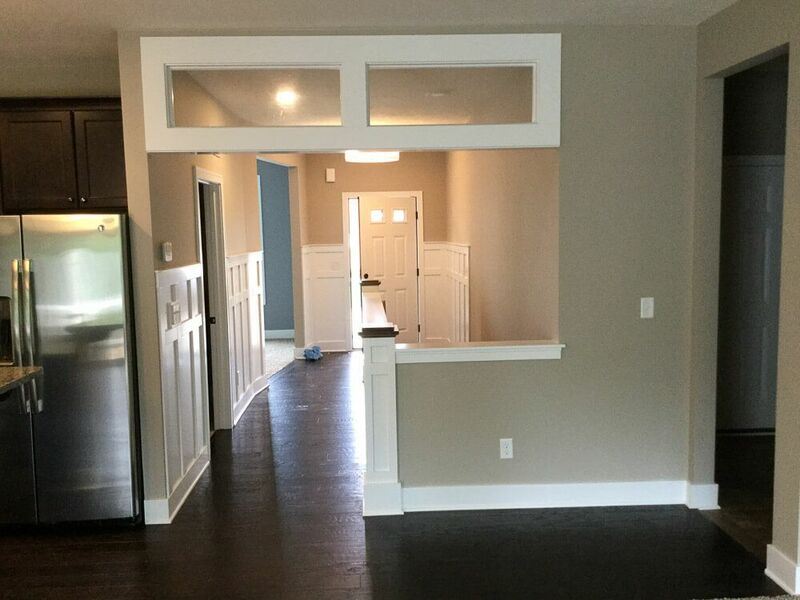 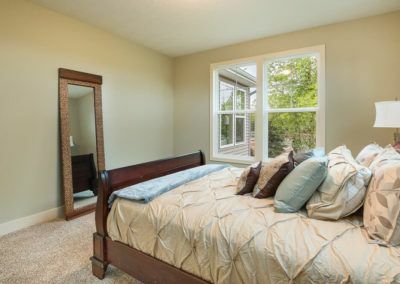 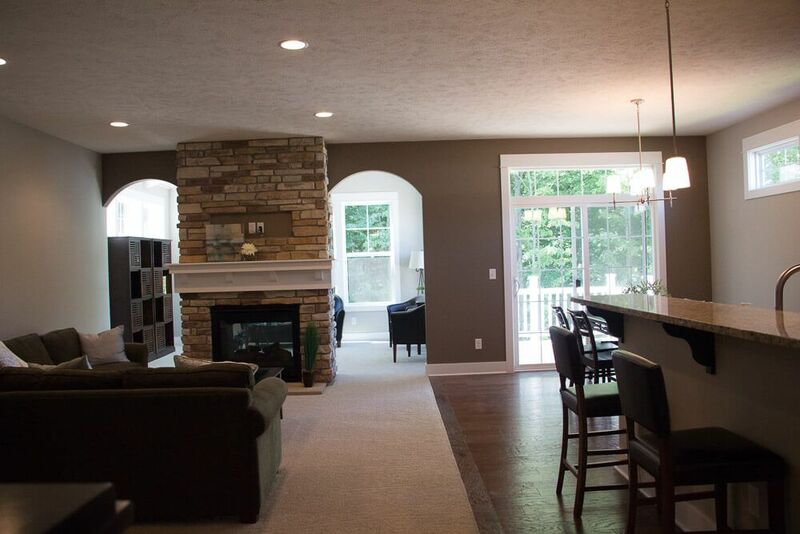 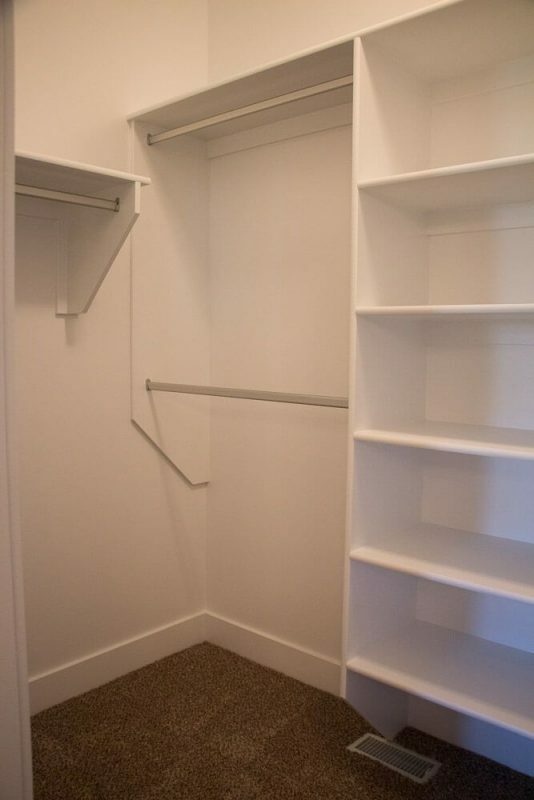 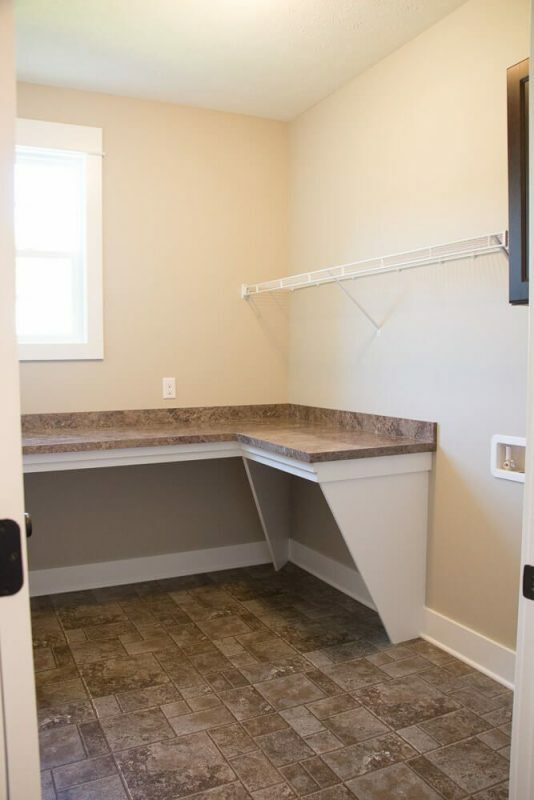 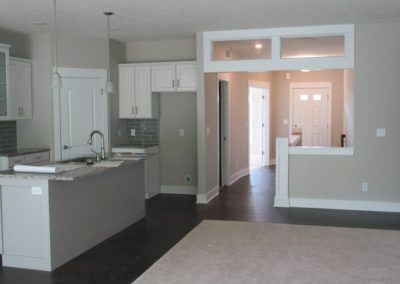 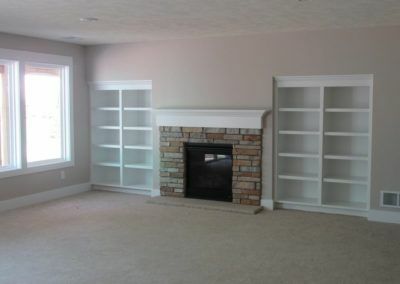 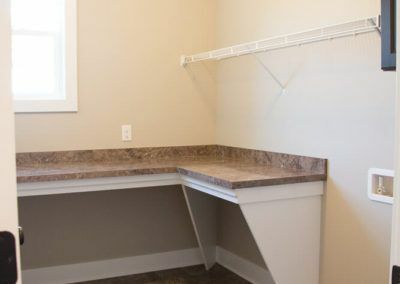 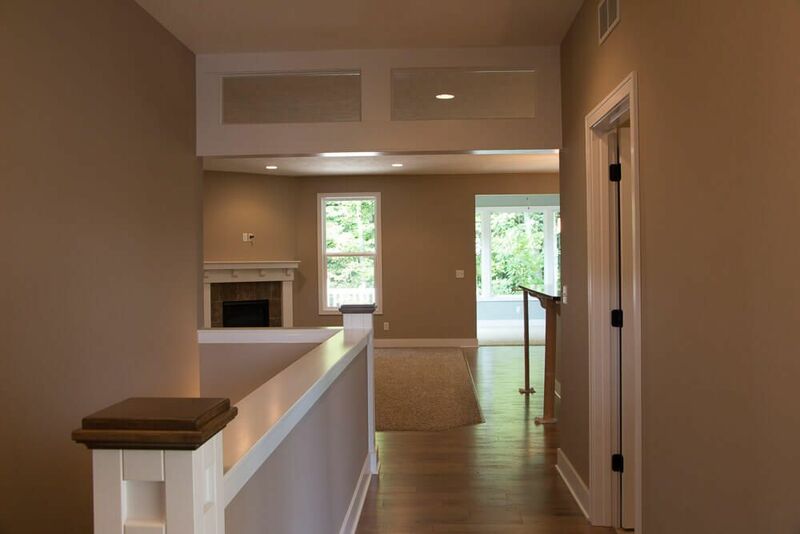 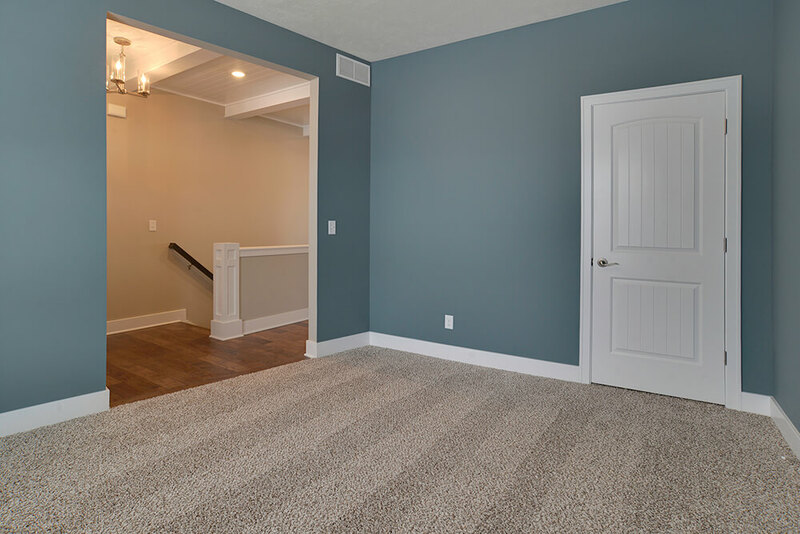 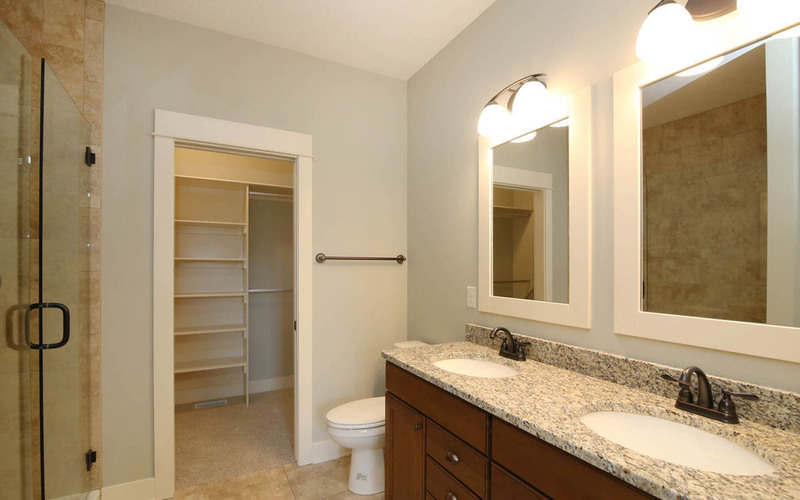 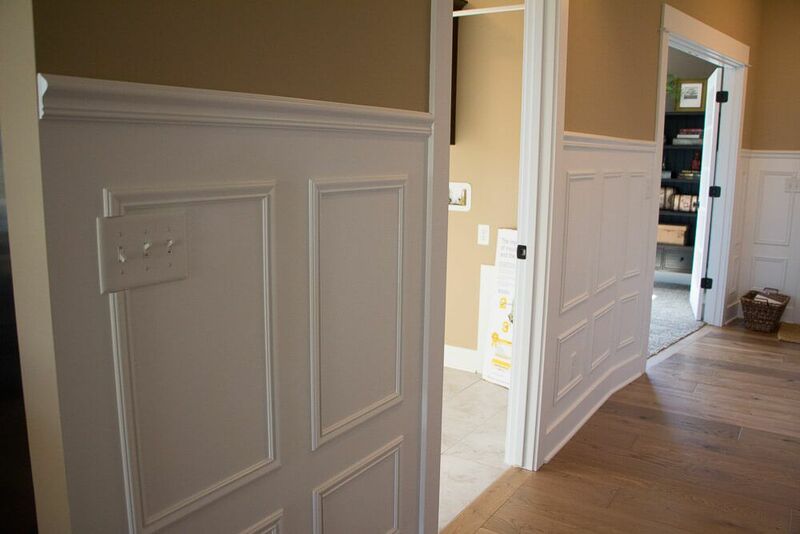 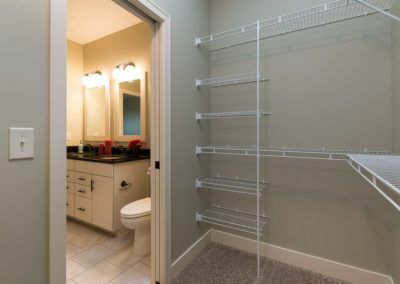 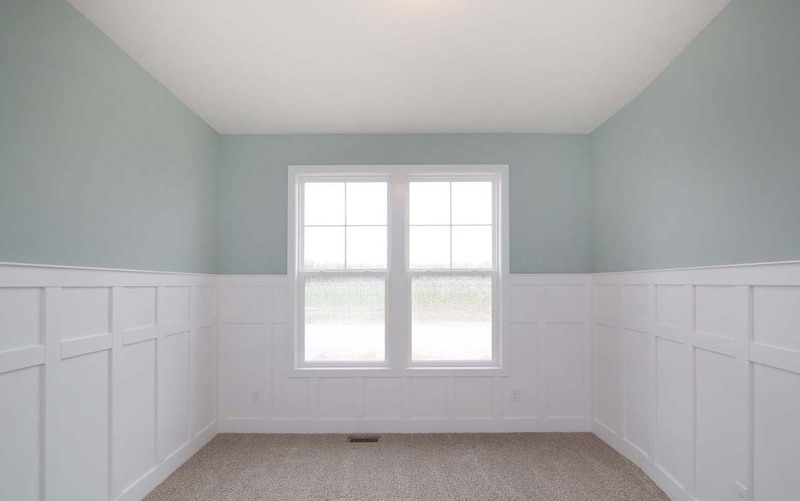 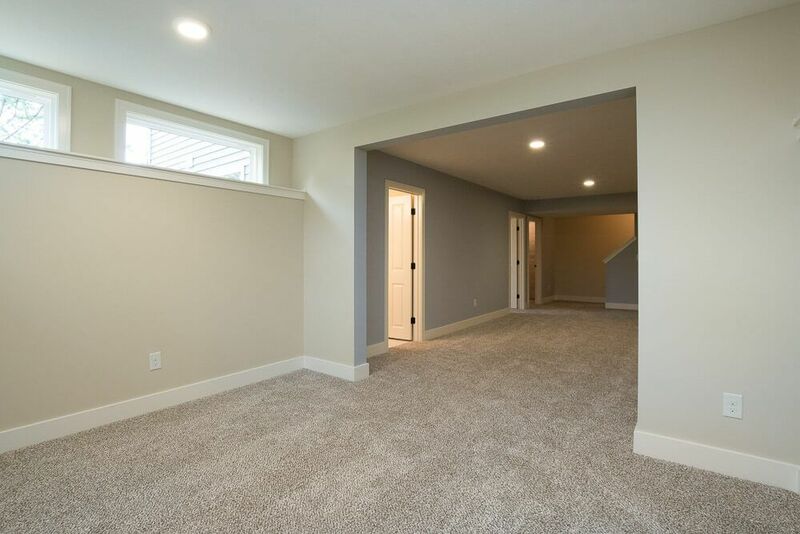 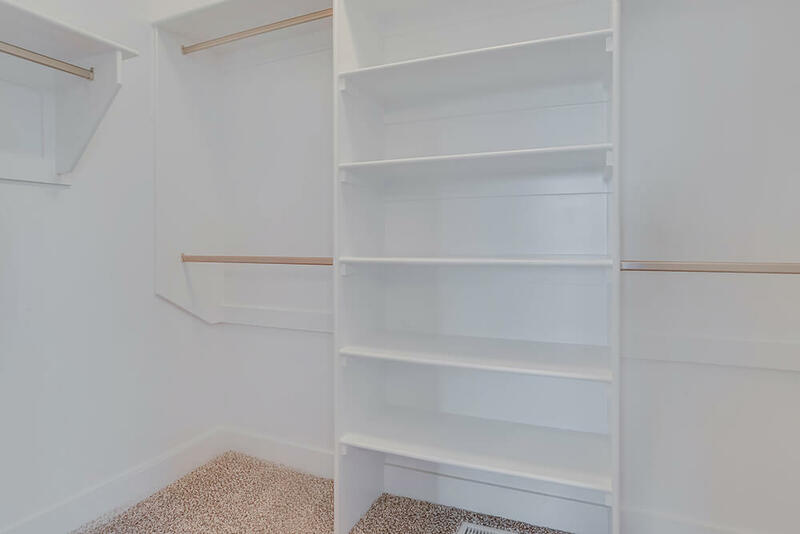 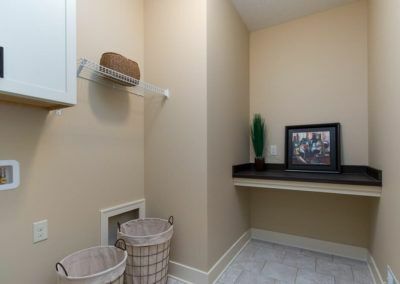 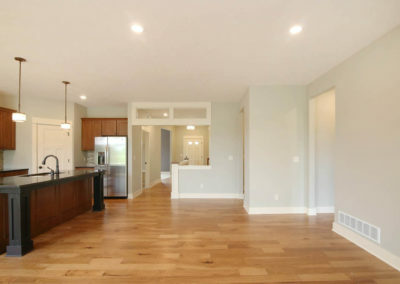 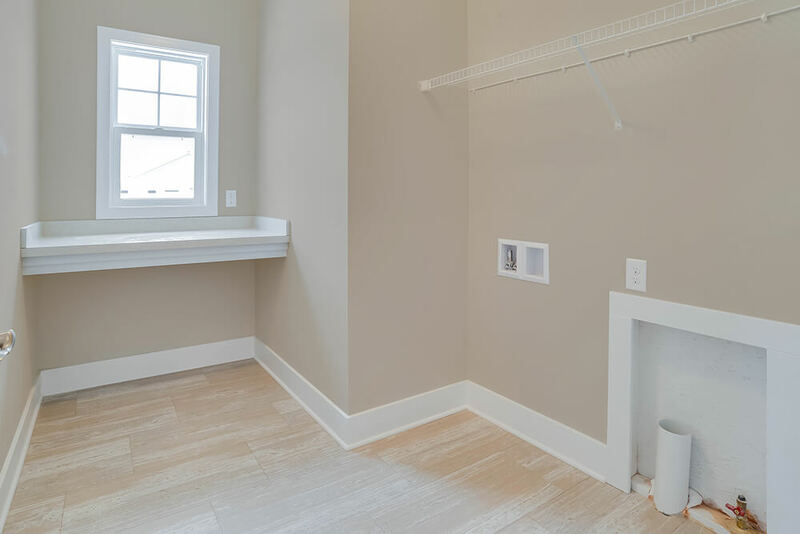 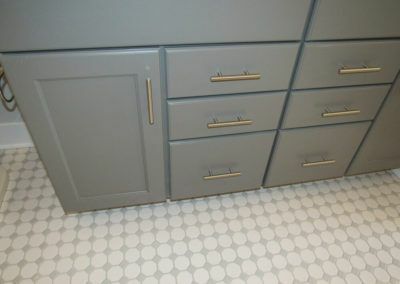 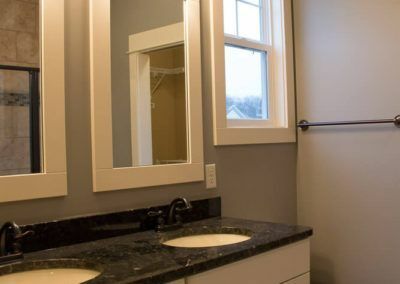 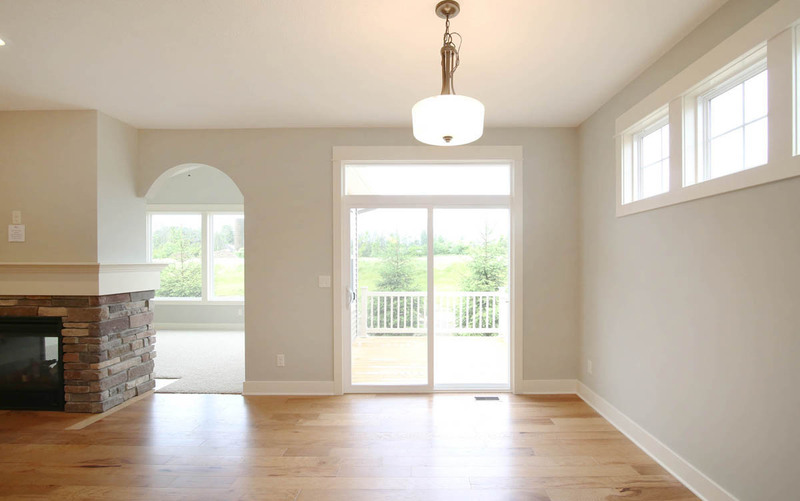 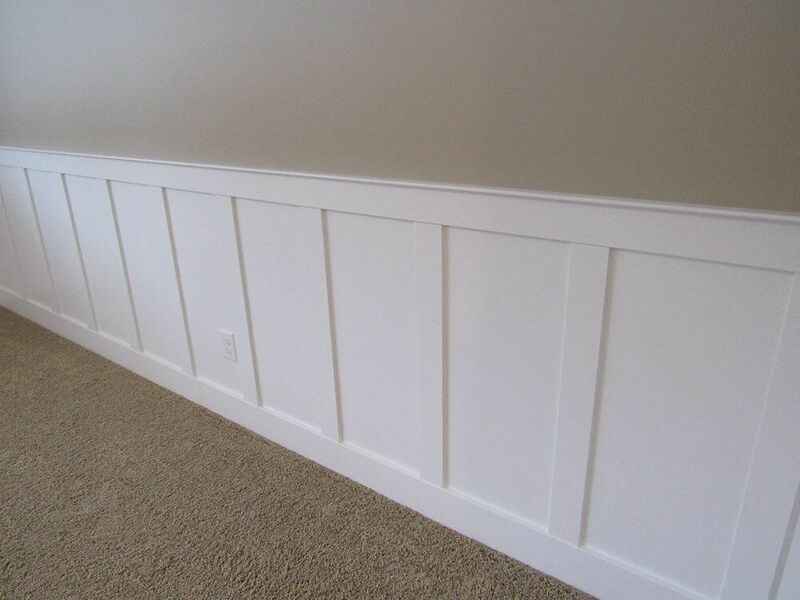 Also connected to the great room, the mudroom links the half bath and two car garage with the main living space. 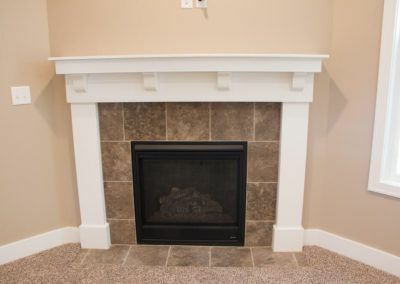 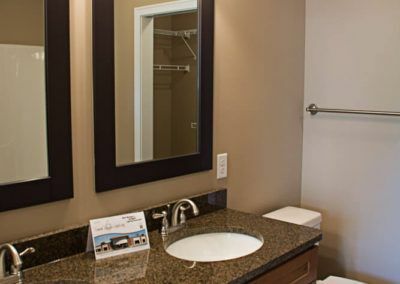 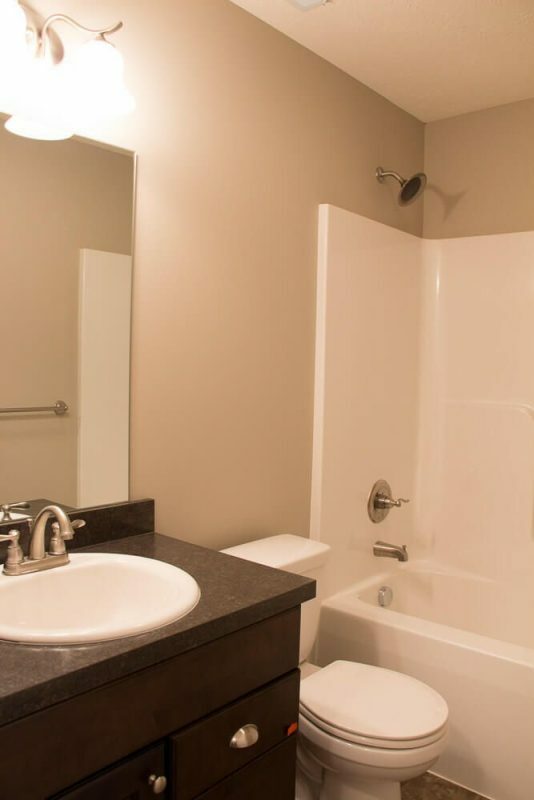 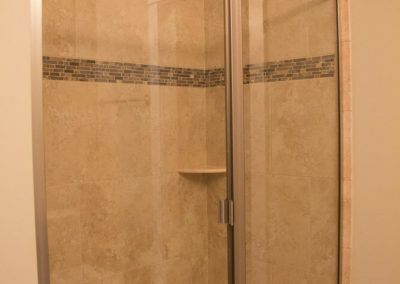 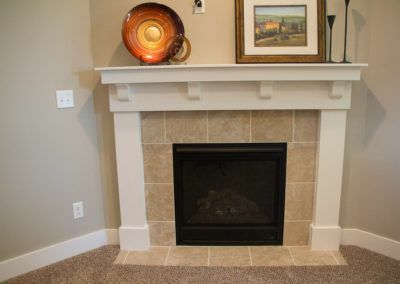 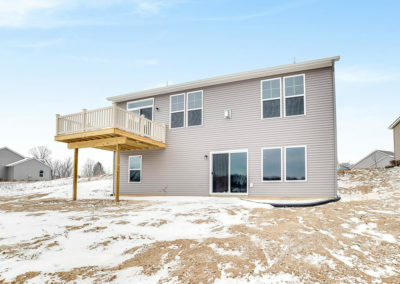 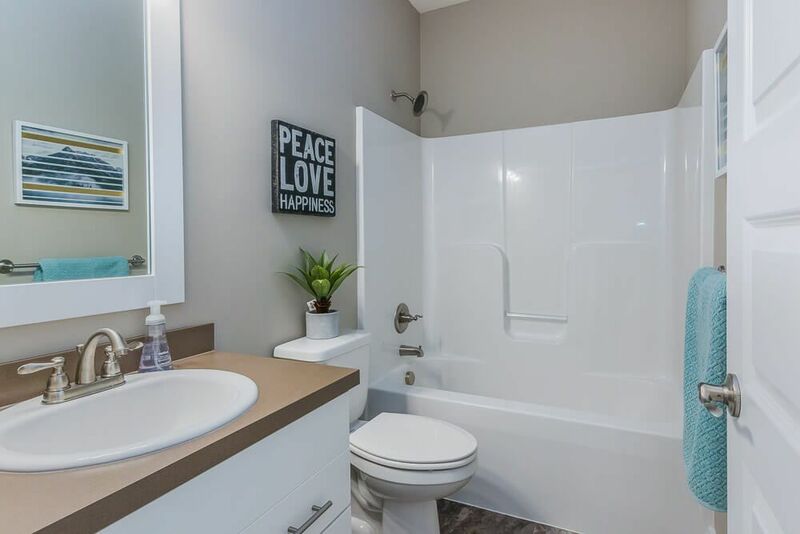 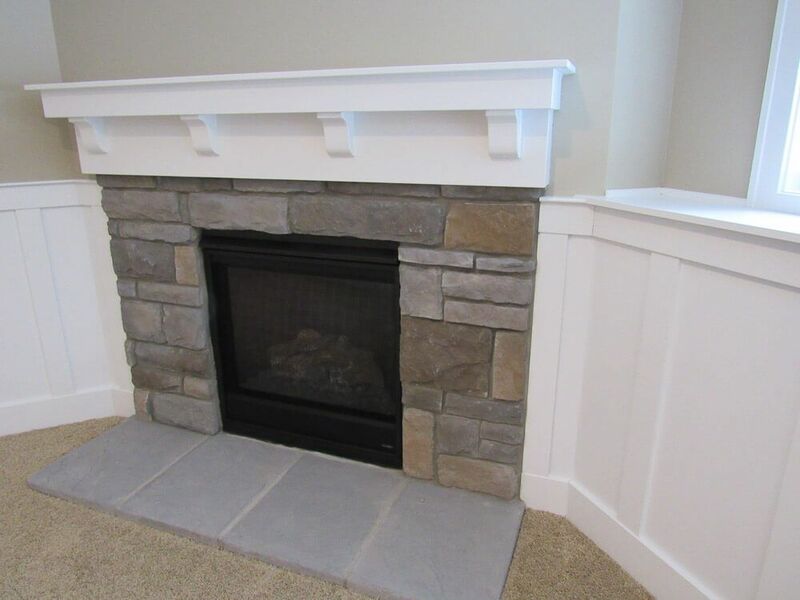 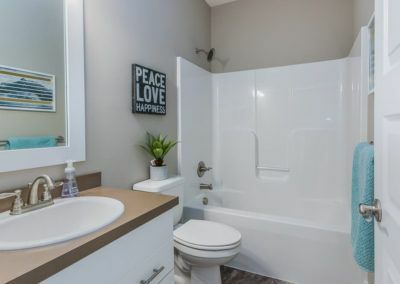 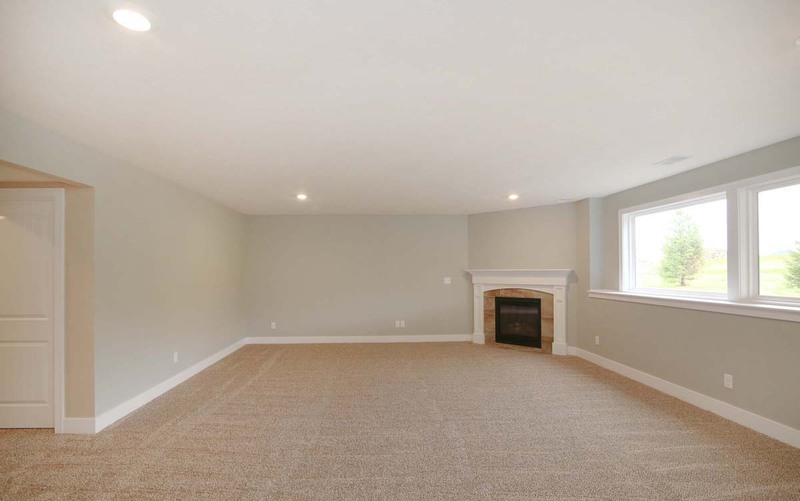 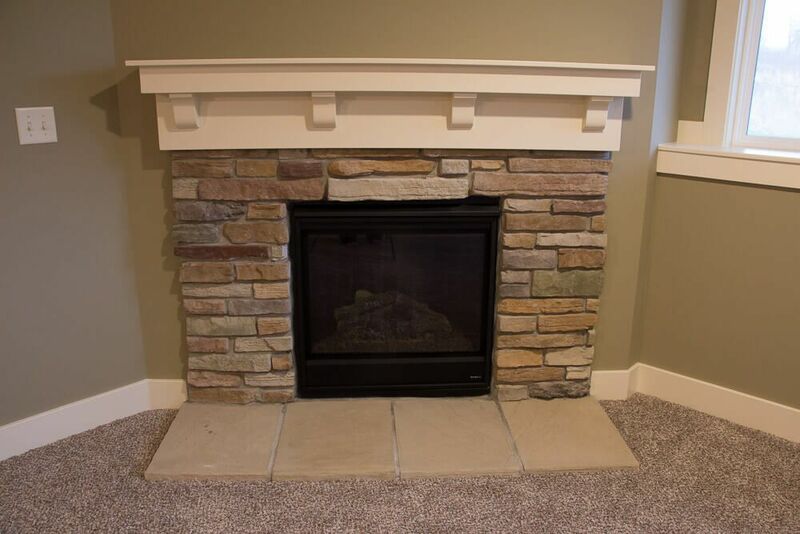 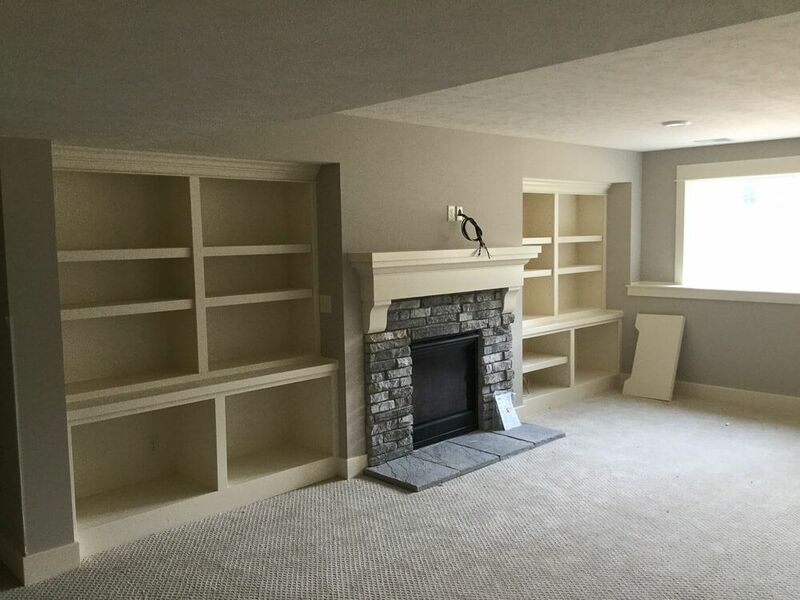 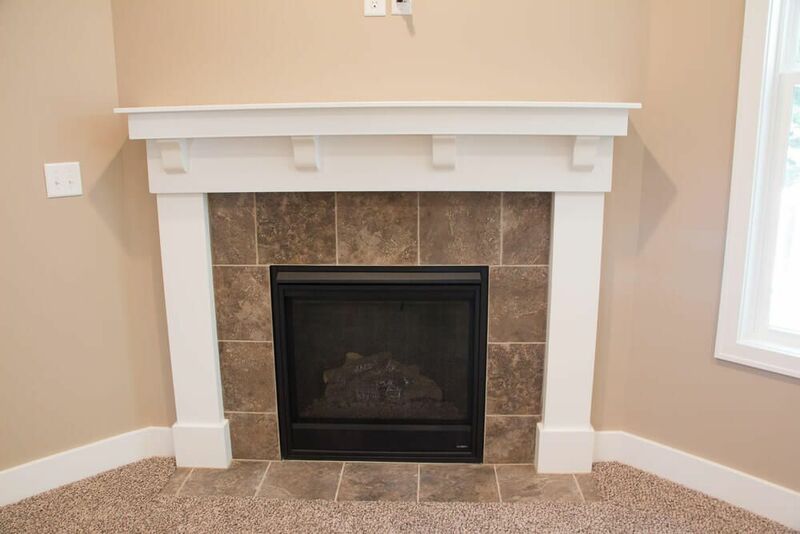 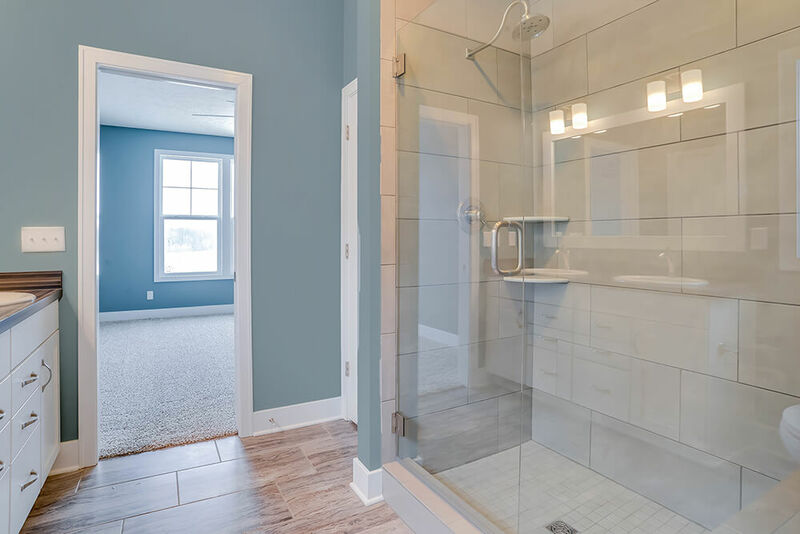 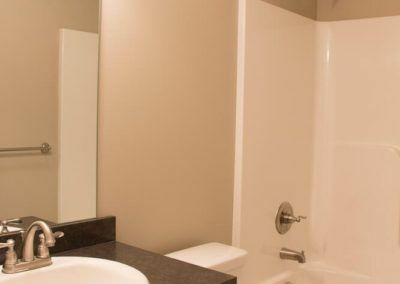 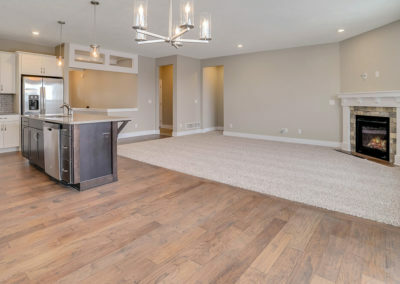 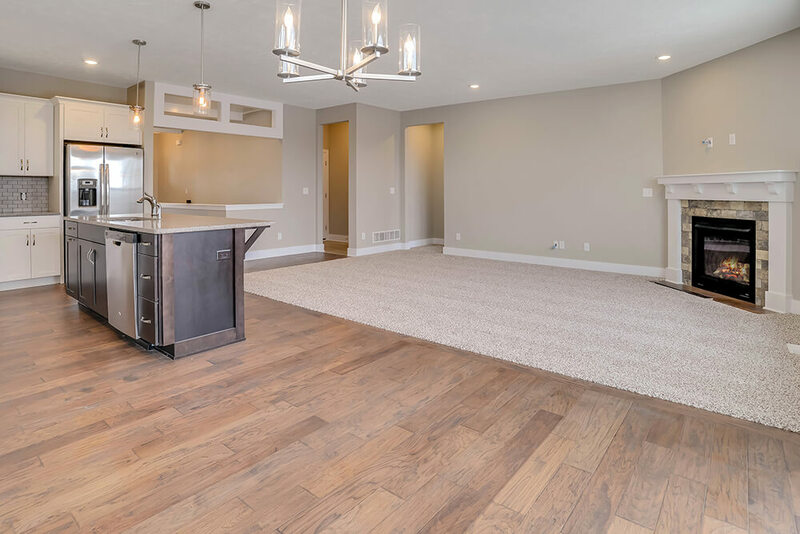 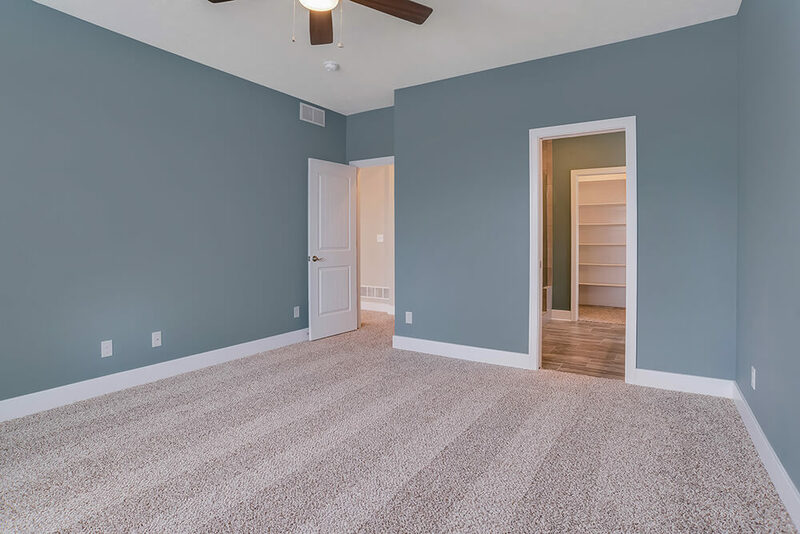 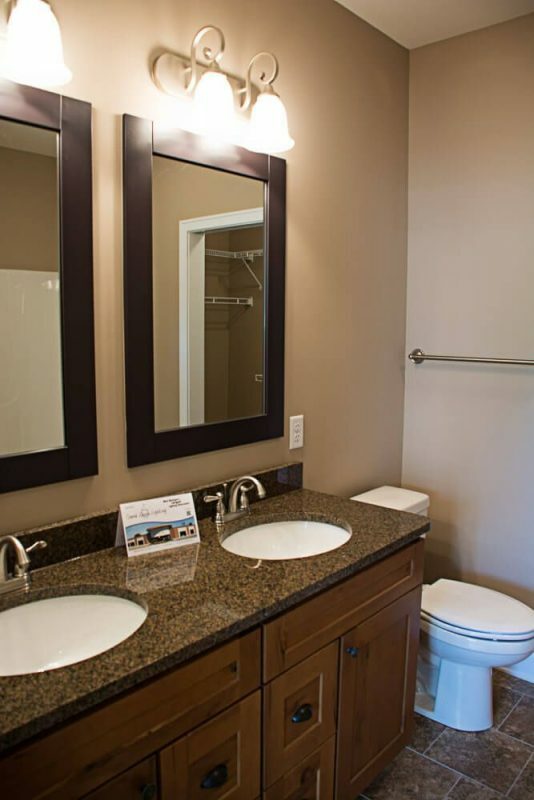 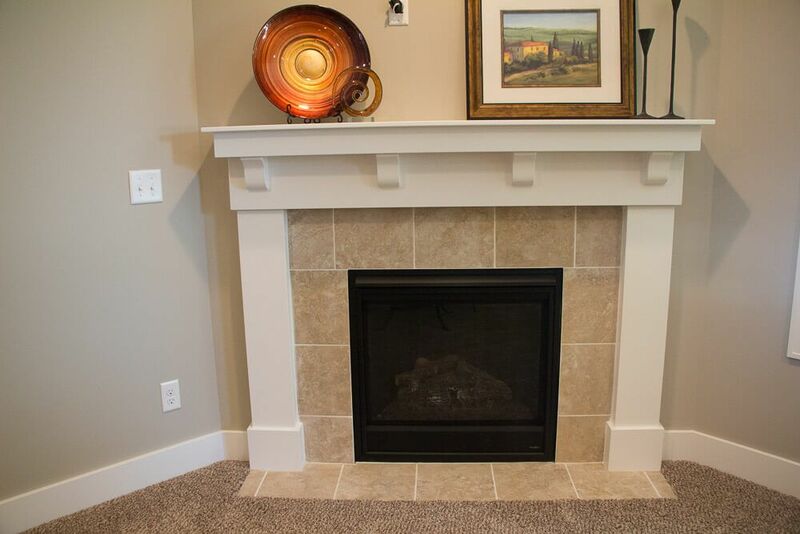 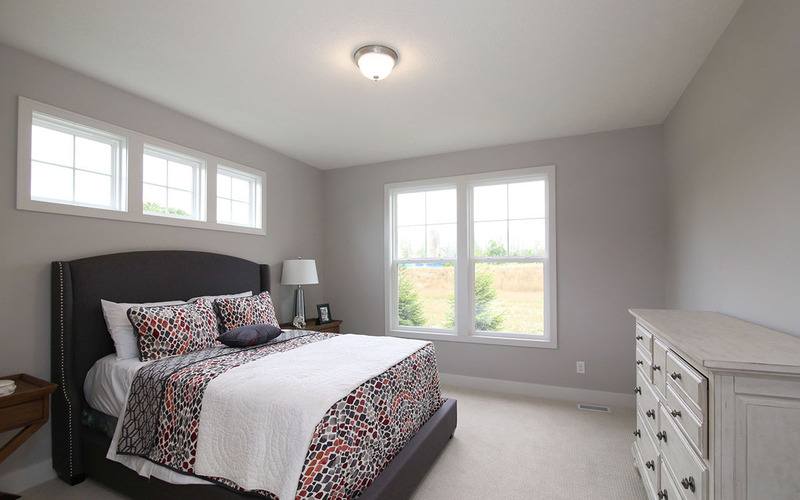 The Aspen’s lower level can be finished to suite your needs with a full bath, second bedroom, and rec room with optional fireplace and built-in shelves. 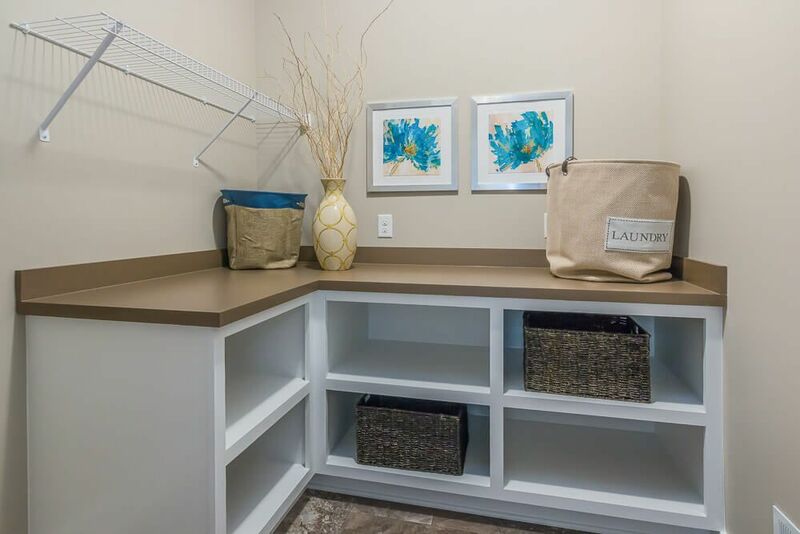 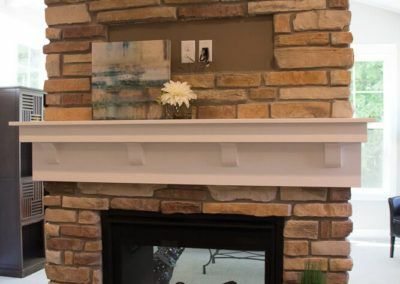 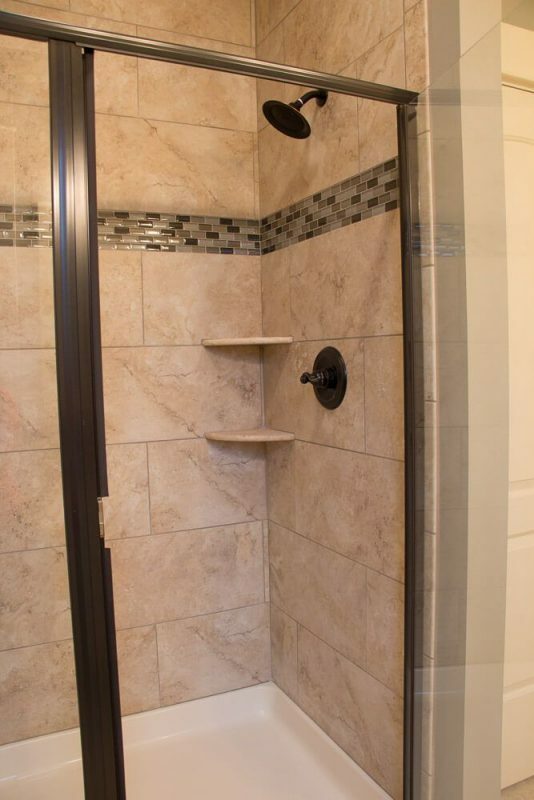 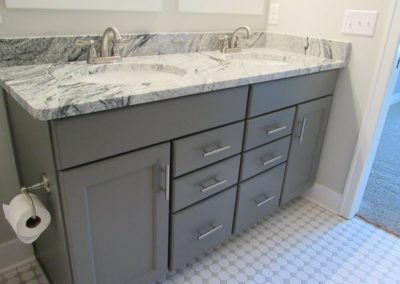 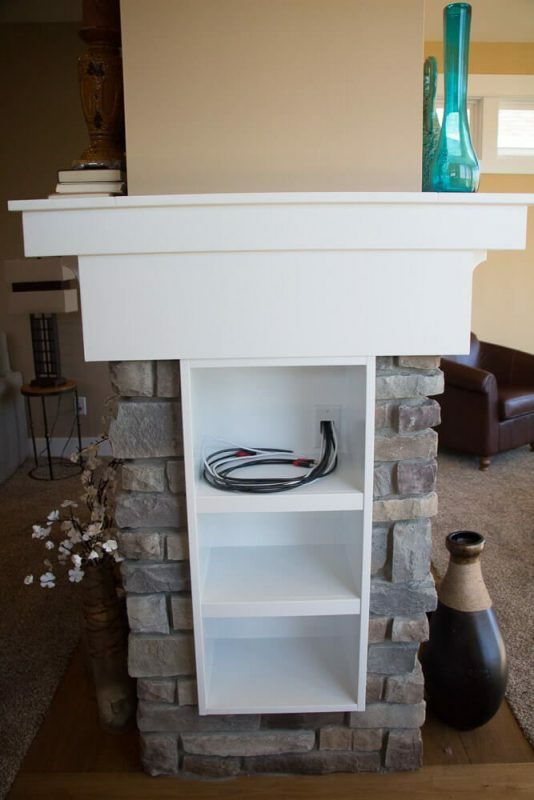 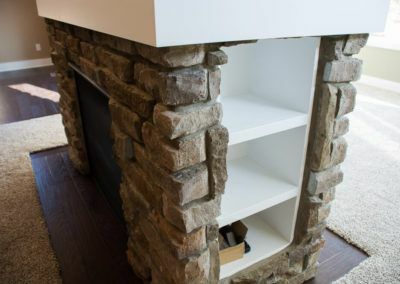 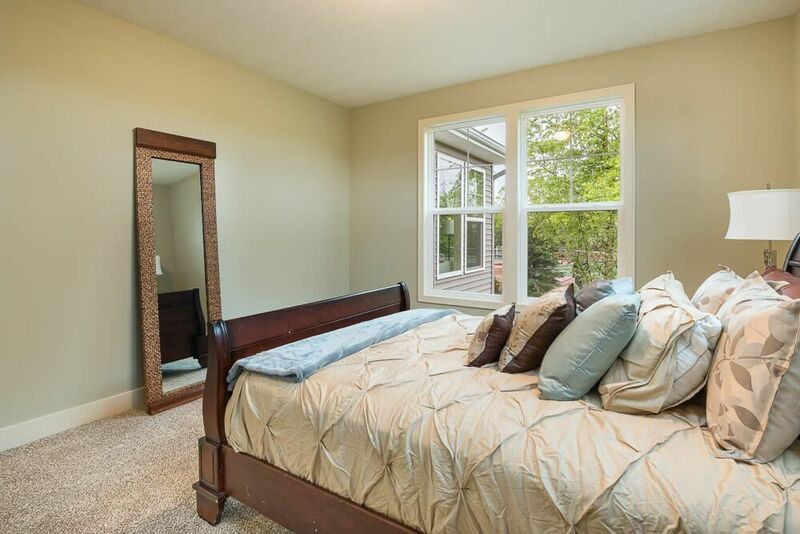 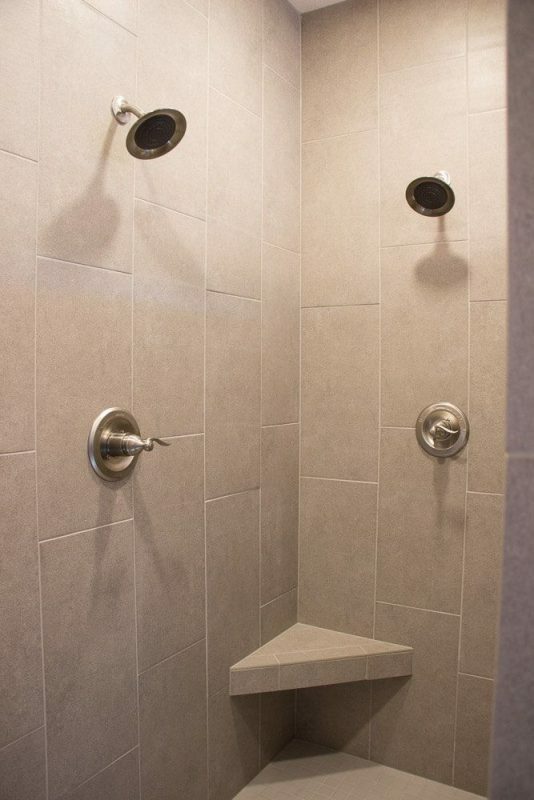 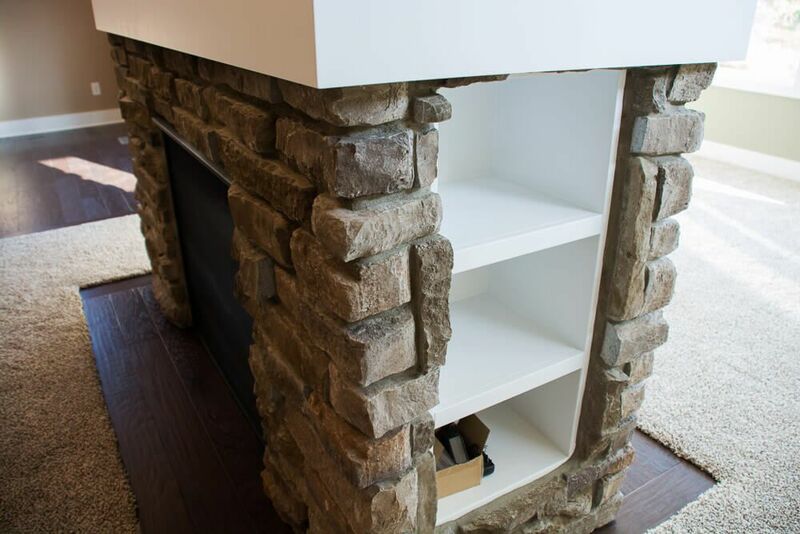 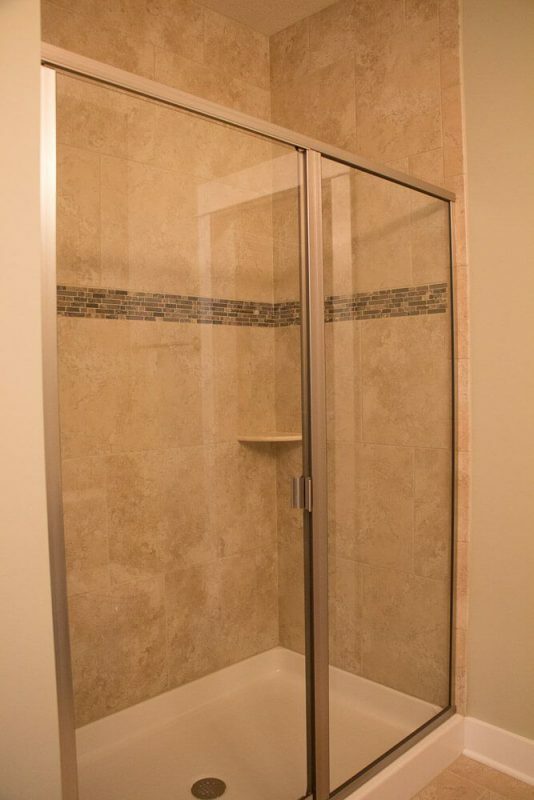 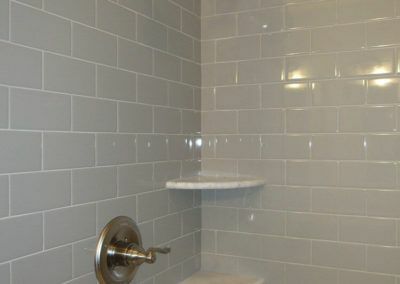 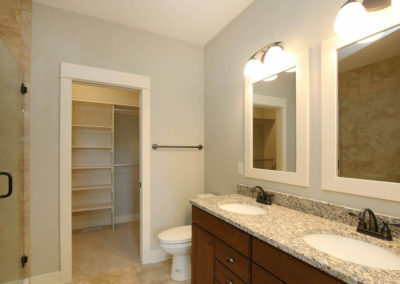 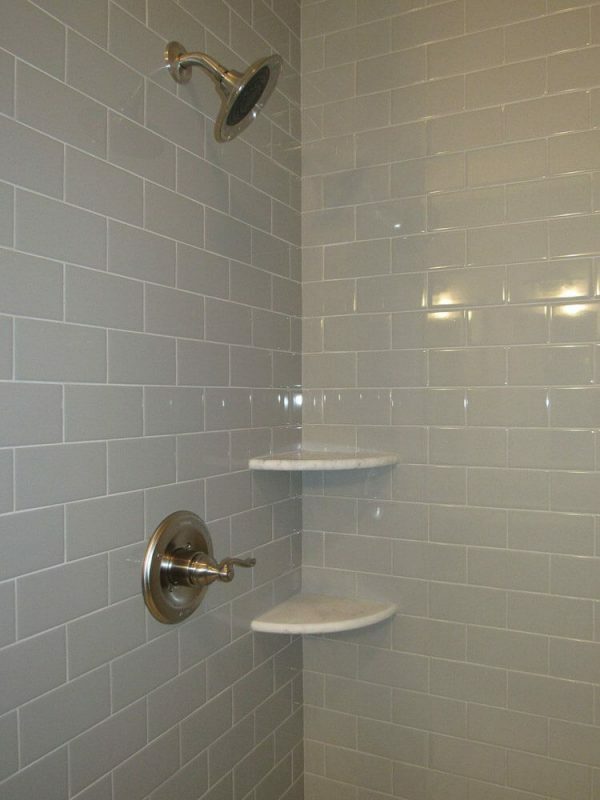 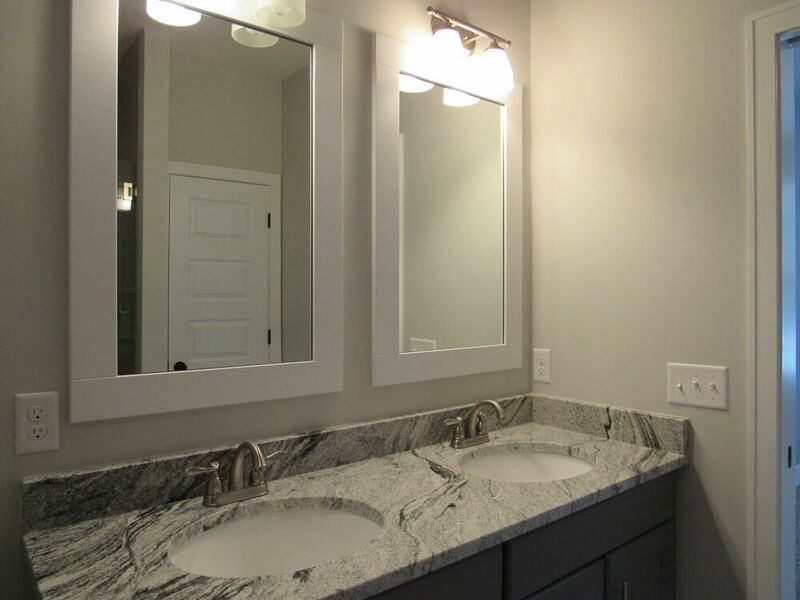 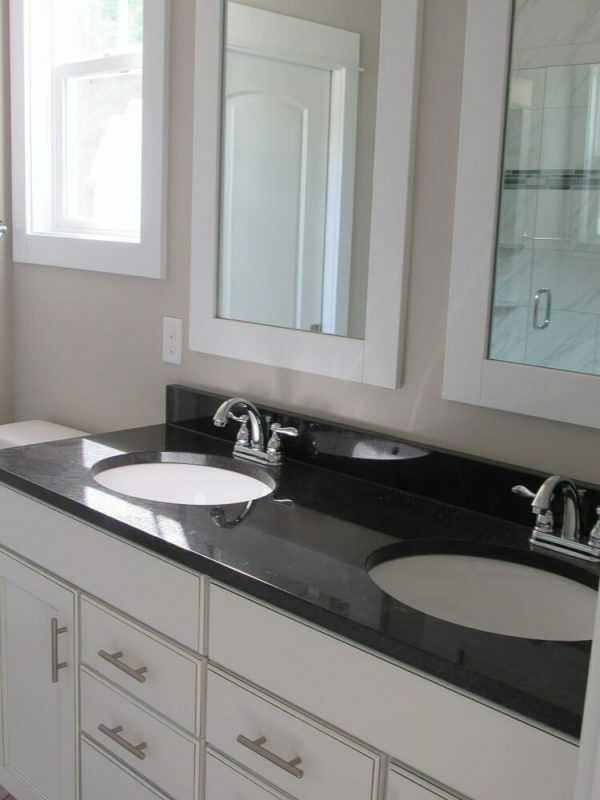 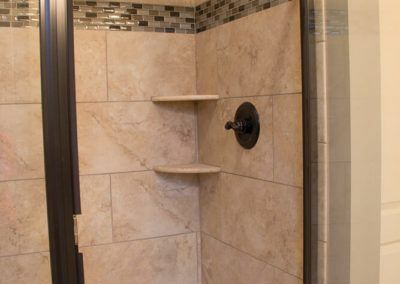 This space allows you to easily incorporate your own touches to create a home that complements your lifestyle. 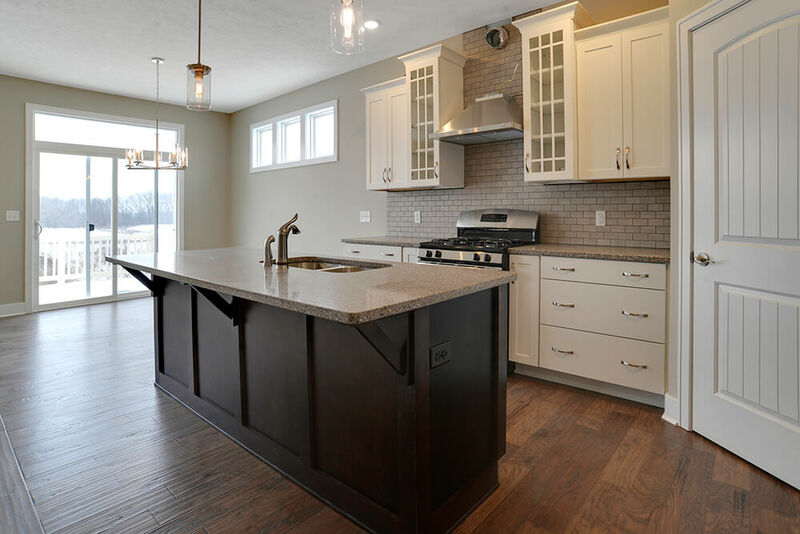 Eastbrook takes great pride in designing and building homes of uncompromising quality and value, and the Aspen is no exception. 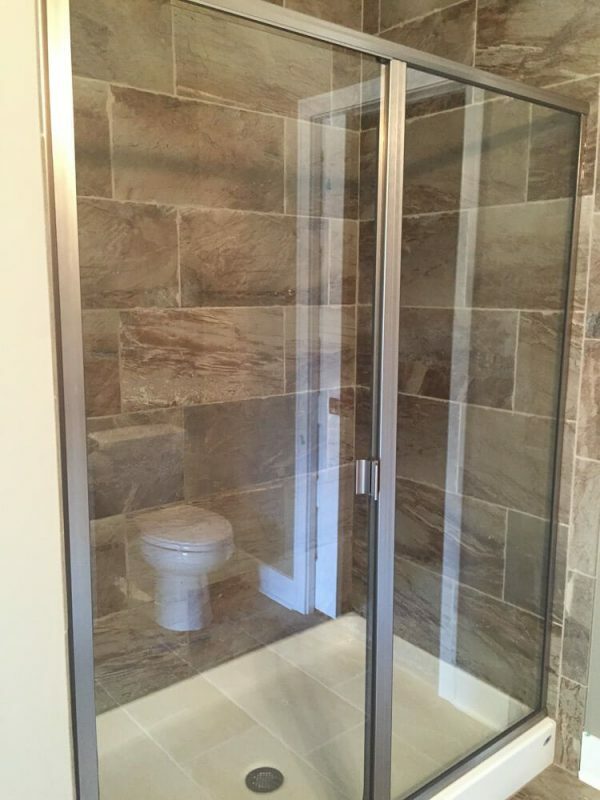 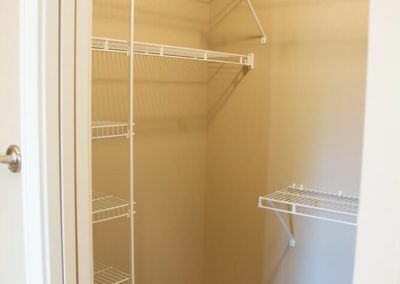 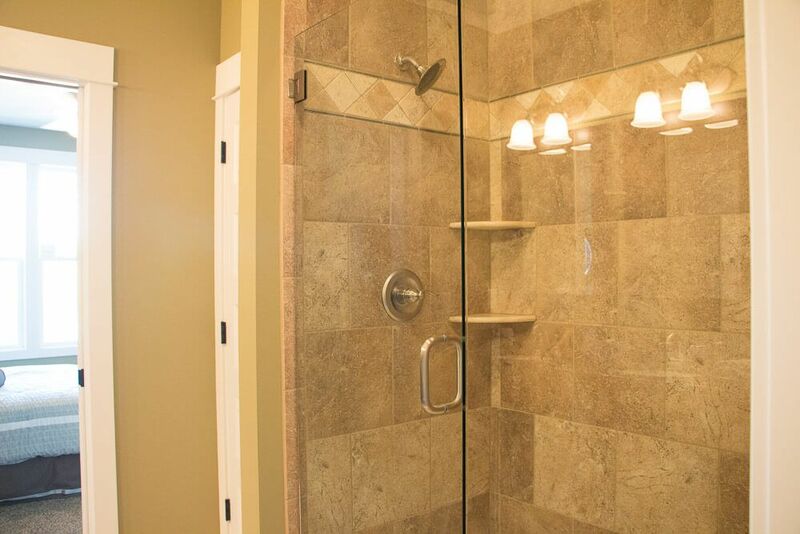 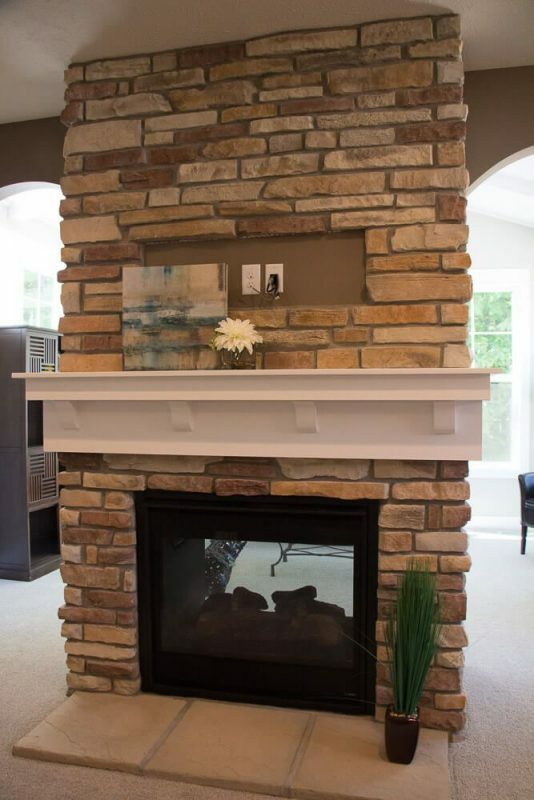 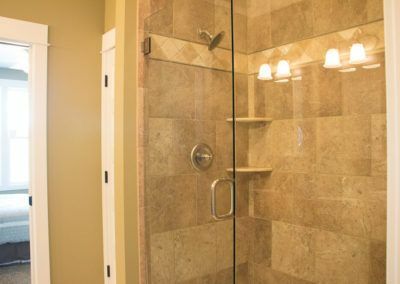 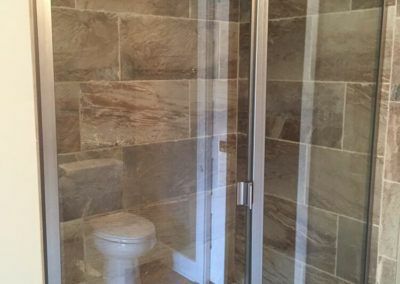 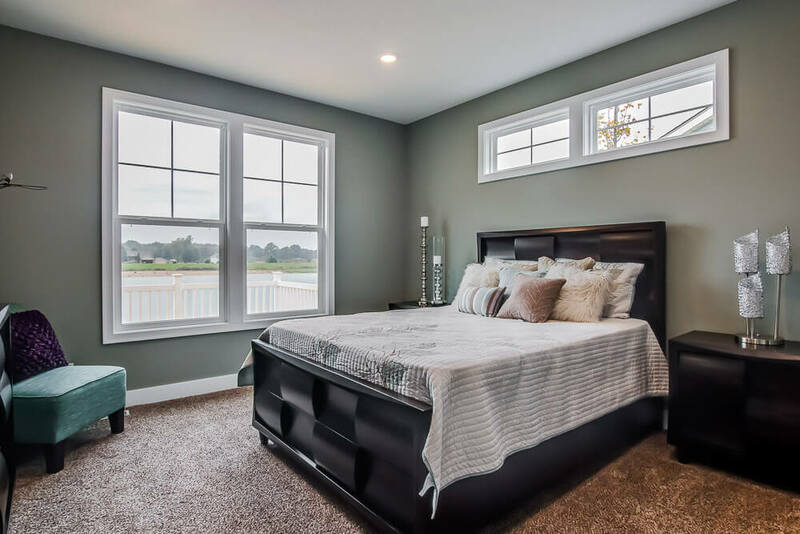 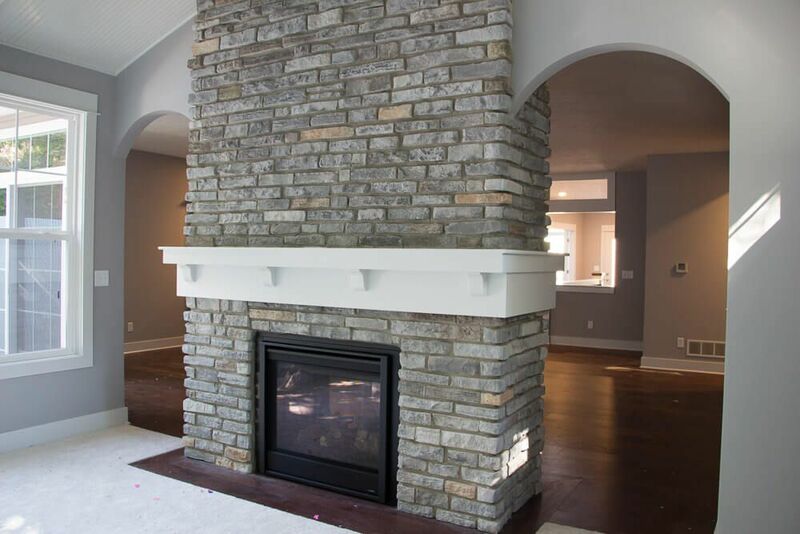 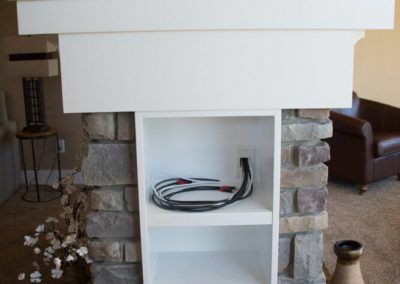 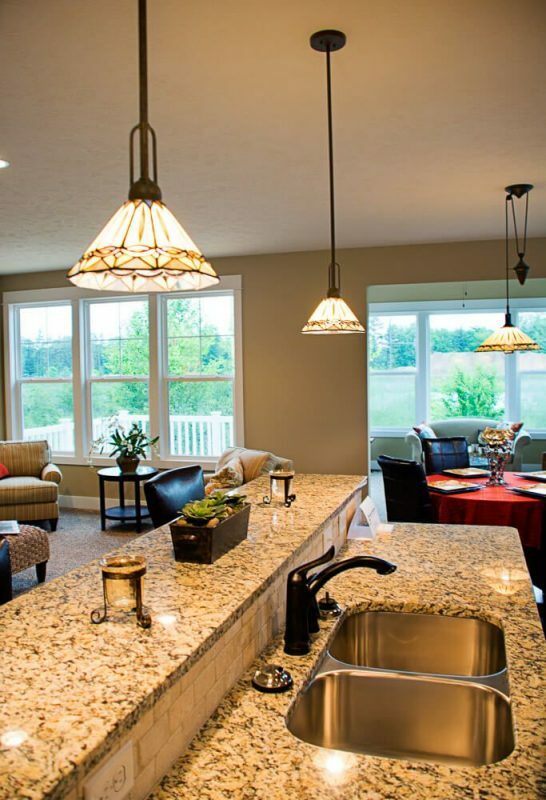 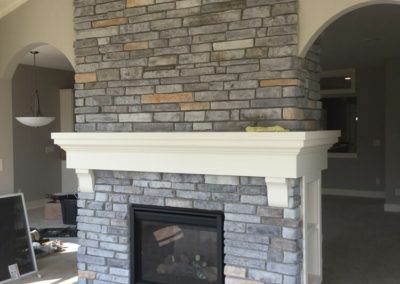 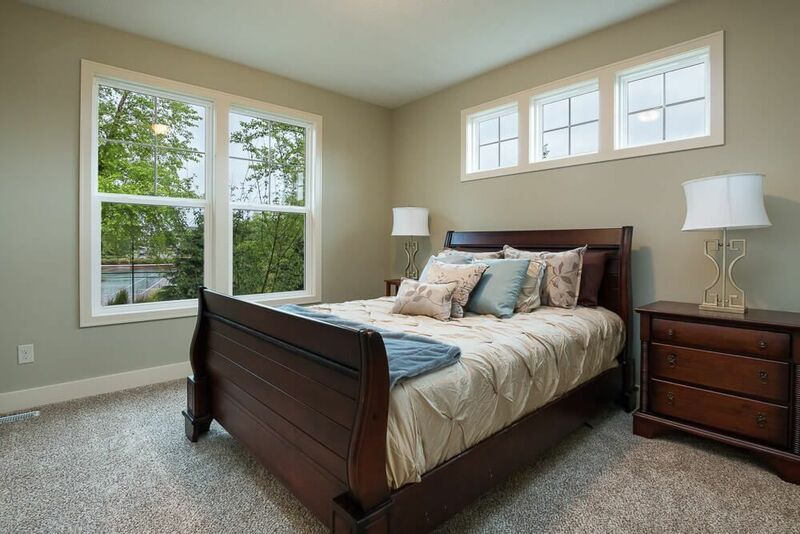 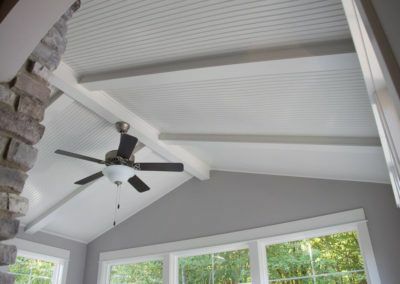 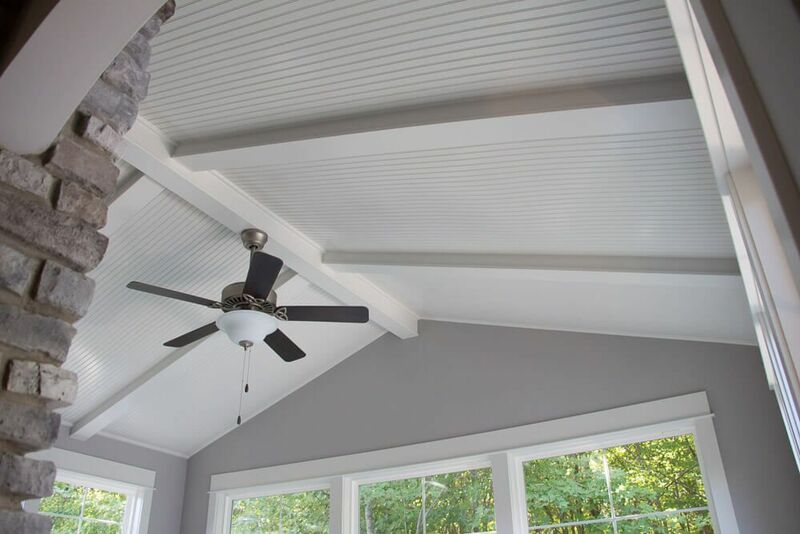 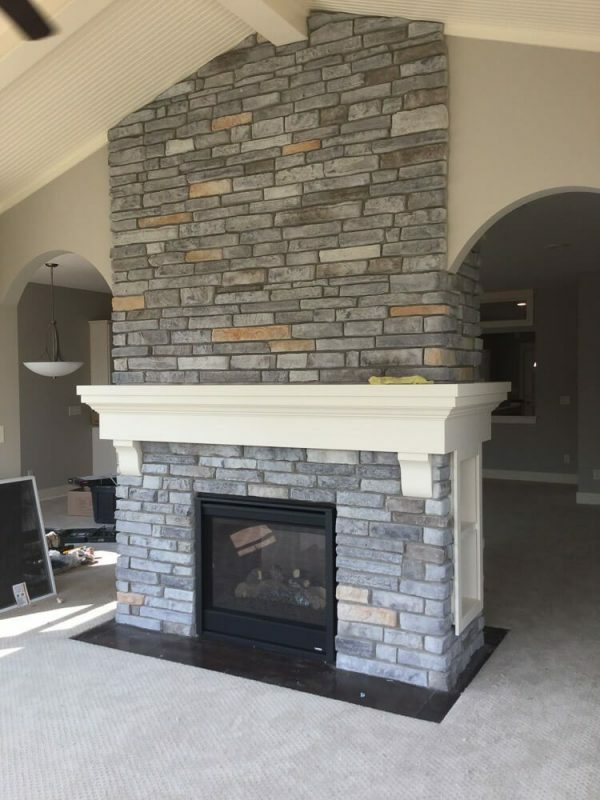 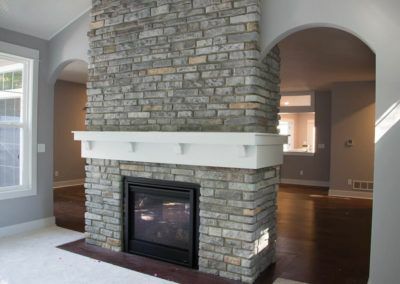 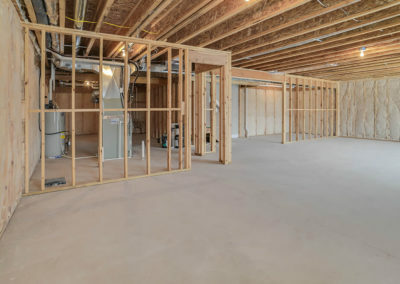 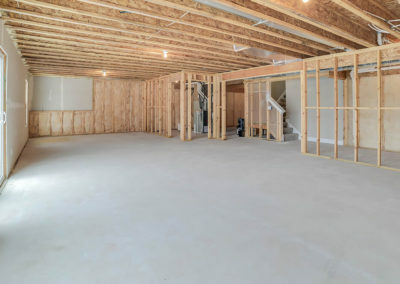 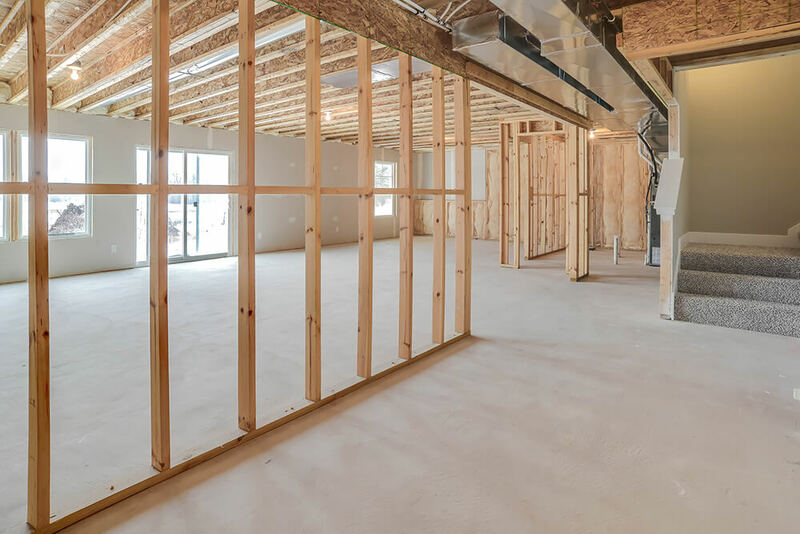 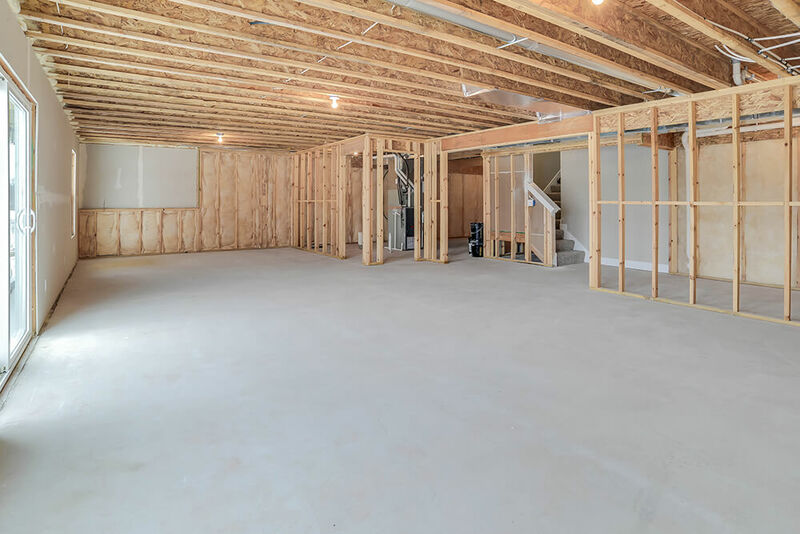 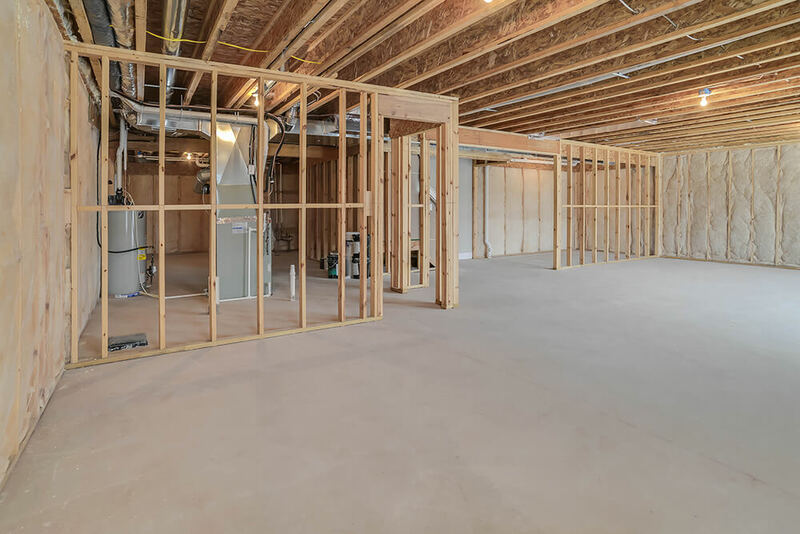 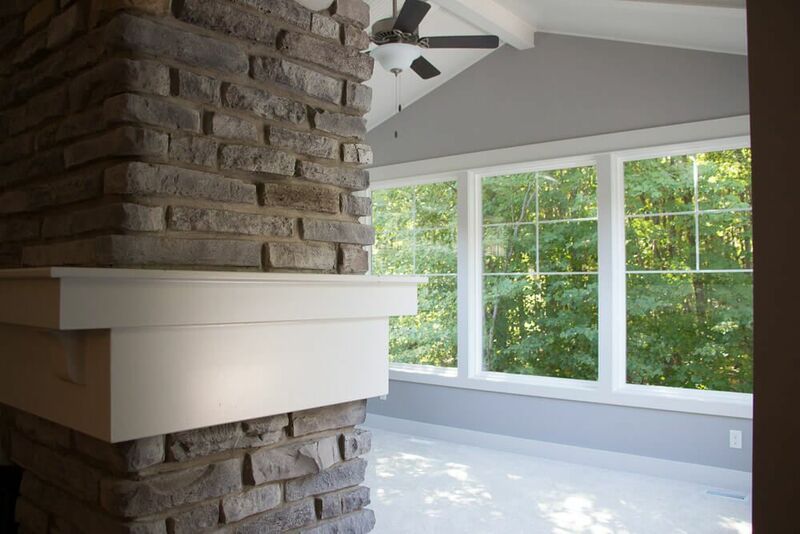 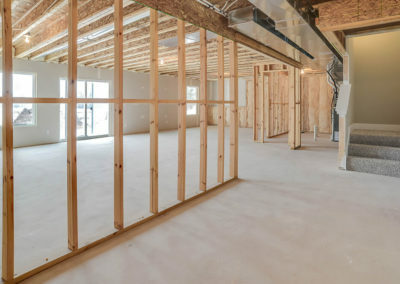 Your new home will be built to a standard of quality and energy efficiency that will provide you with comfort and value for many years to come.